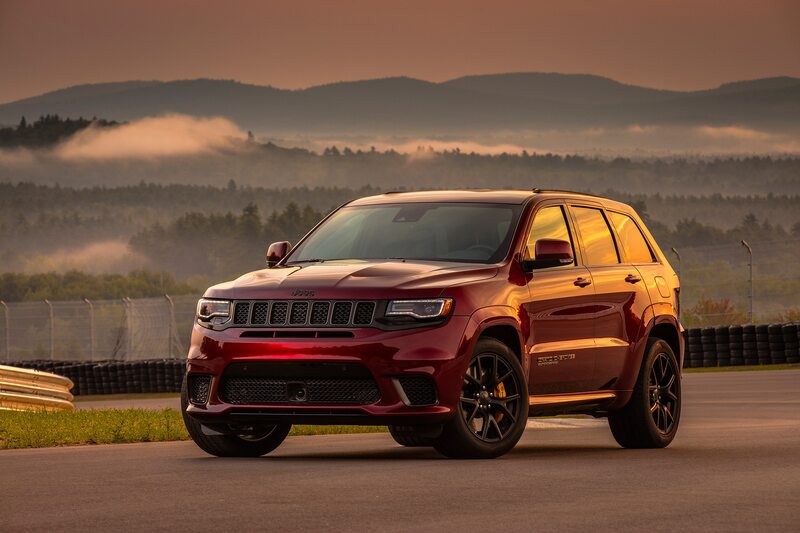 Nothing if not responsive to customer concerns, Jeep hopes 707 hp, 645 lb-ft, and 0 to 60 mph in 3.5 seconds will help satisfy the alleged pent-up demand for a sport utility vehicle that will do 180 mph. 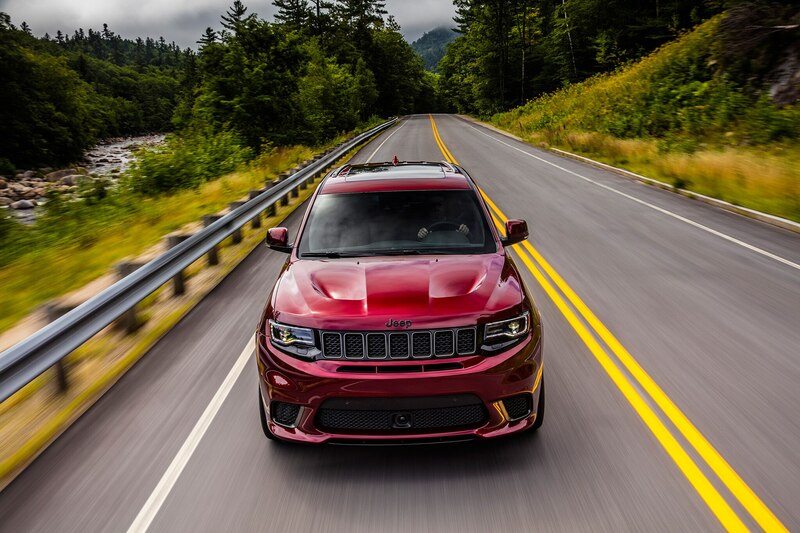 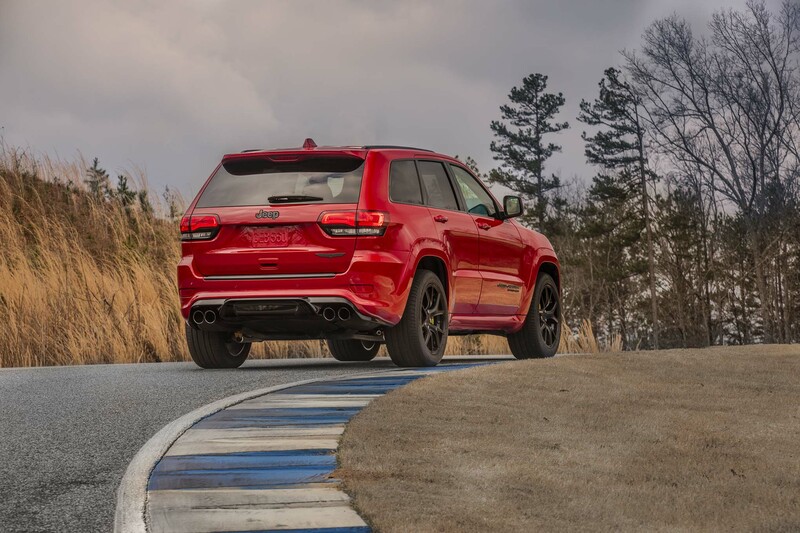 After driving the 2018 Jeep Grand Cherokee Trackhawk, we suspect it will. 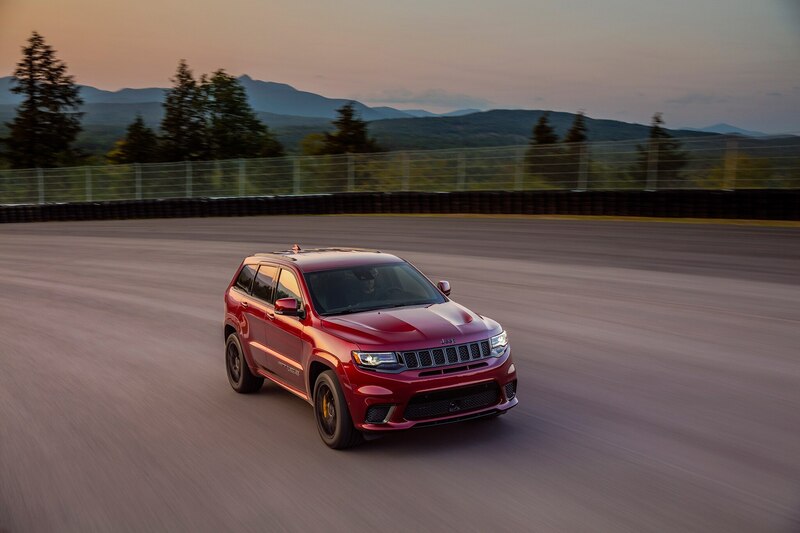 We knew, of course, the Trackhawk was coming. 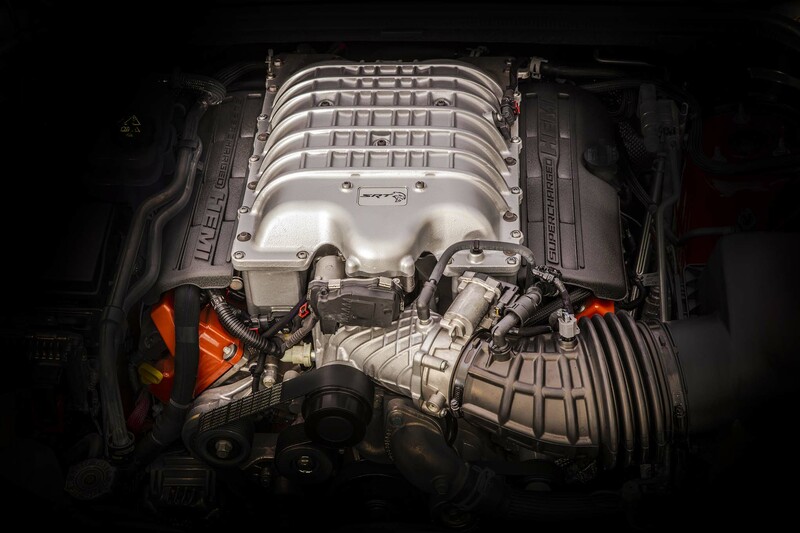 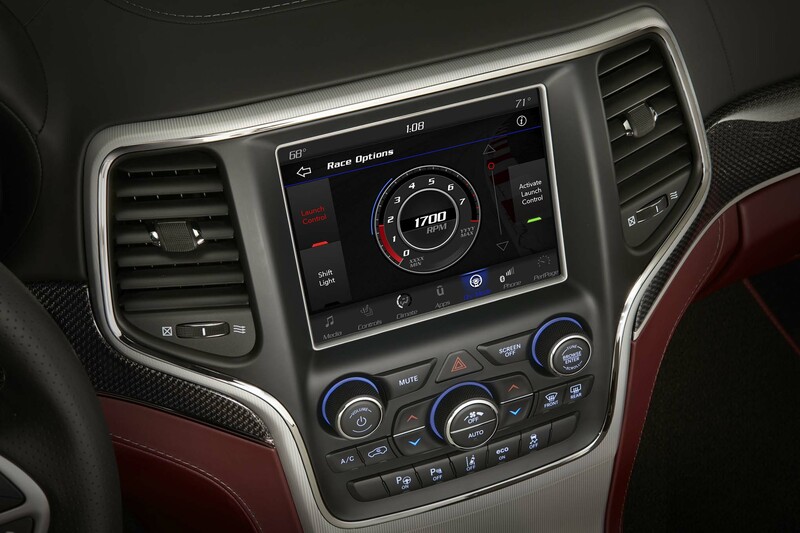 We should have known—back when we first experienced the Dodge Challenger and Charger Hellcats—that SRT, home of Chrysler’s performance wizards, couldn’t wait to find other outlets for the 6.2-liter supercharged Hemi V-8. 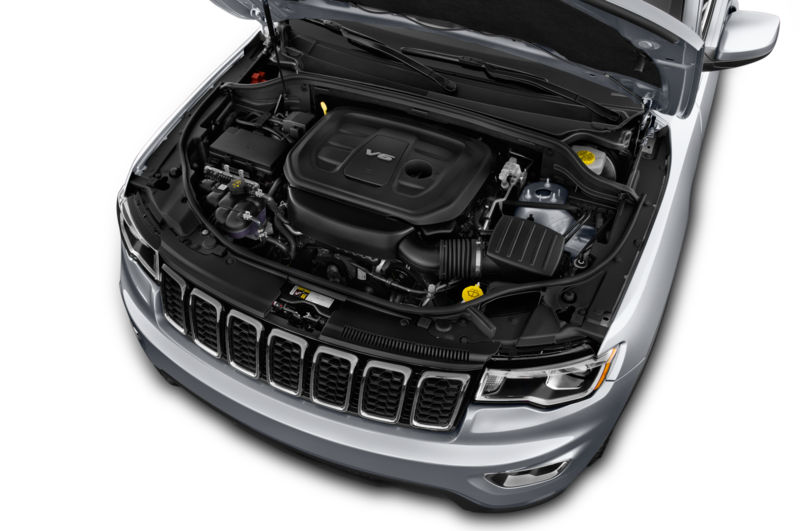 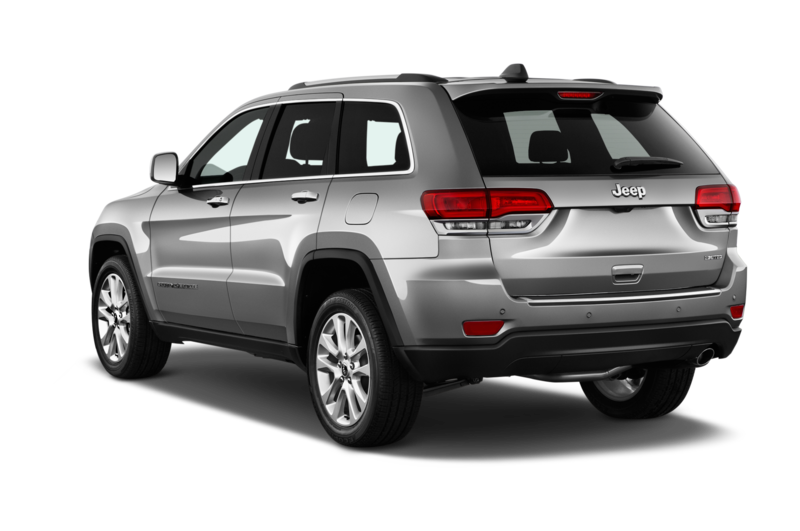 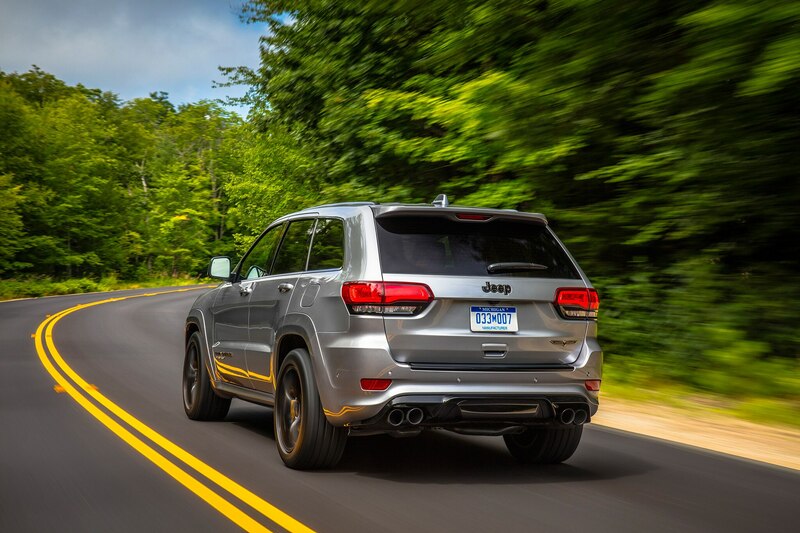 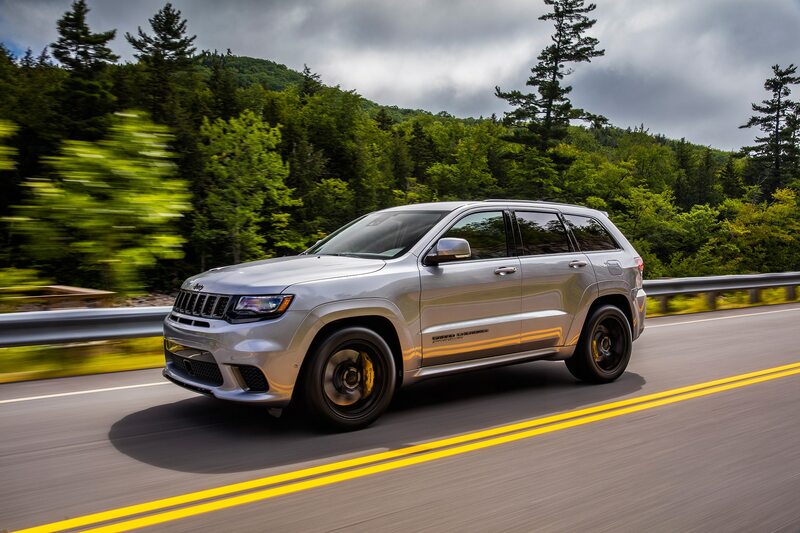 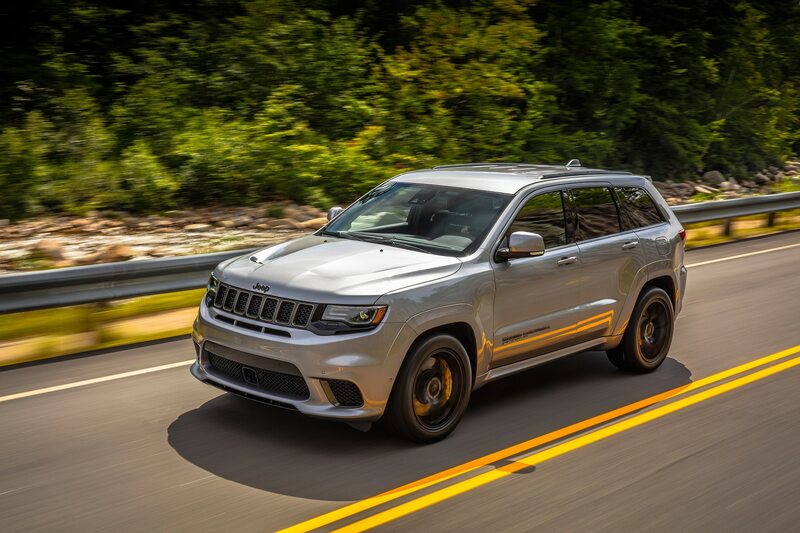 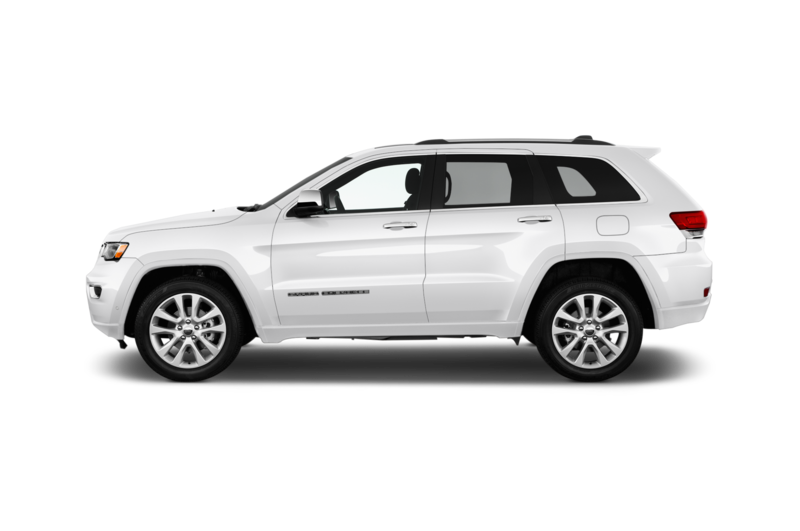 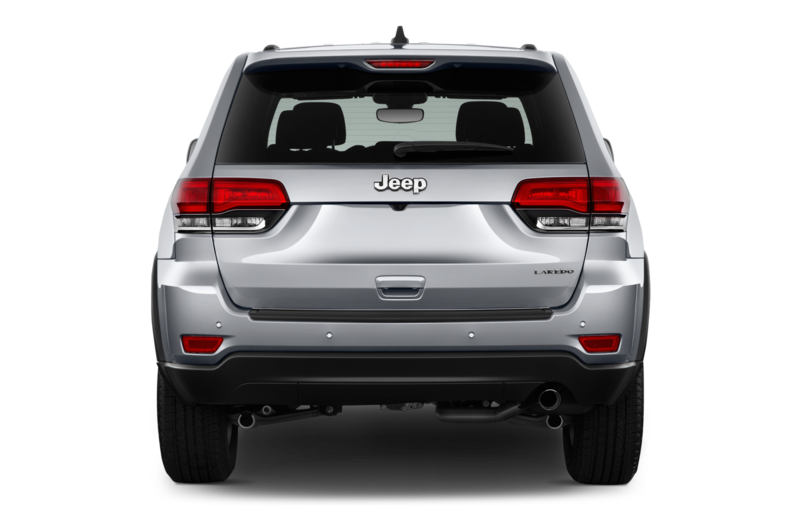 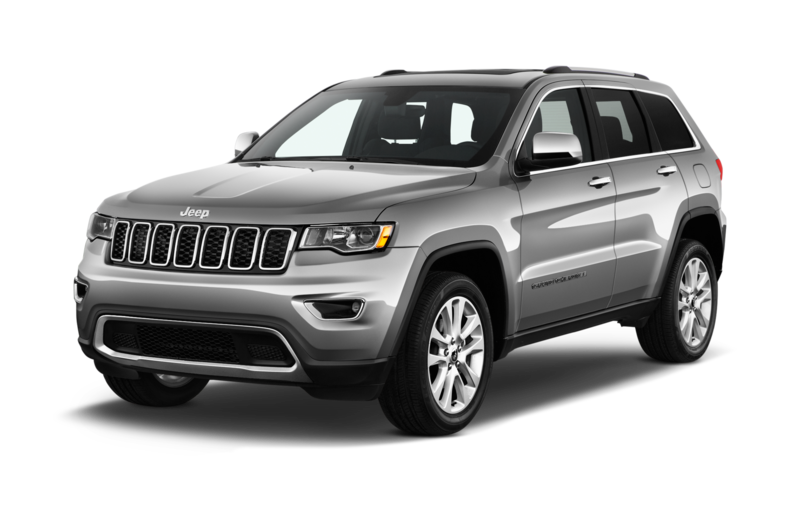 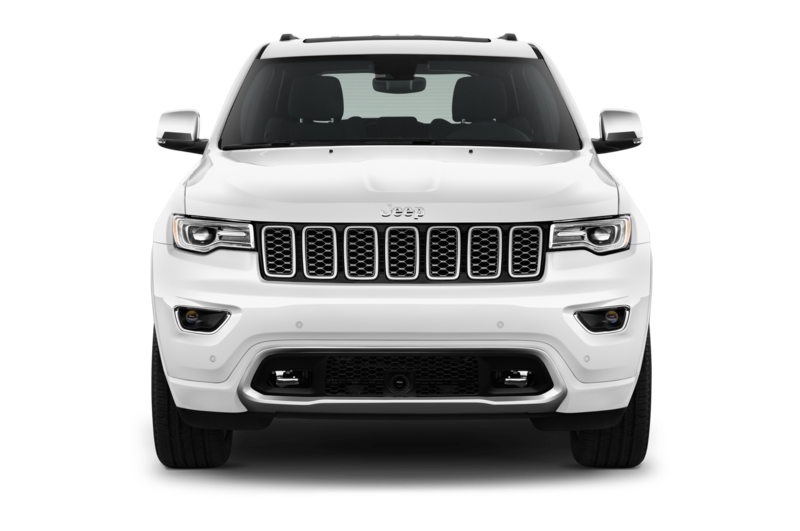 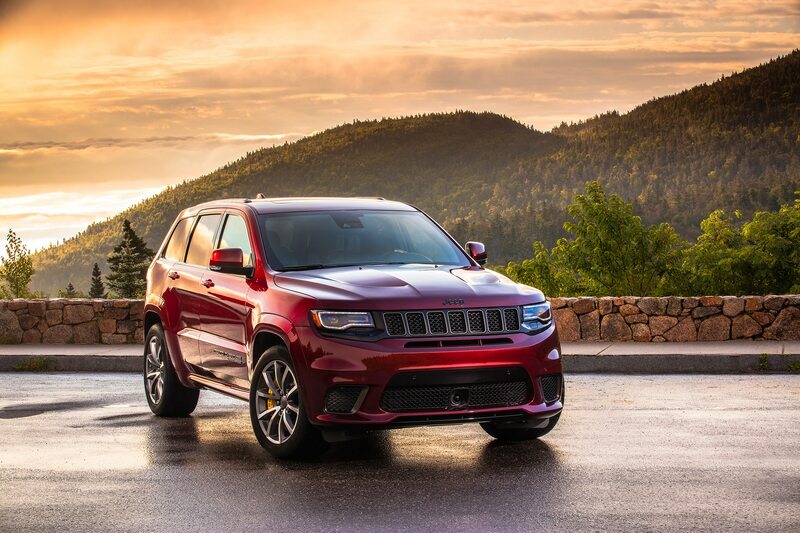 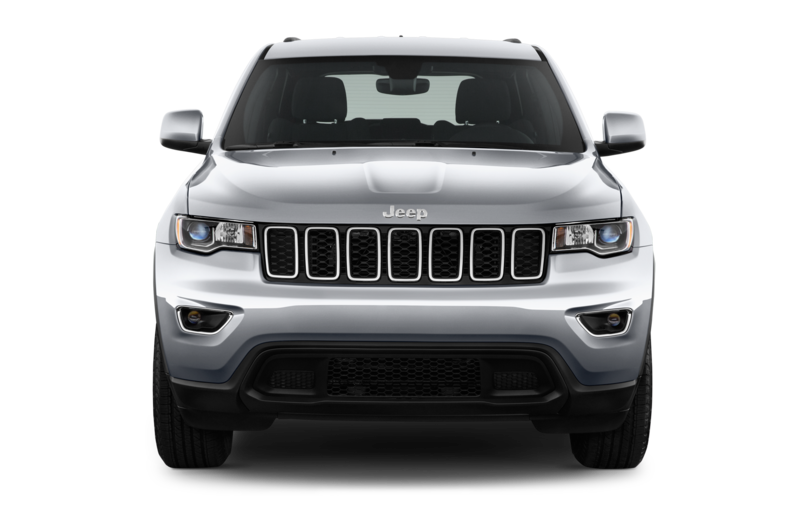 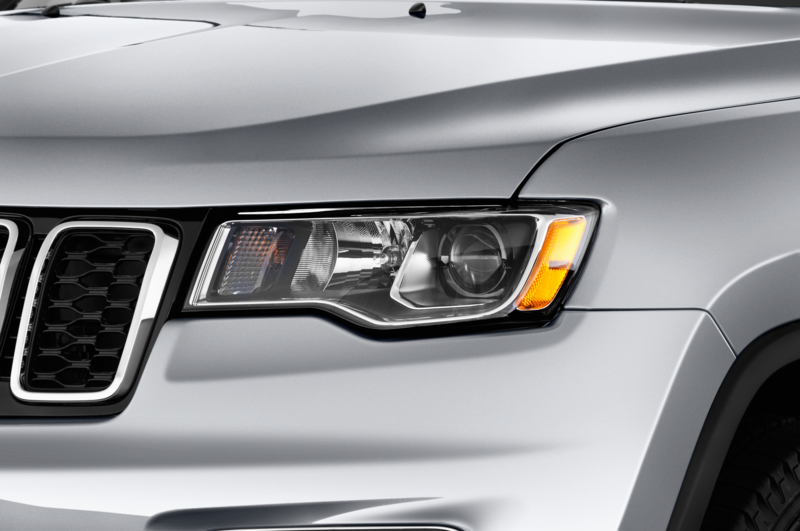 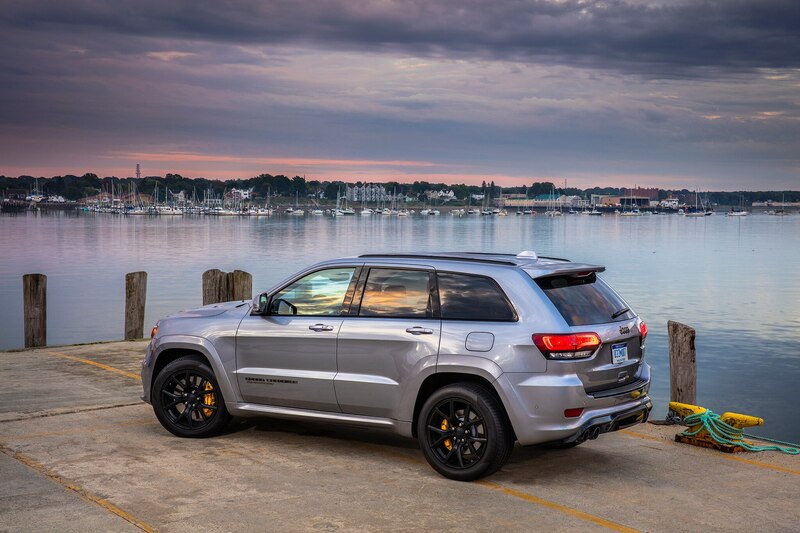 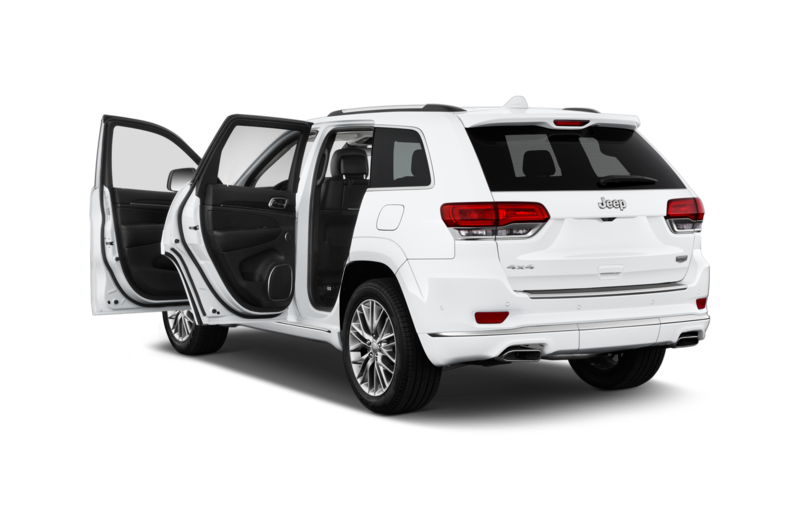 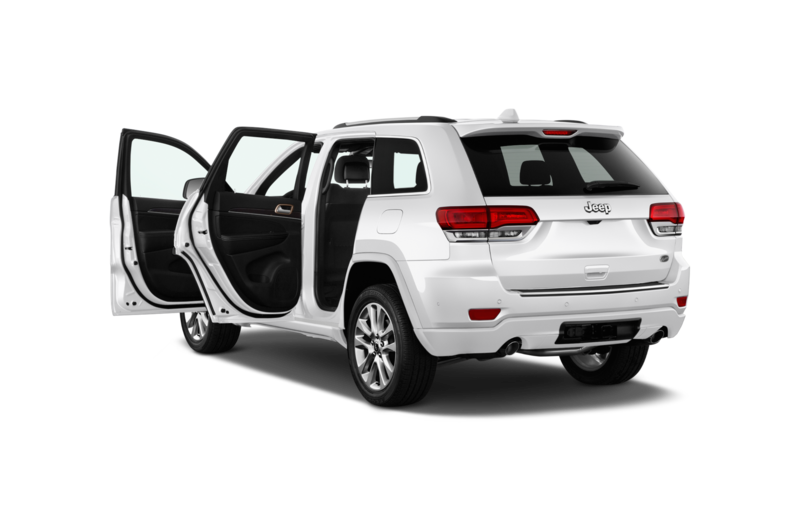 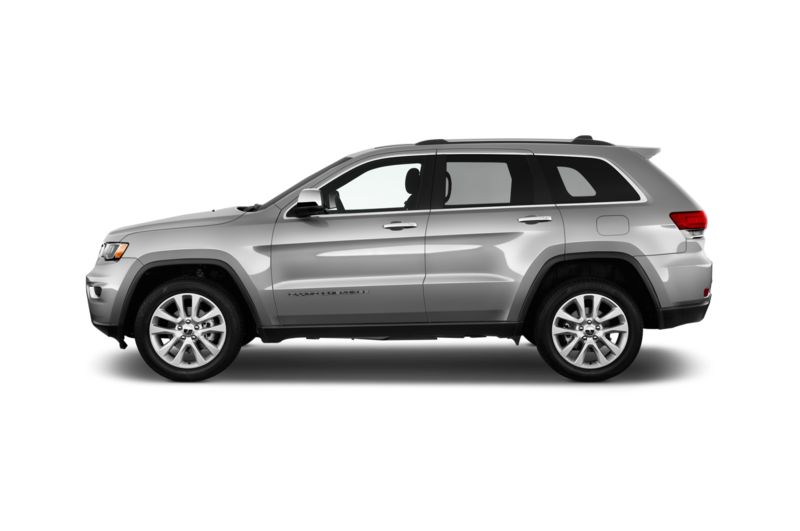 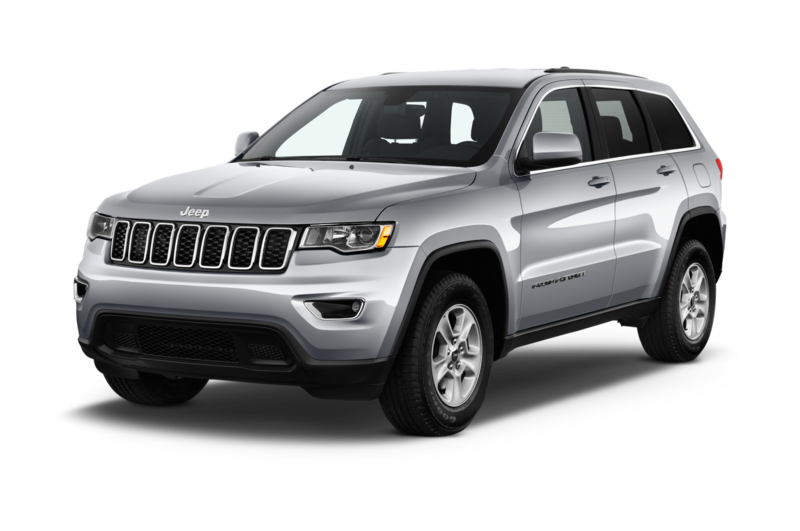 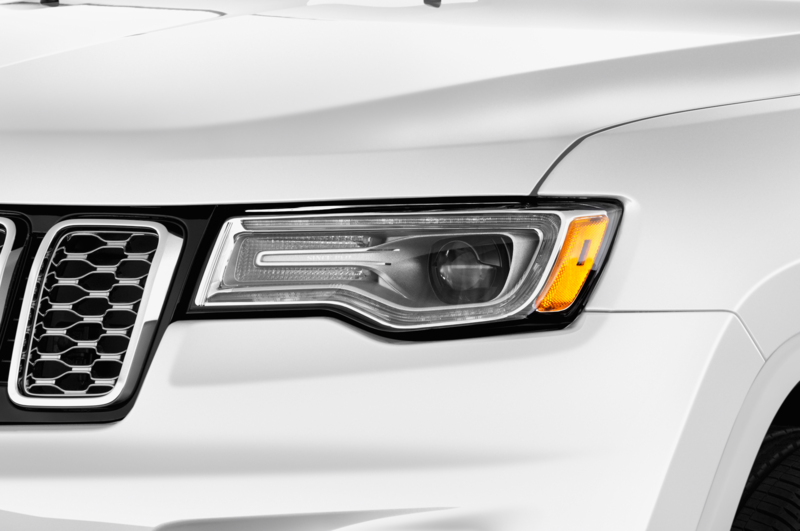 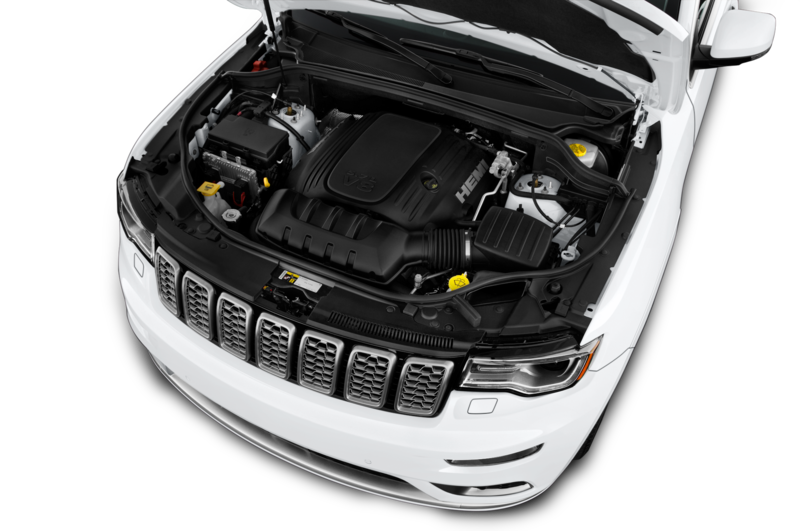 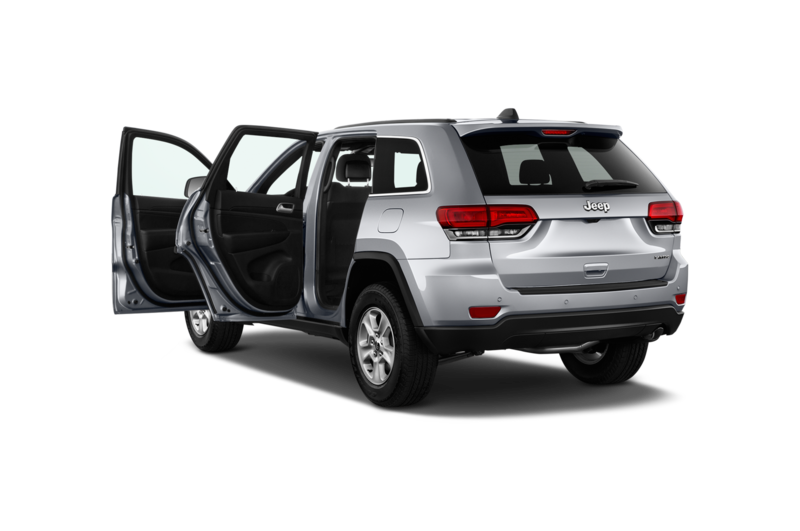 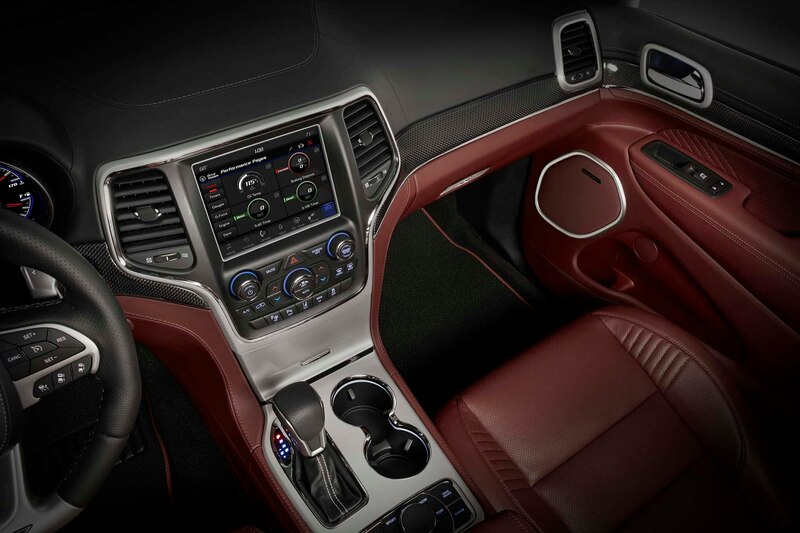 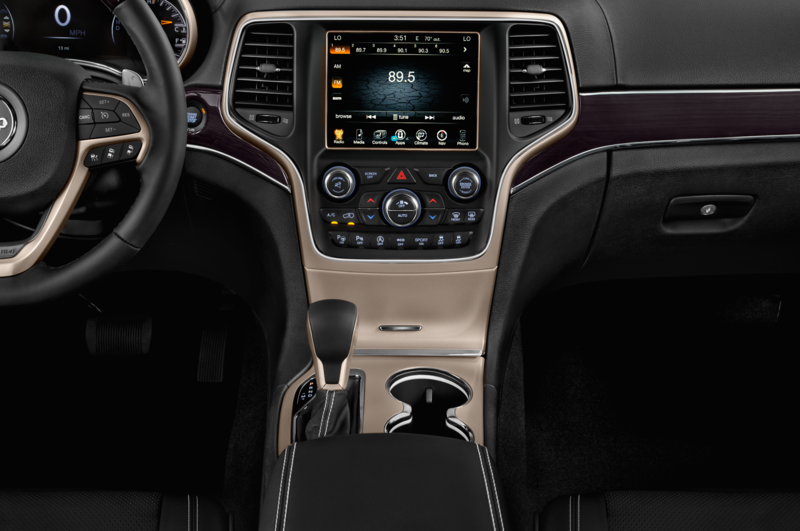 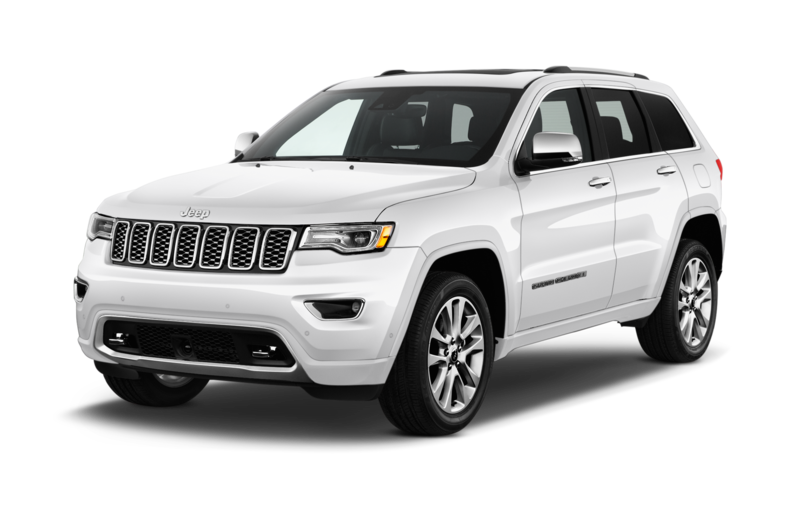 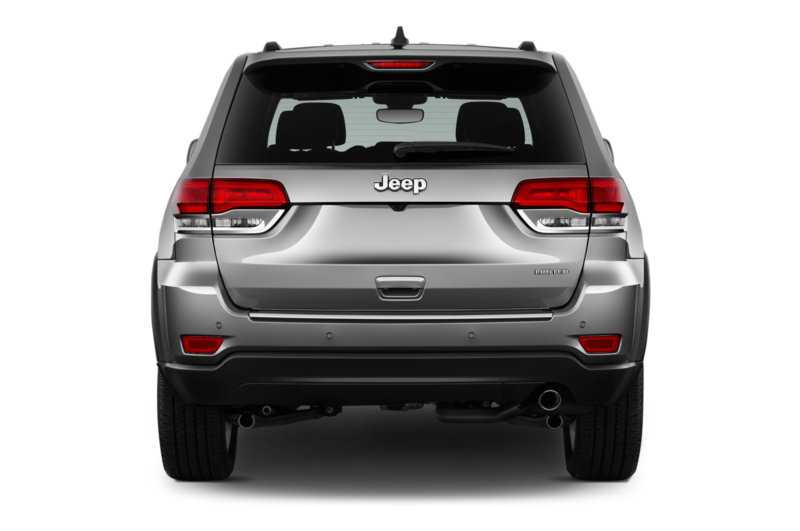 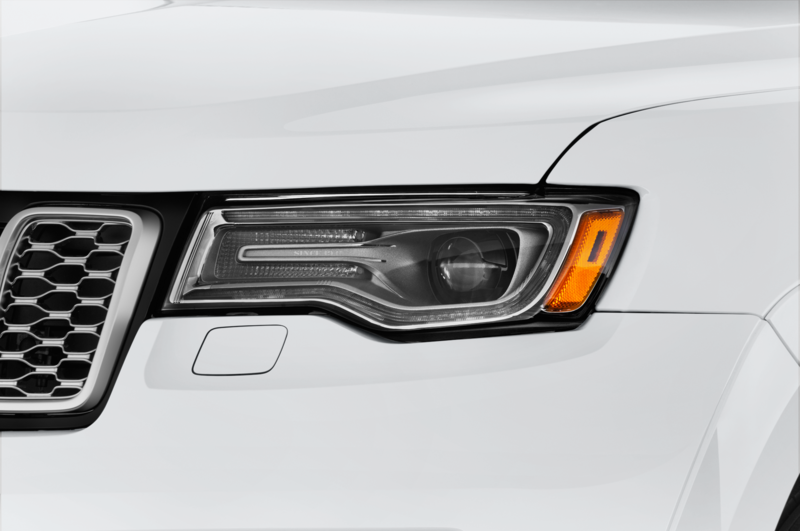 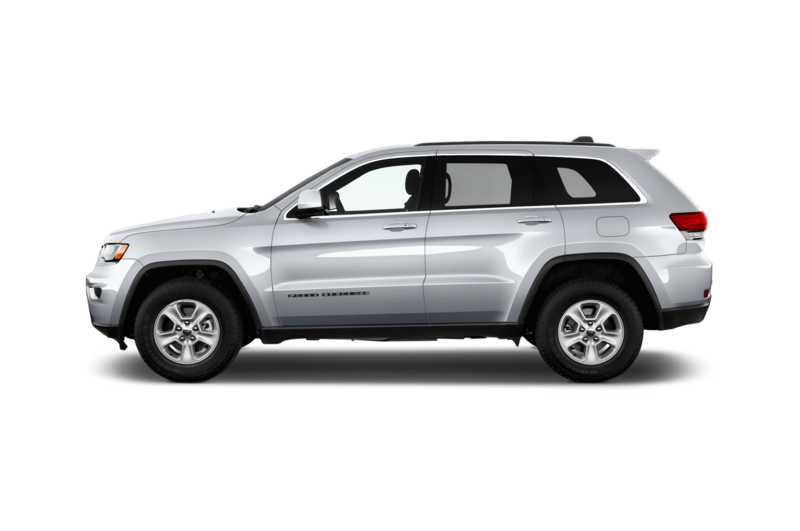 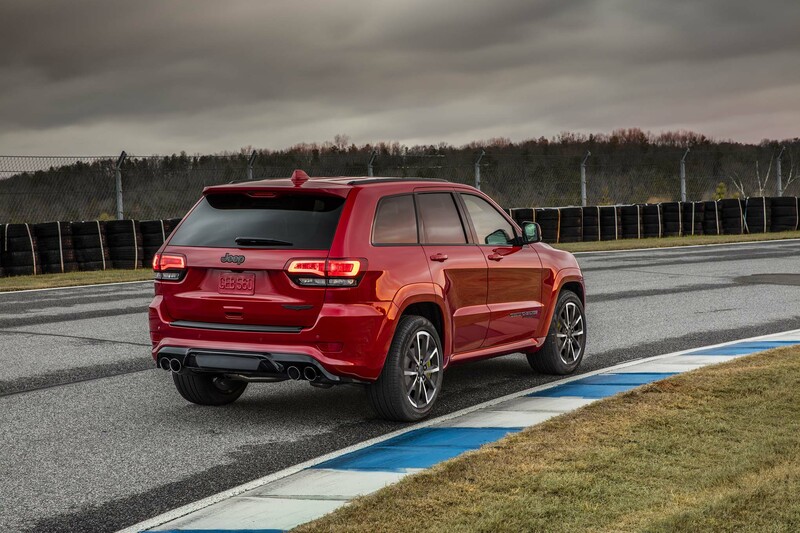 And we can now finally tell you that the Jeep Grand Cherokee makes a good home for the engine, as well as the new Torqueflite 8HP95 eight-speed automatic transmission, making its first appearance anywhere. 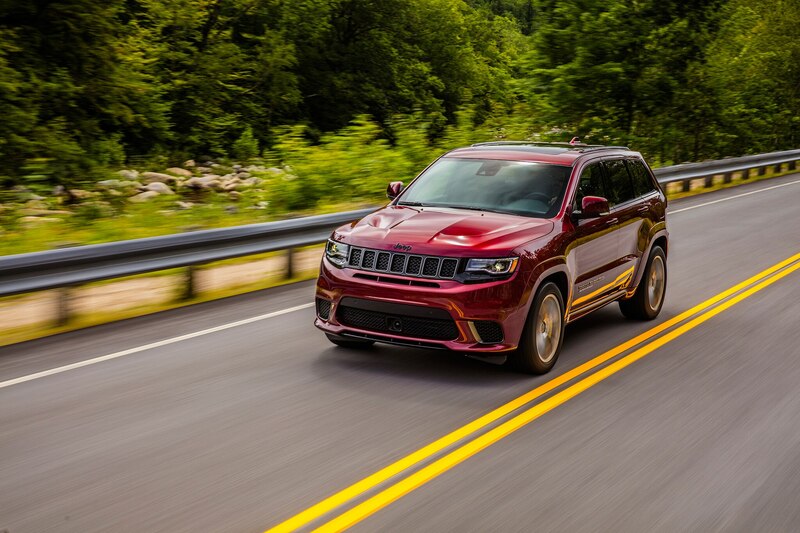 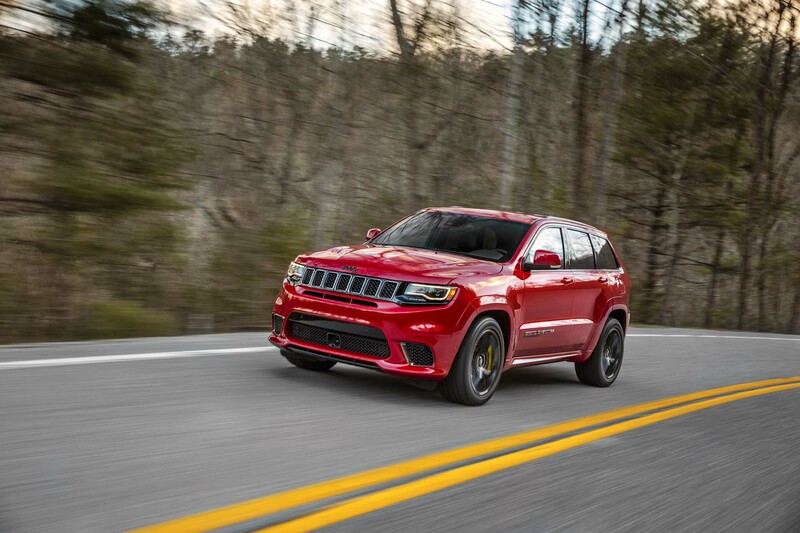 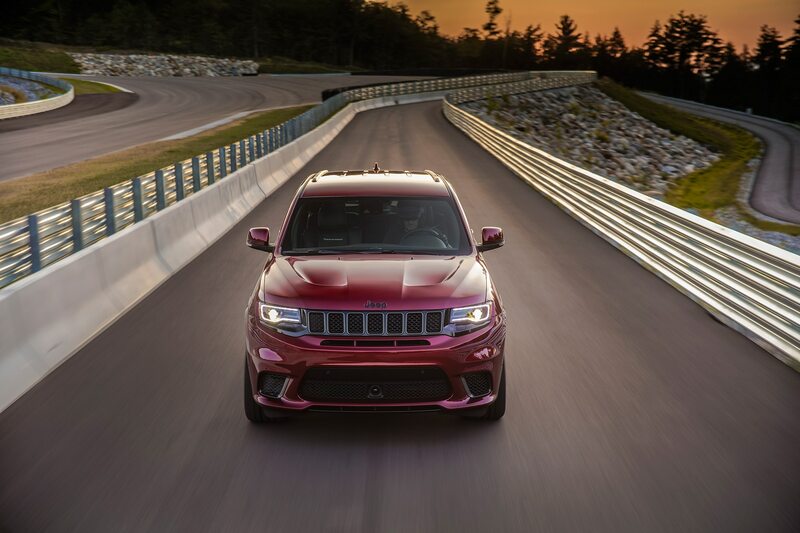 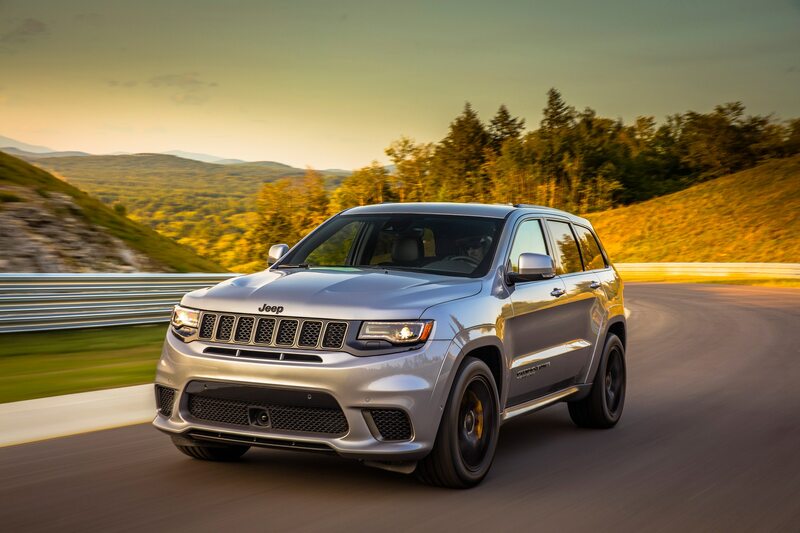 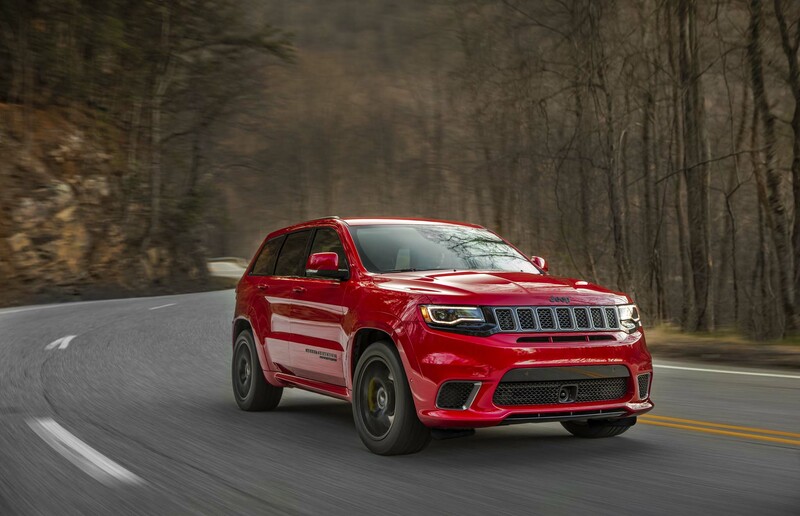 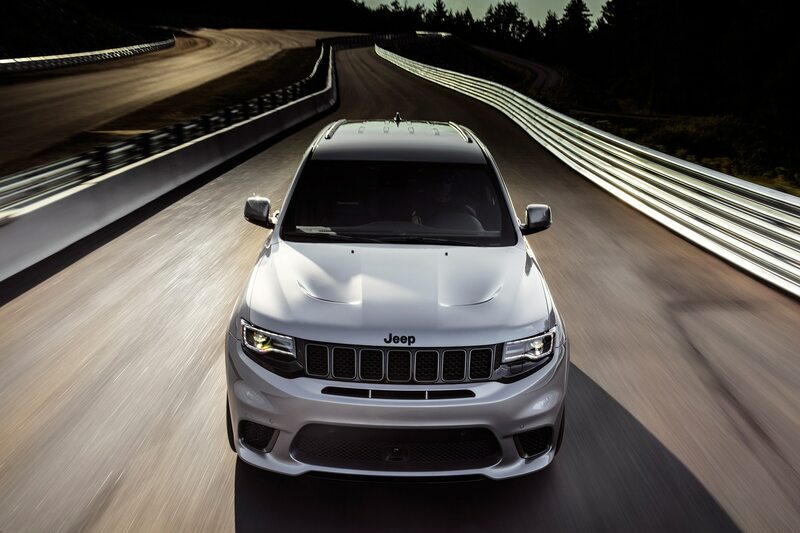 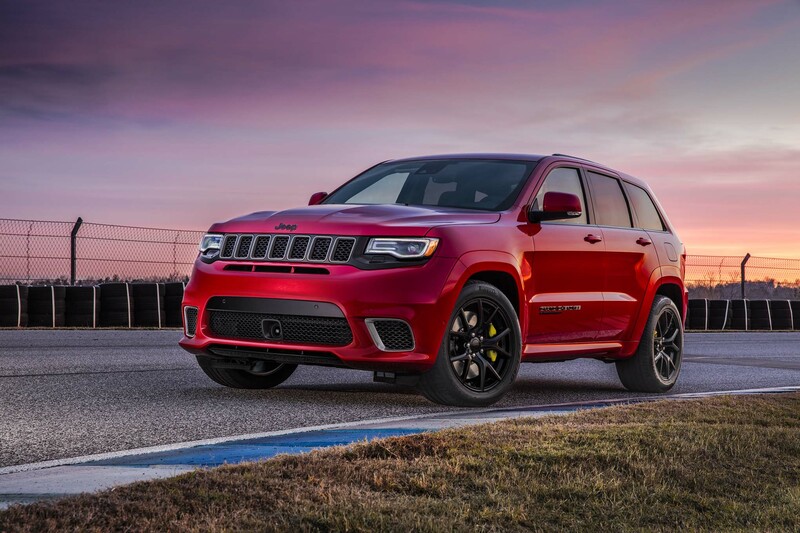 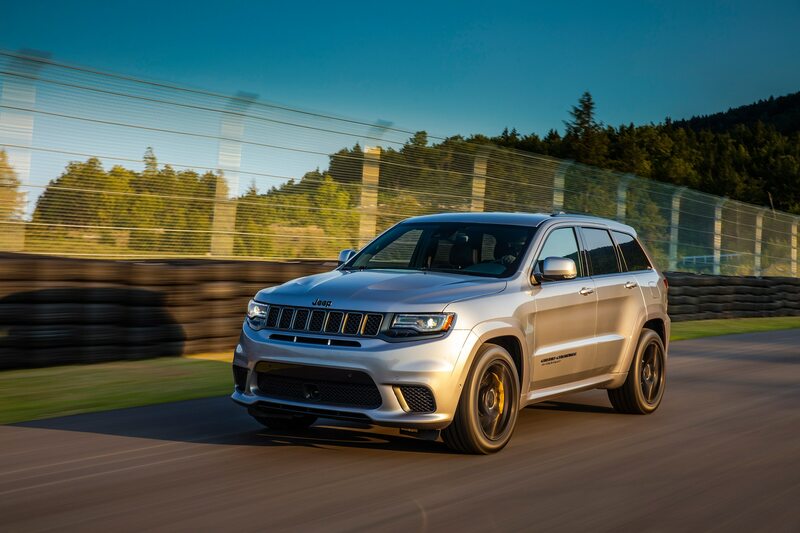 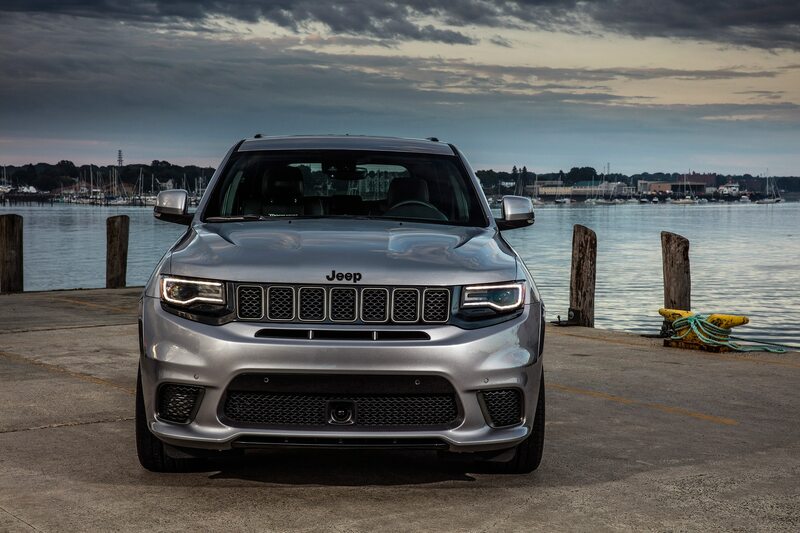 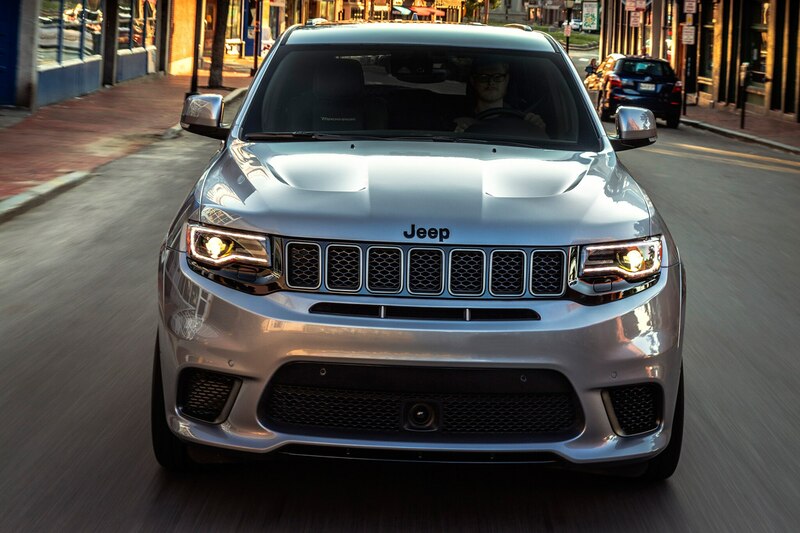 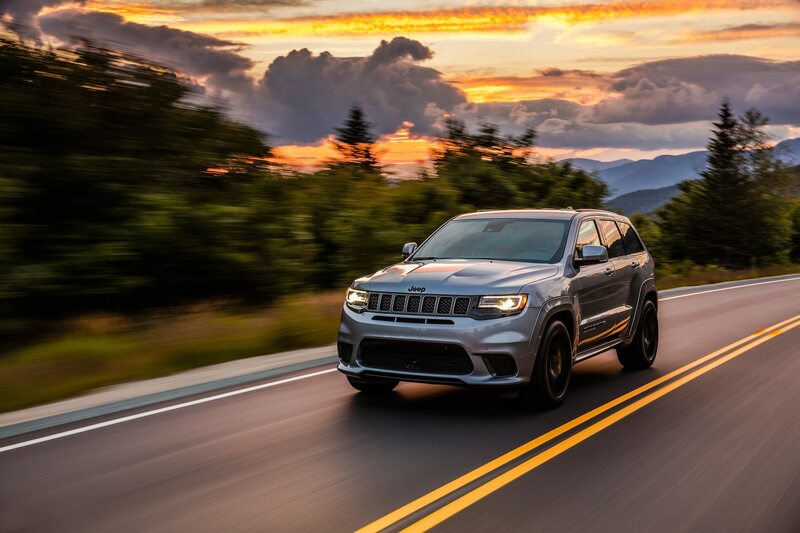 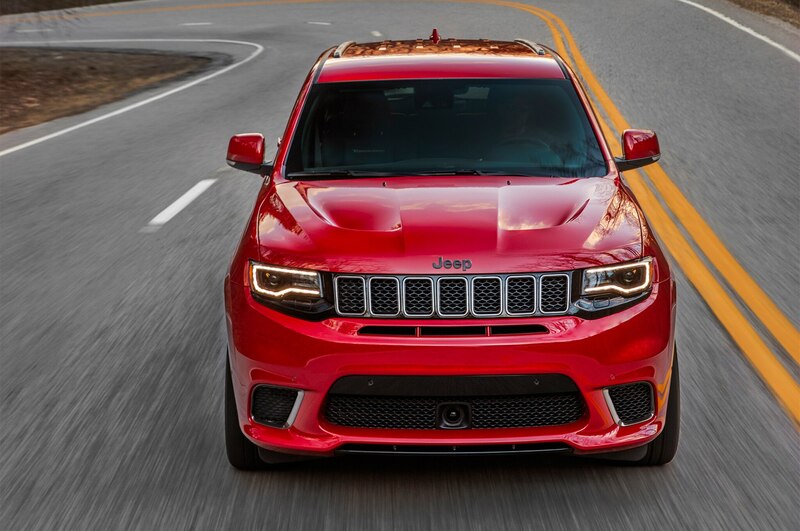 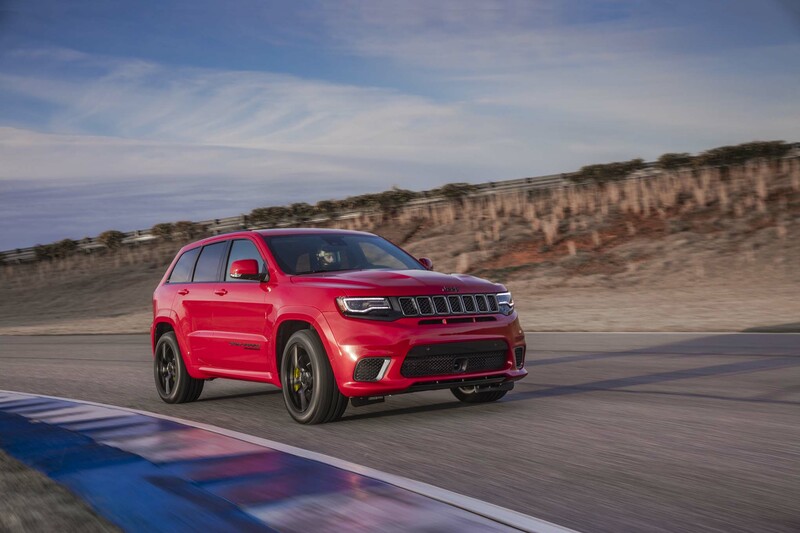 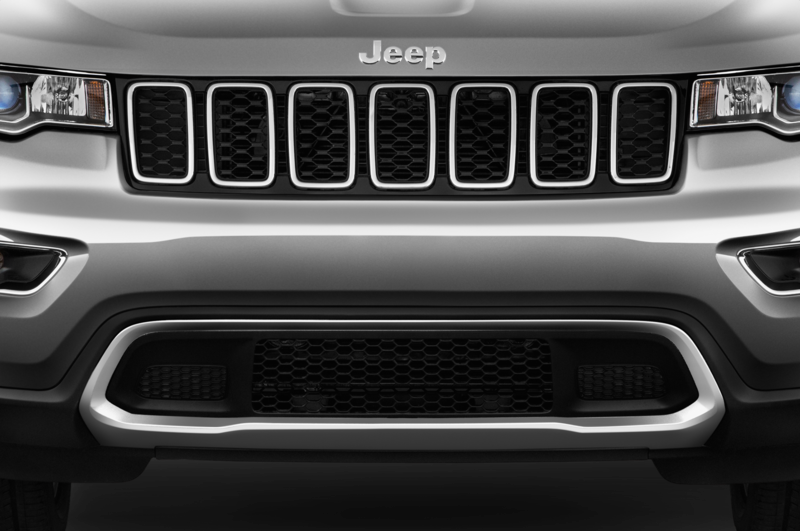 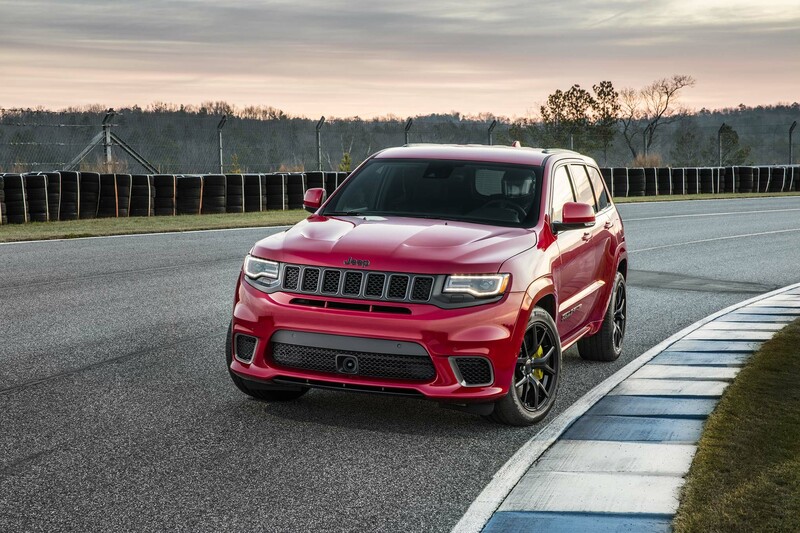 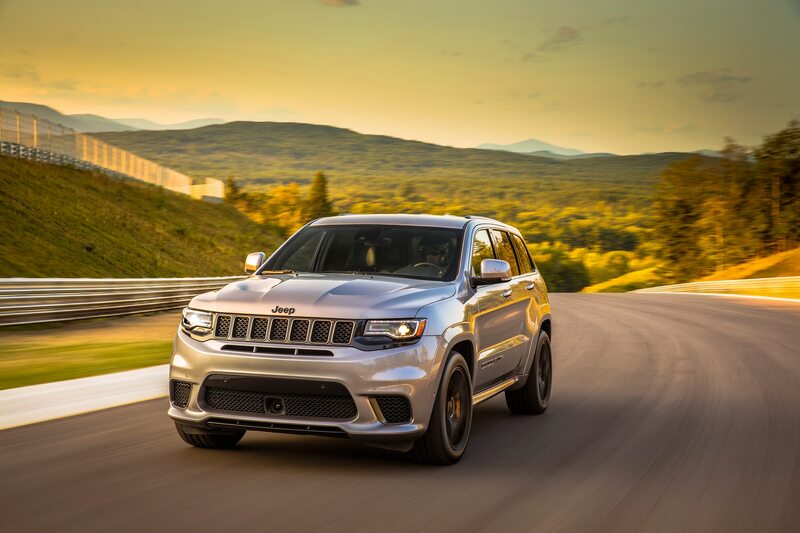 So you know how fast the Trackhawk is, and recently Jeep told us how much: $86,995. 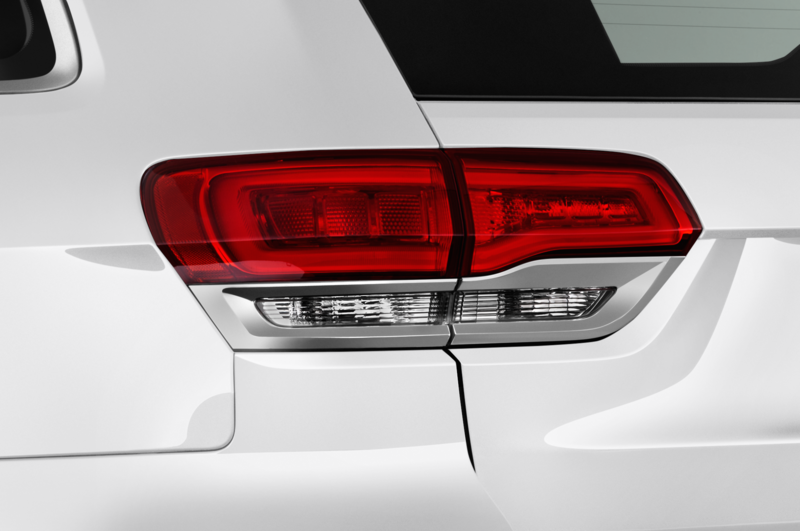 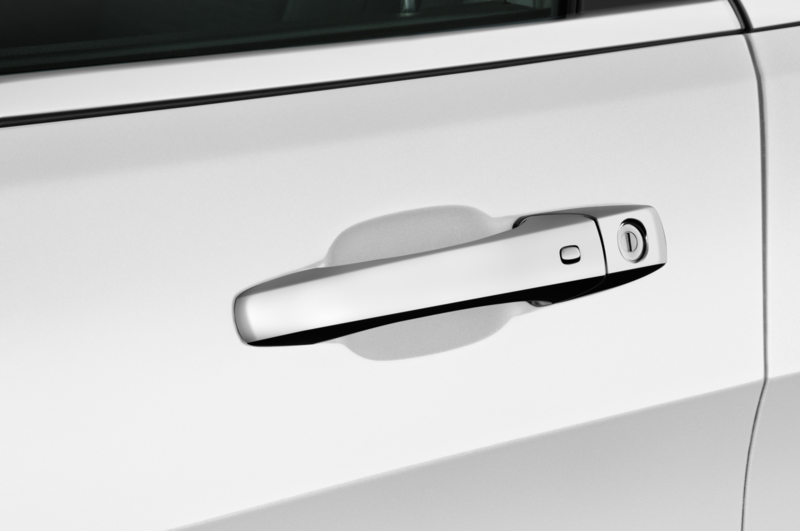 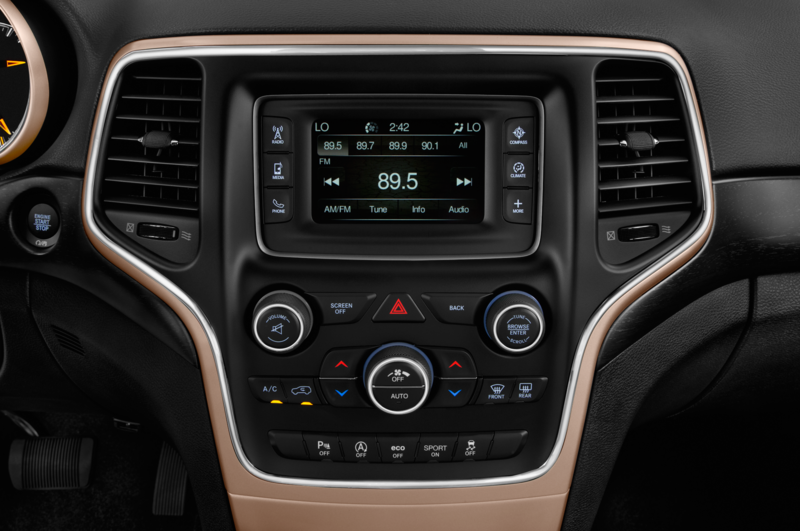 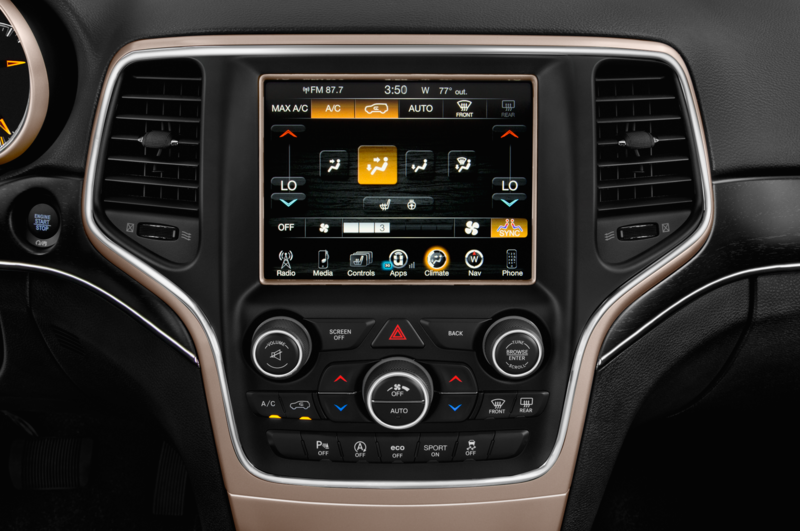 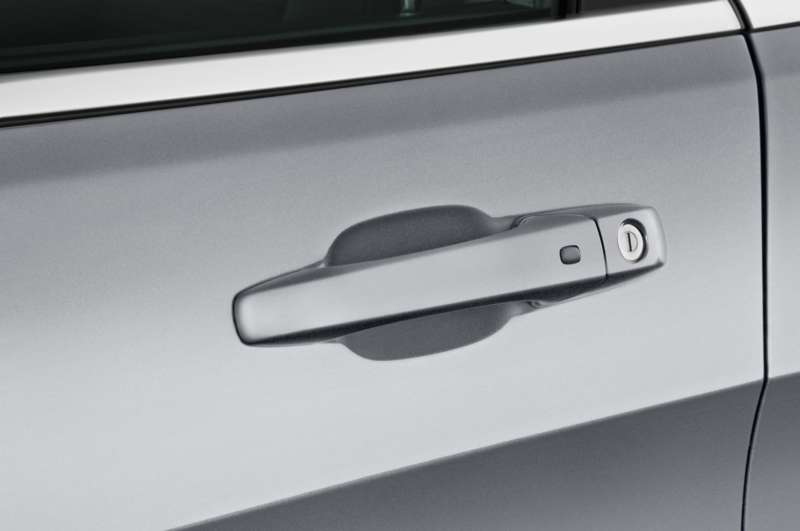 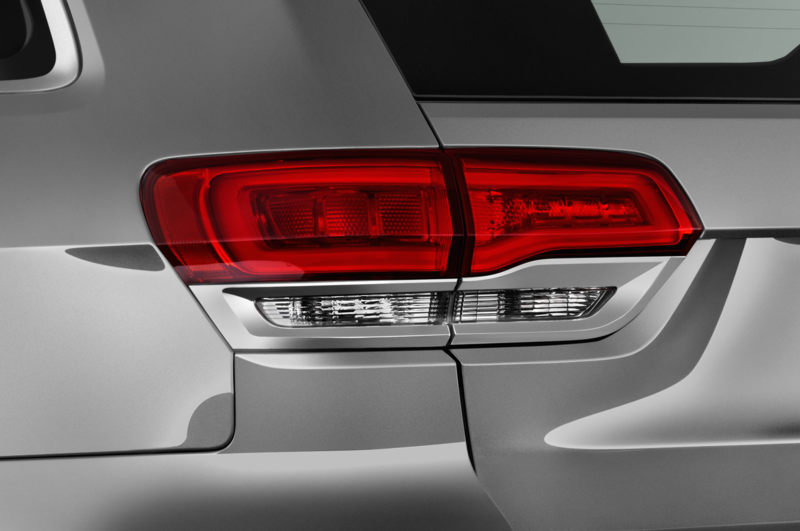 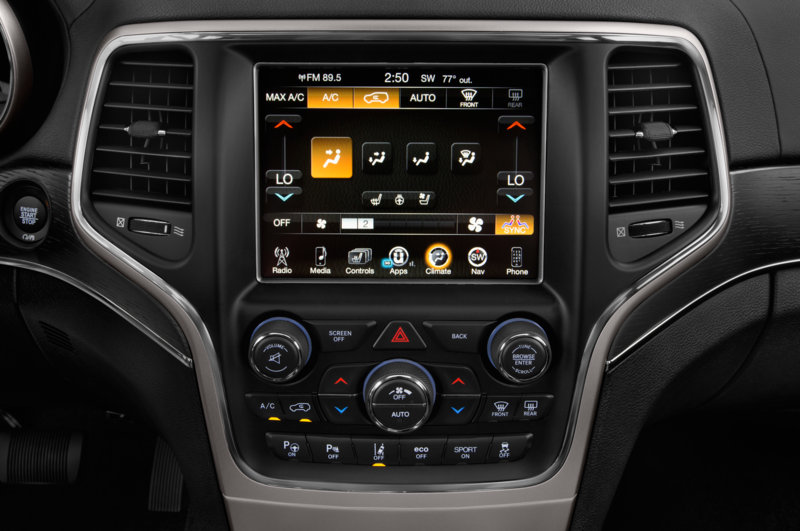 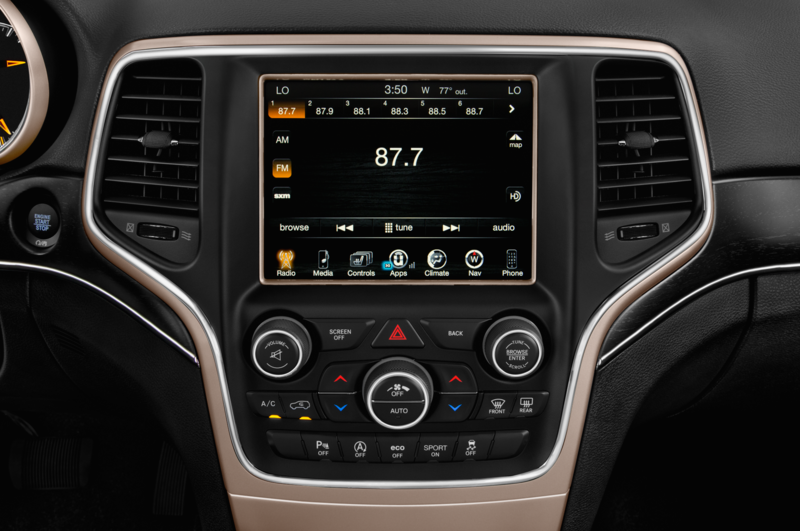 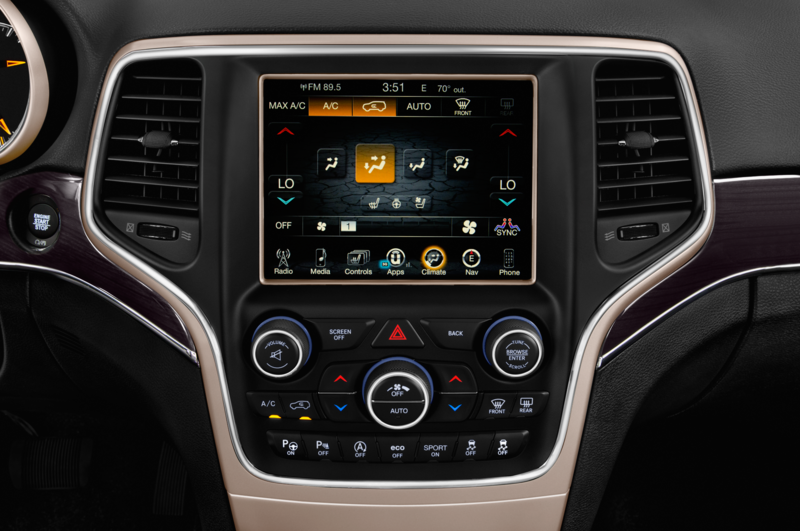 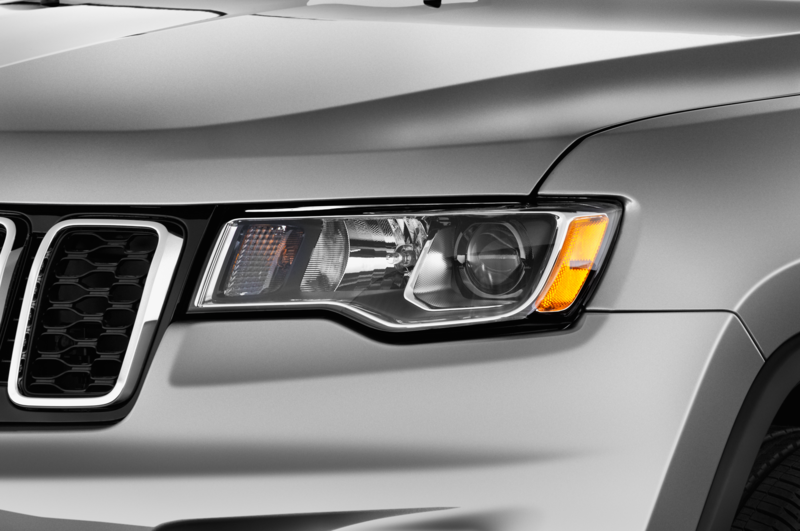 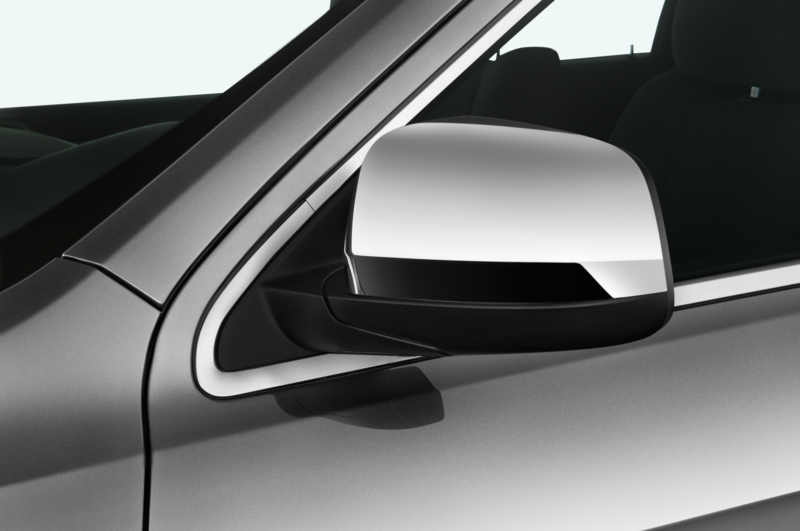 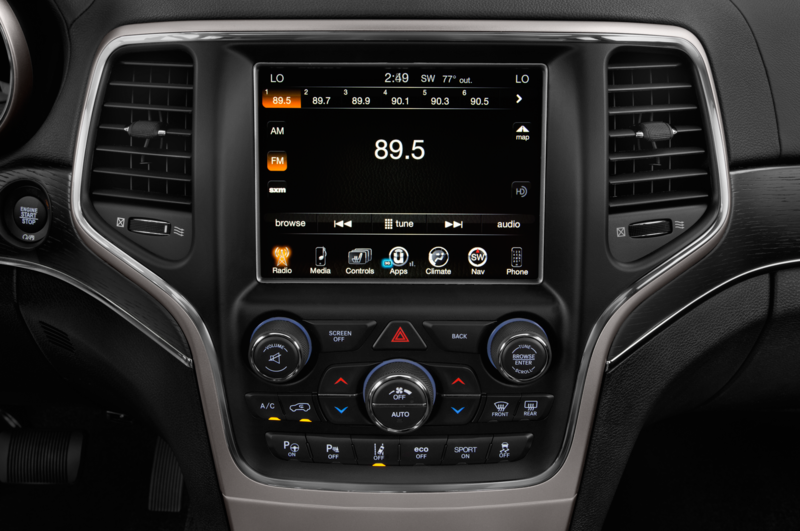 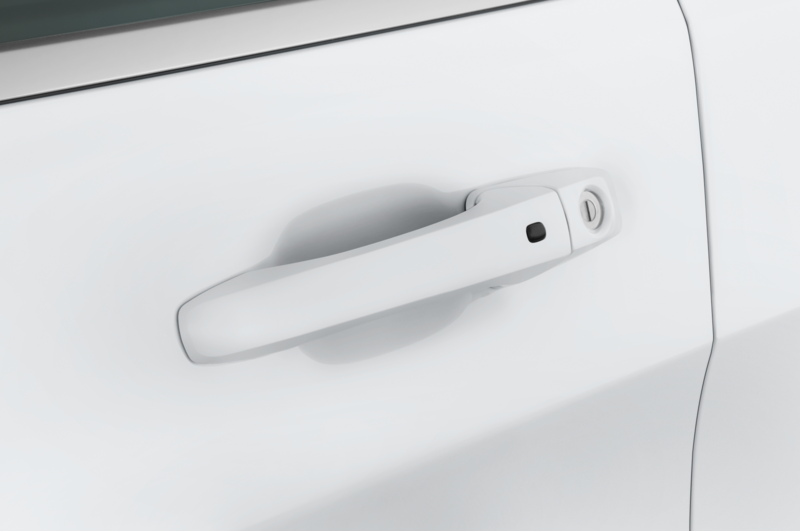 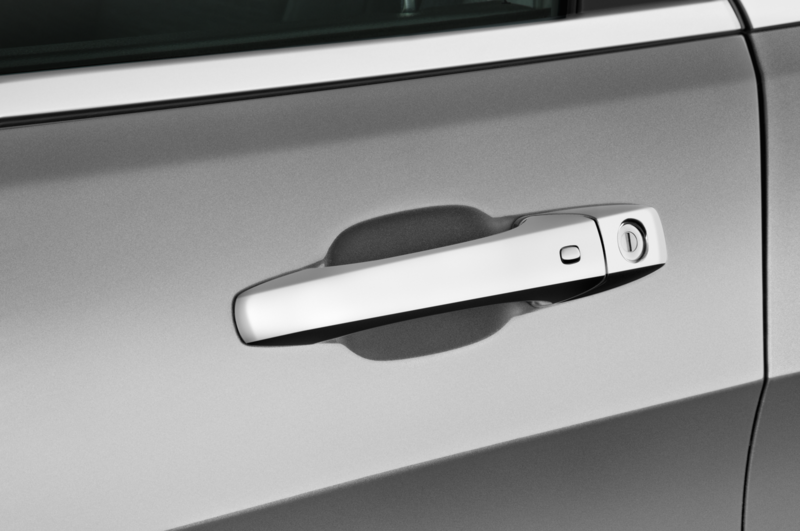 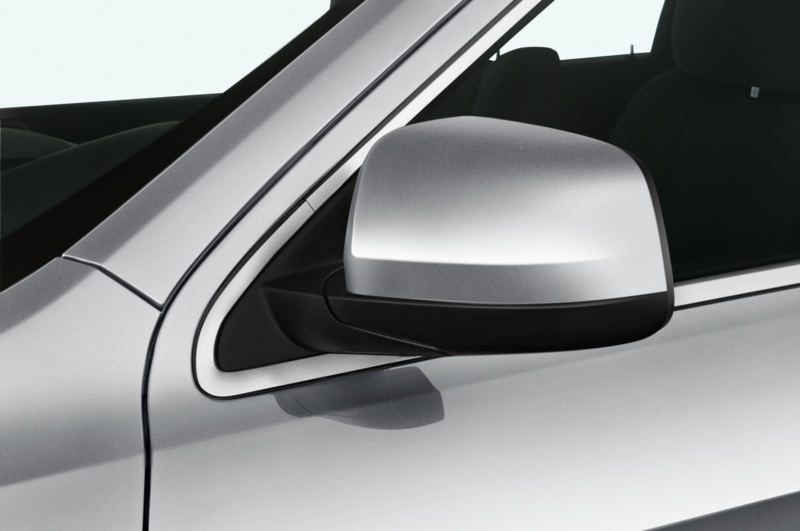 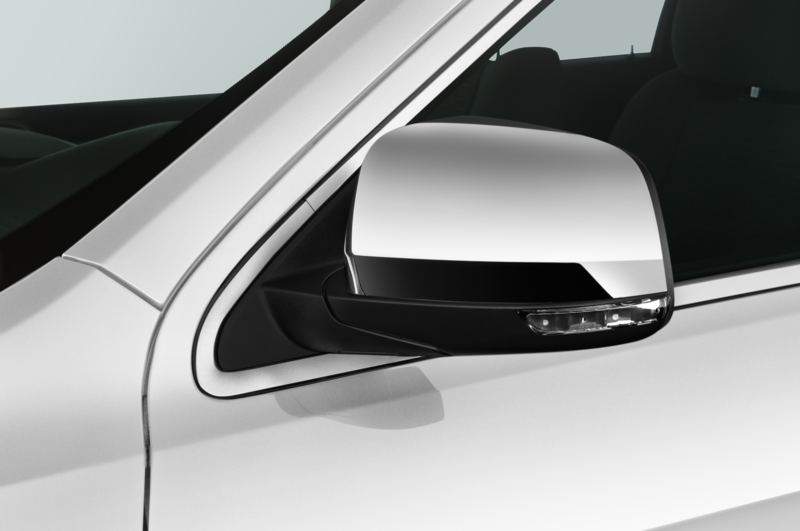 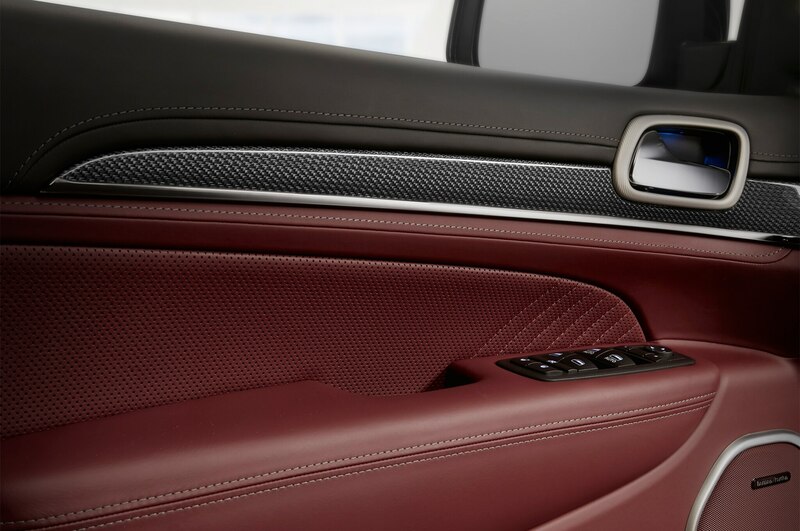 The car features enough available options to push its price to just more than $100,000. 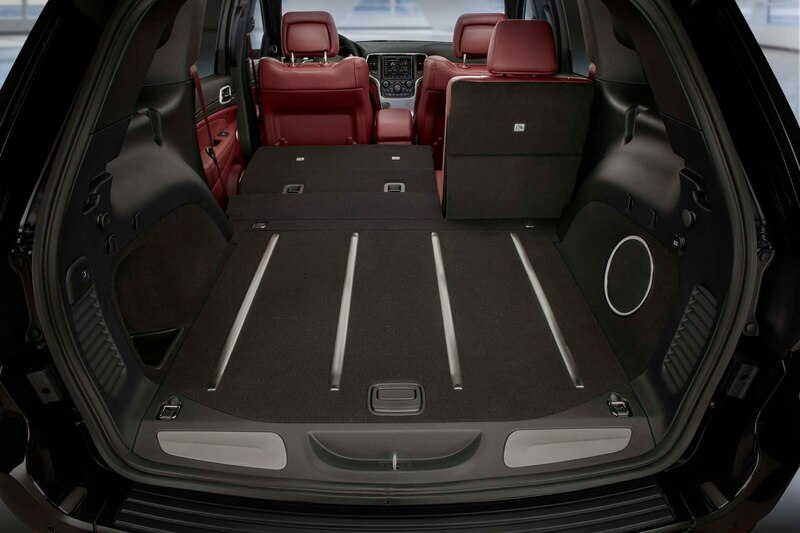 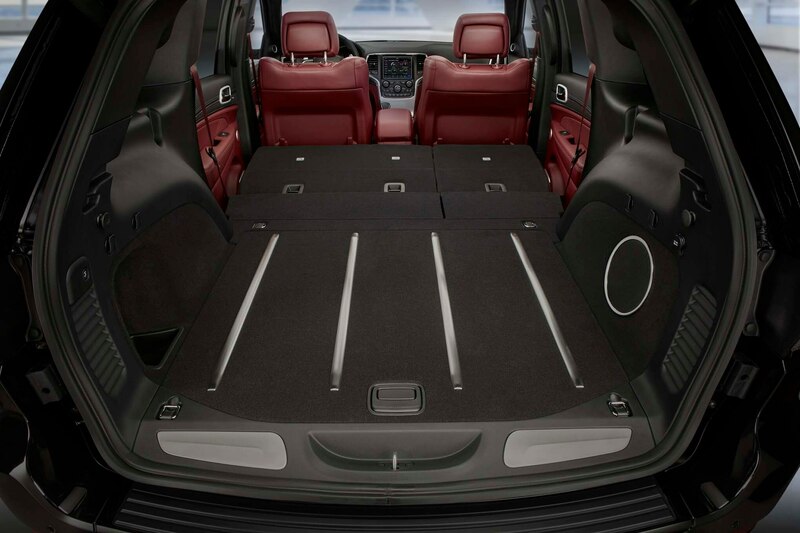 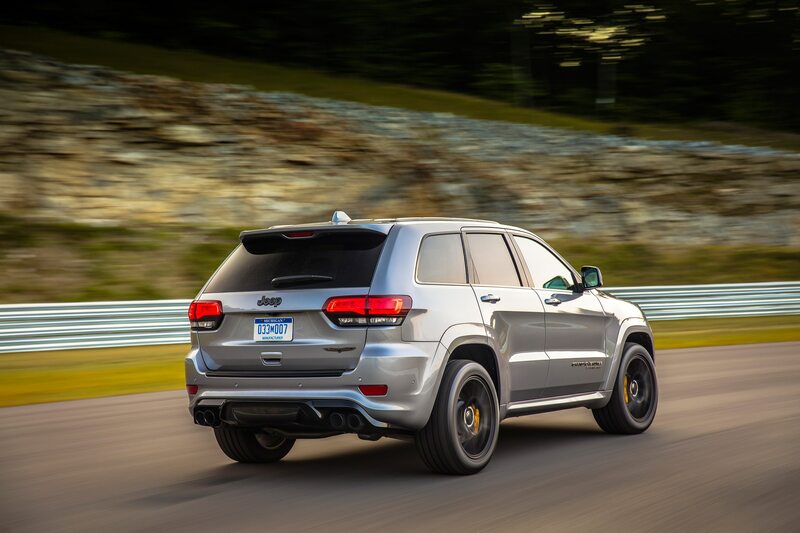 Those options include a sunroof, an upgraded sound system (Alpine standard, Harman Kardon with 19 speakers optional), “Black Satin” spoked wheels, a temporary spare tire (the normal 295/45R-20 Pirellis are run-flats), a towing package good for 7,200 pounds, and some interior-trim features. 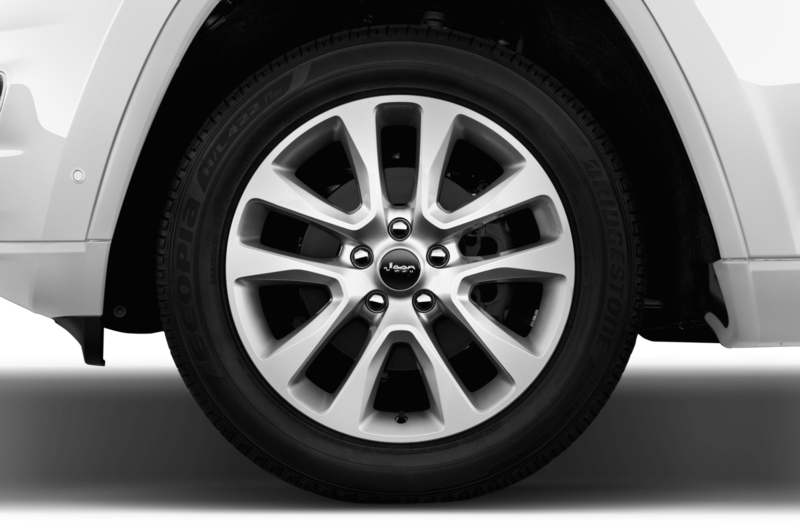 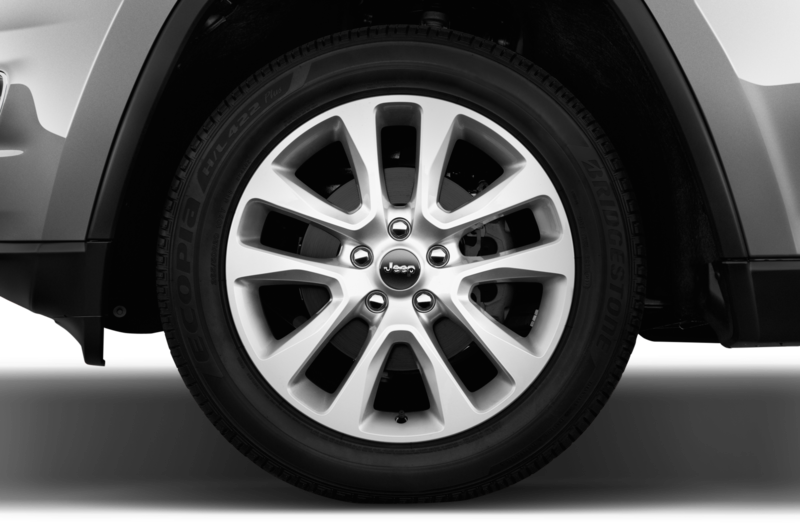 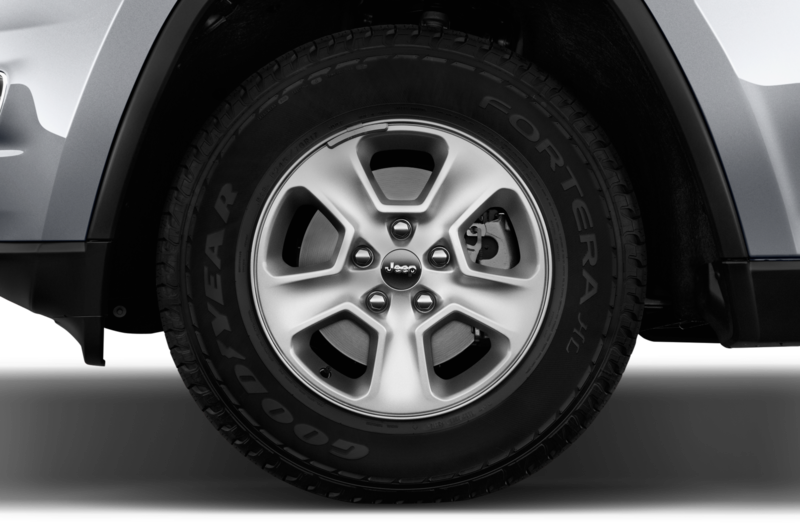 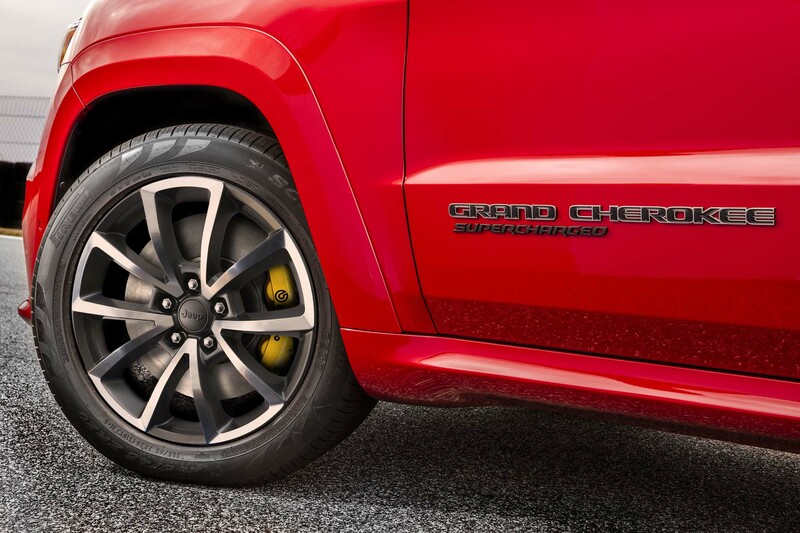 None of the options except the wheels, which provide a total reduction of 12 pounds of unsprung weight compared to the standard forged aluminum wheels, will improve performance. 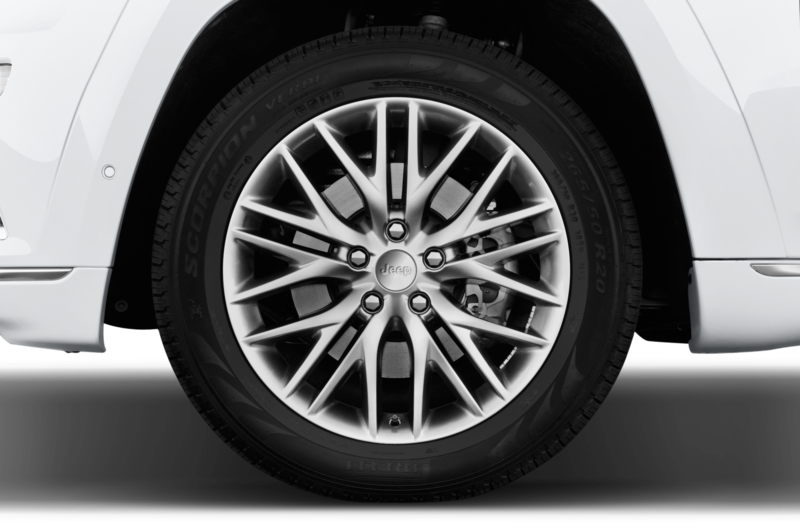 The Pirellis only come in one size, but you have a choice of three-season PZeroes or all-season Scorpion Verdes. 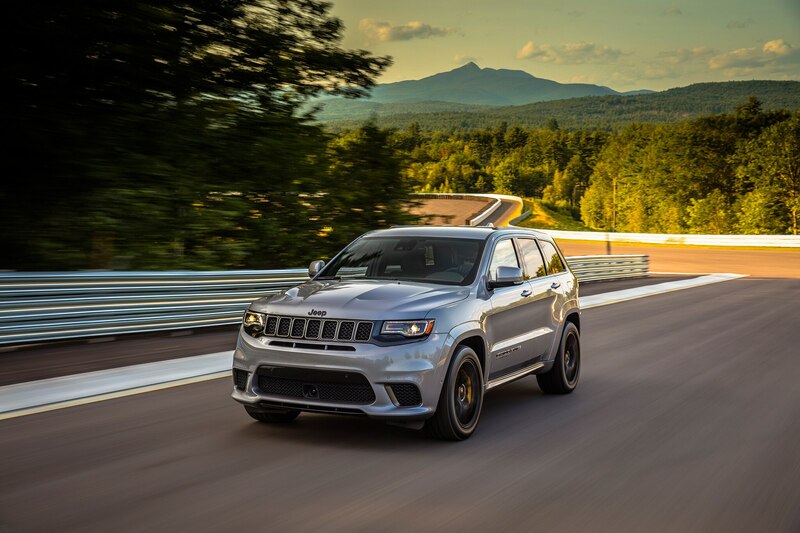 The Trackhawk we spent the most time in during the launch event had the sunroof, upgraded audio system, and the trailer-tow package. 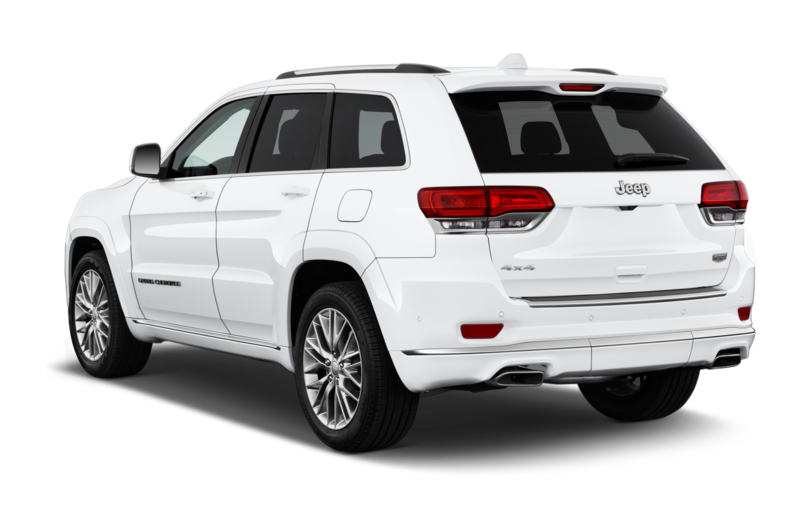 Total price is $93,570. 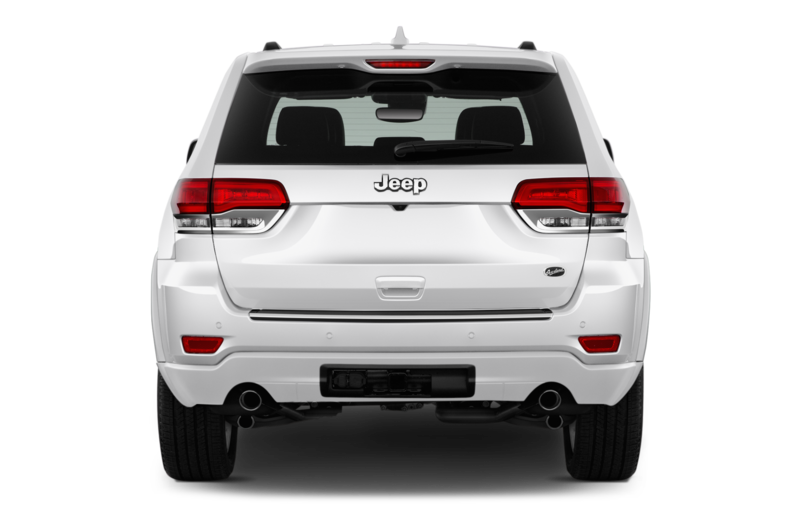 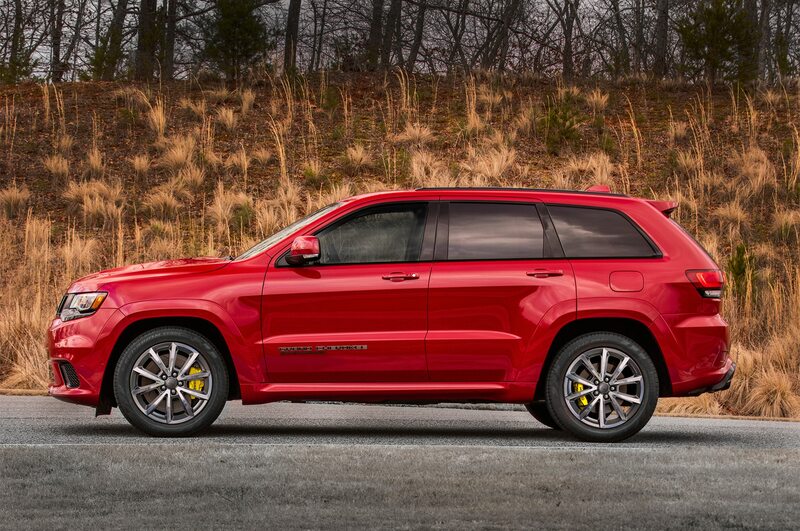 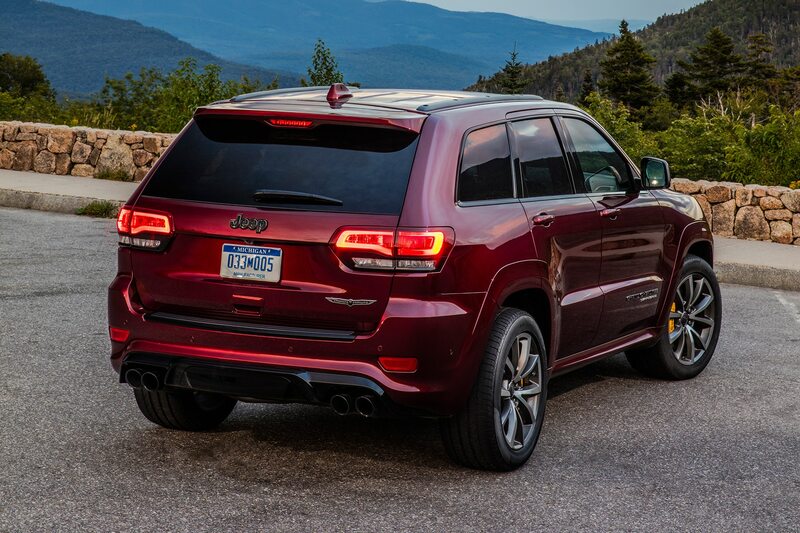 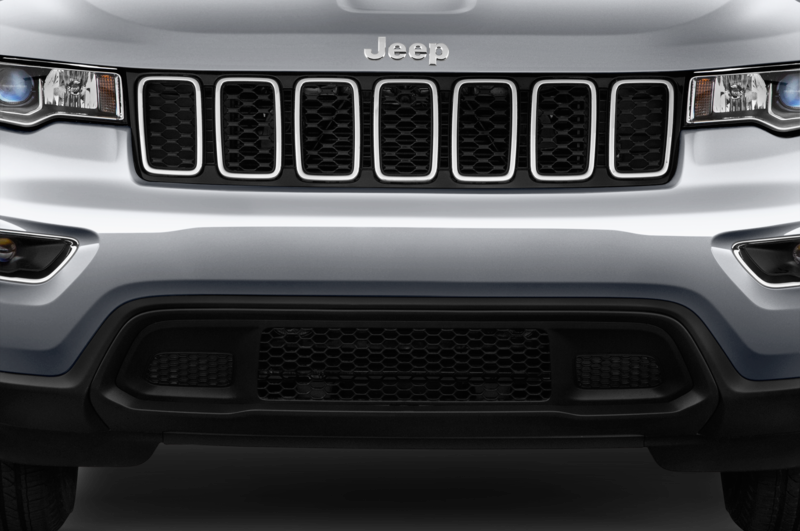 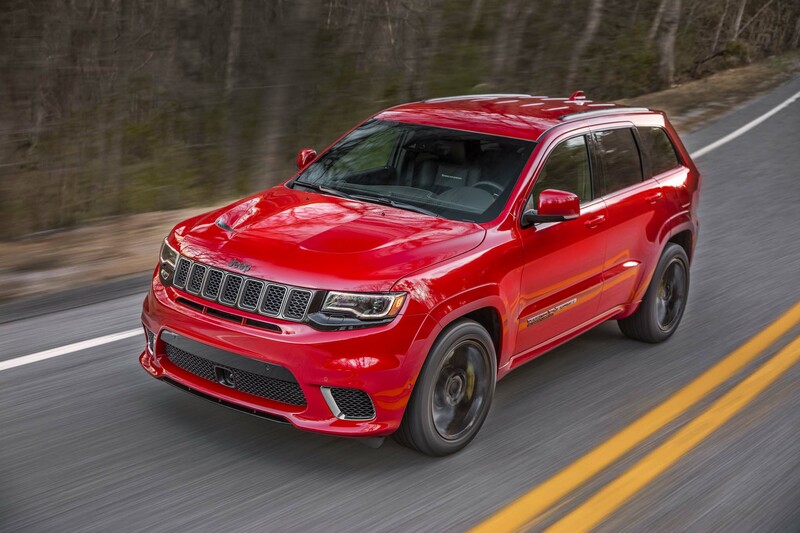 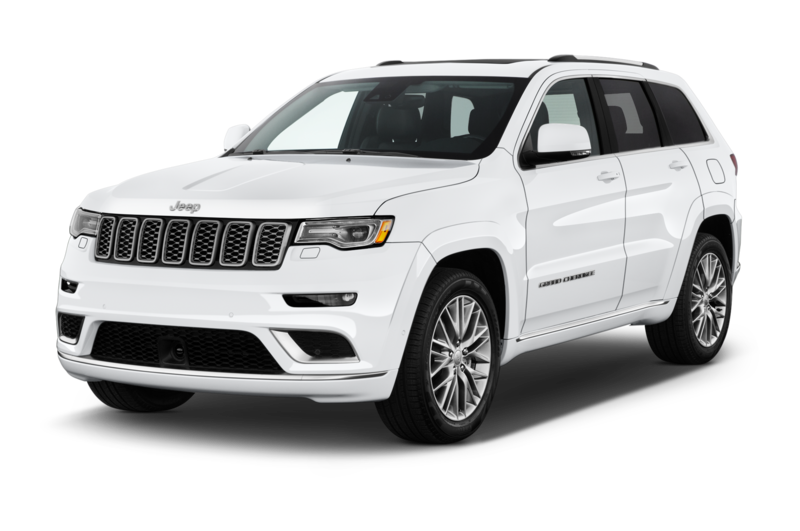 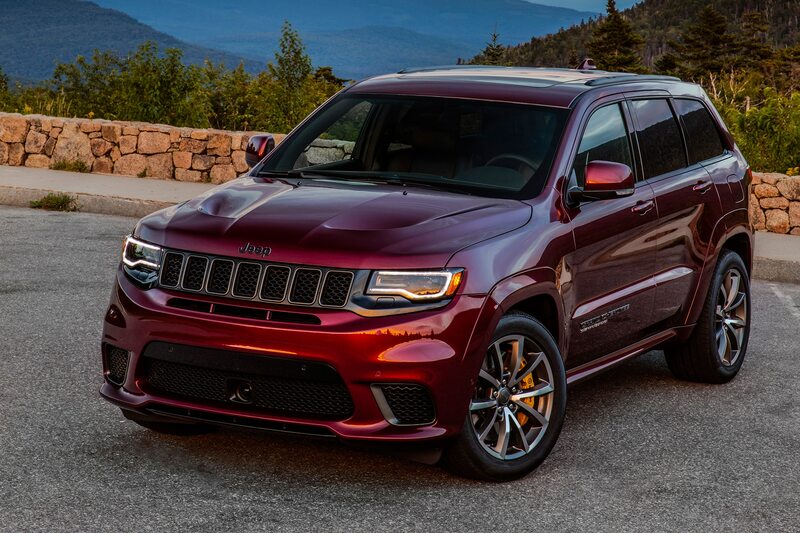 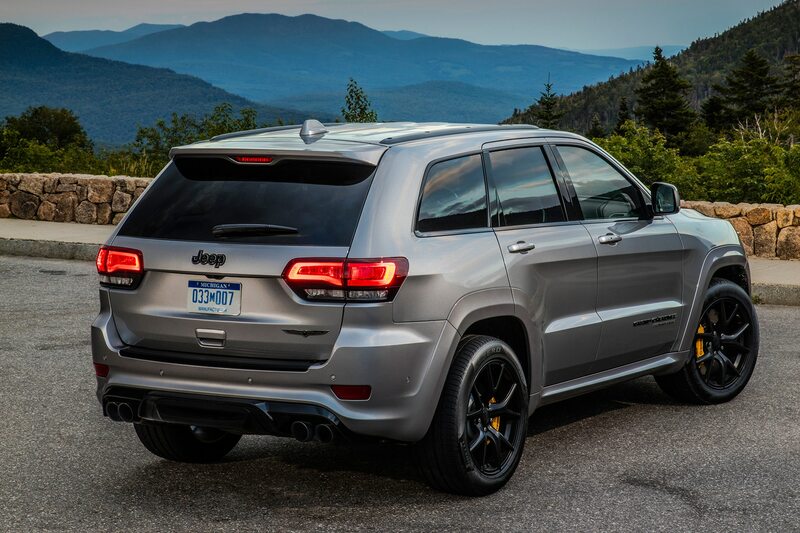 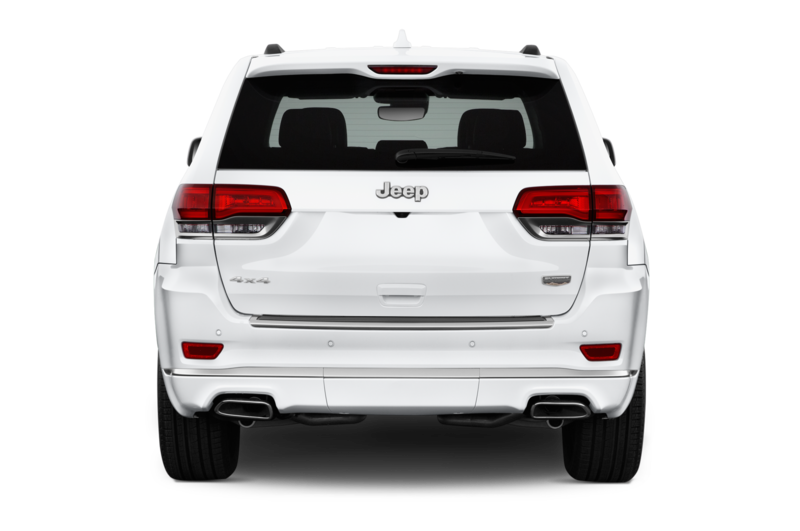 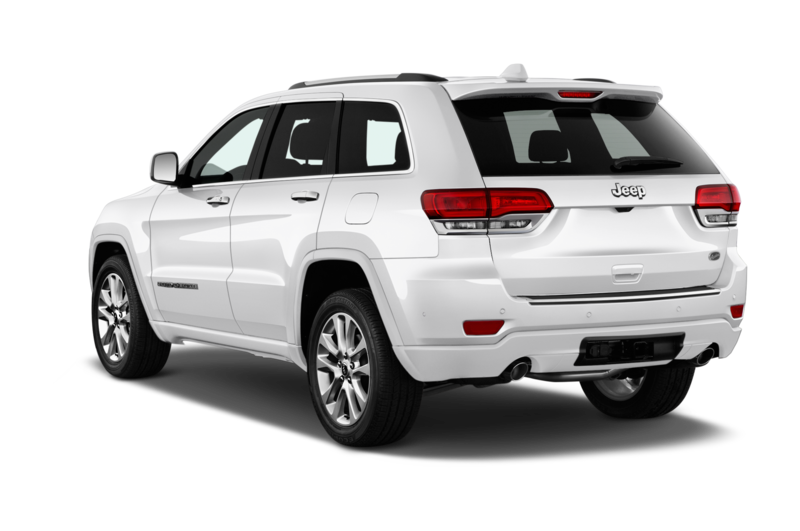 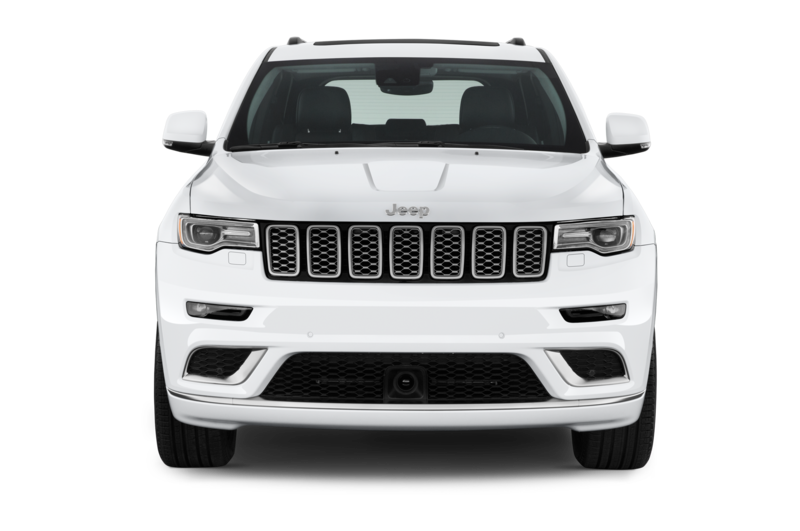 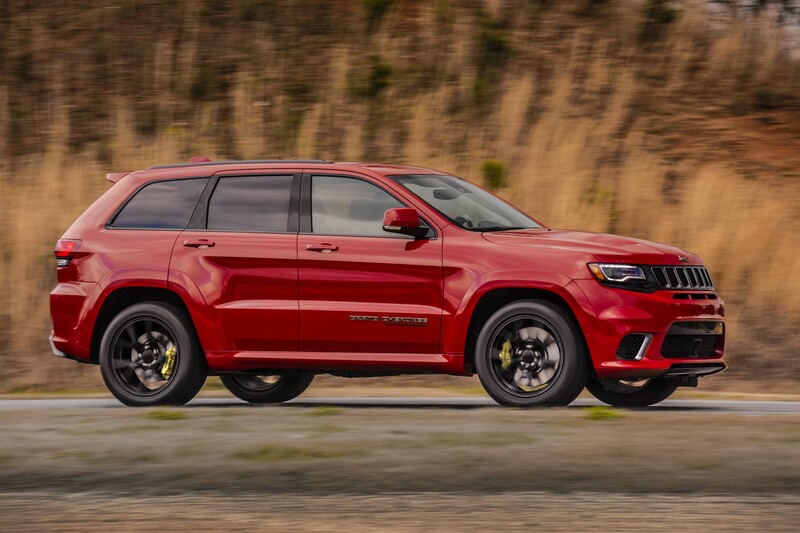 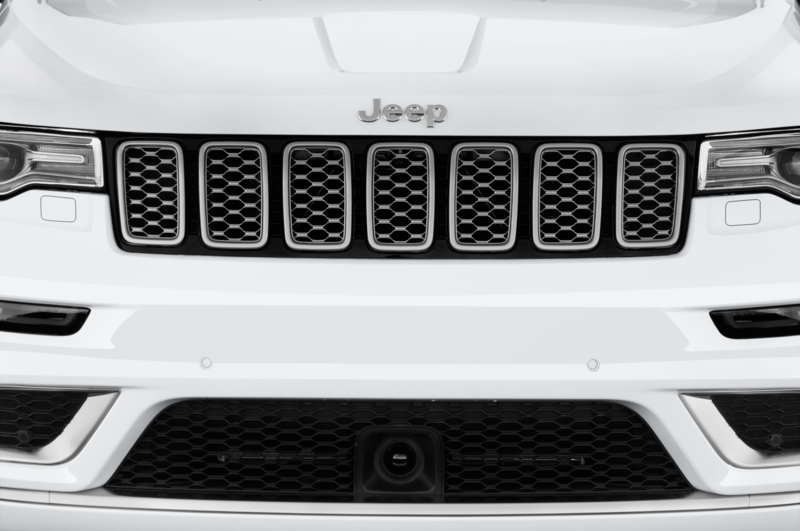 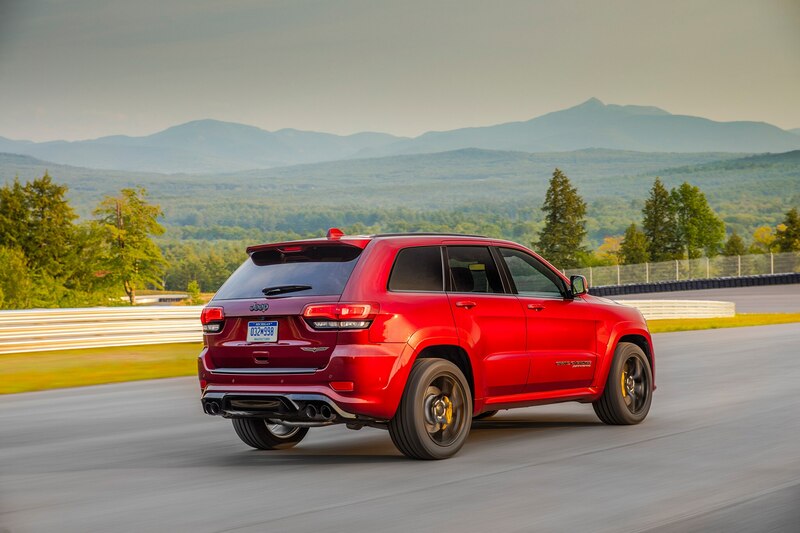 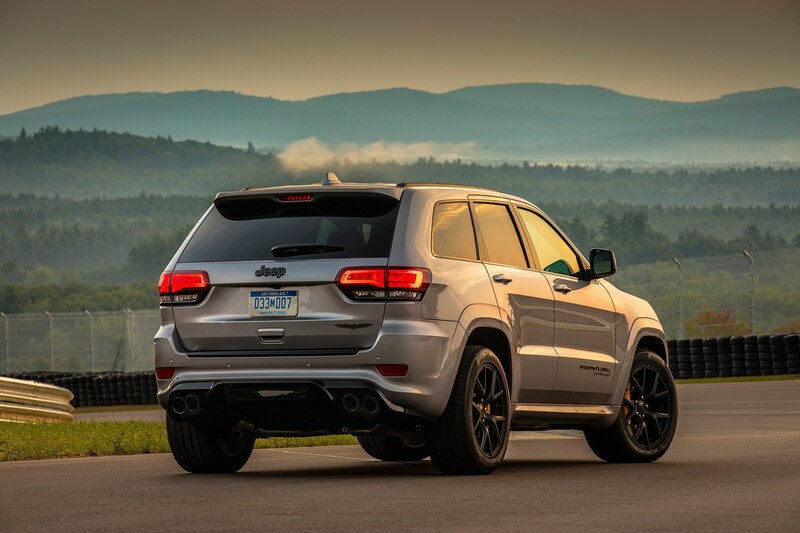 For comparison, a similarly equipped 2018 Jeep Grand Cherokee SRT, which looks an awful like the Trackhawk except for the Trackhawk badge on the back and the “Supercharged” logo on the sides, costs about $73,500. 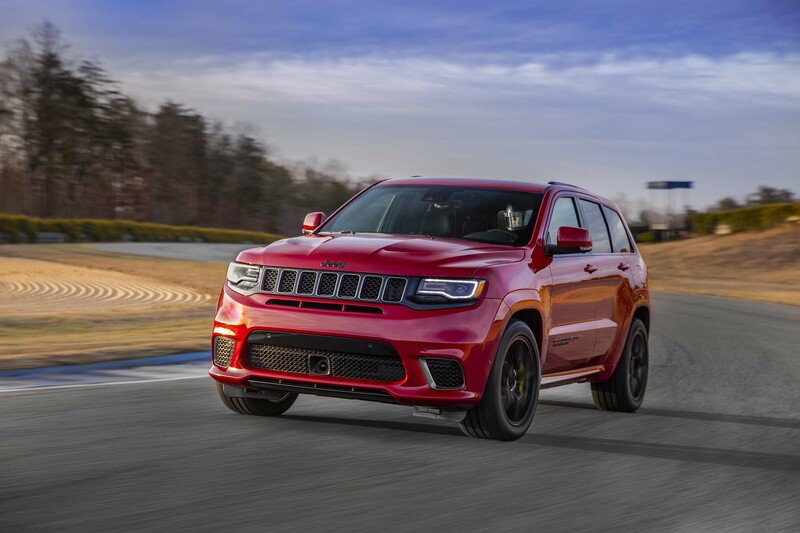 Of course, you’ll save marginally at the pump: The SRT gets an EPA-rated 13/19 mpg city/highway, while the Trackhawk is rated at 11/17 mpg. 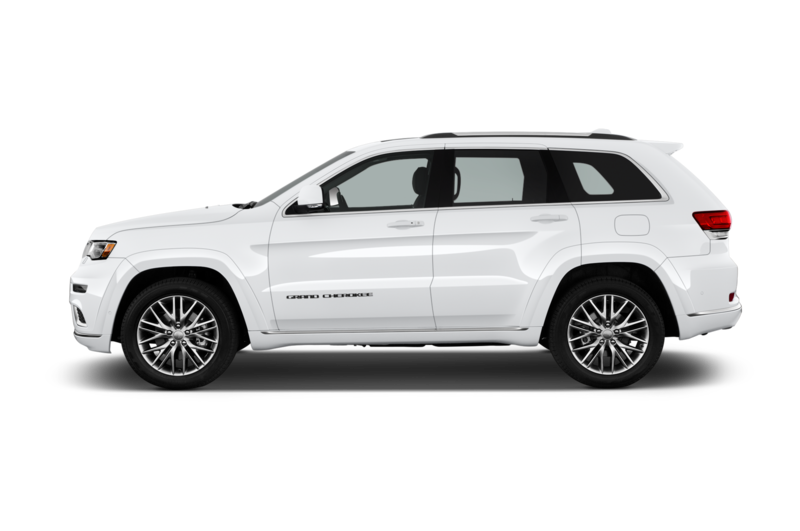 Purchase of either should probably cancel your Sierra Club membership. 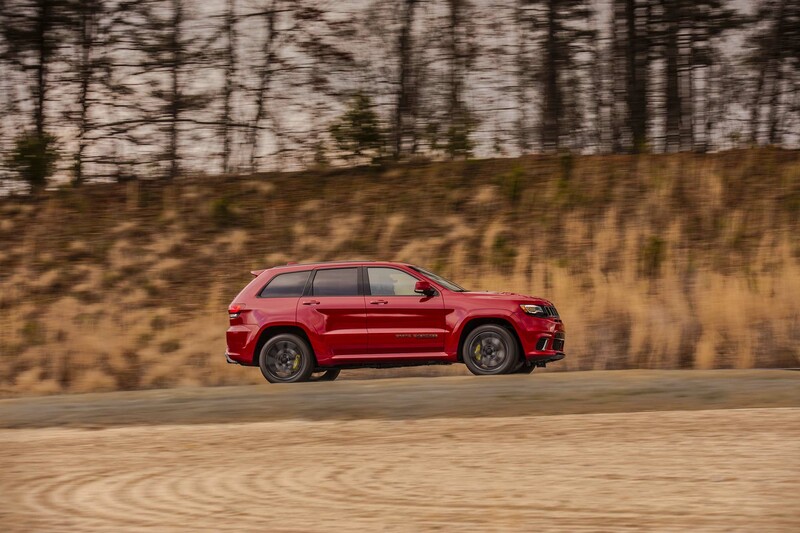 On the road, in Auto mode (there’s also Sport, Track, Snow, and Tow) the Trackhawk’s ride is a little choppy but certainly tolerable. 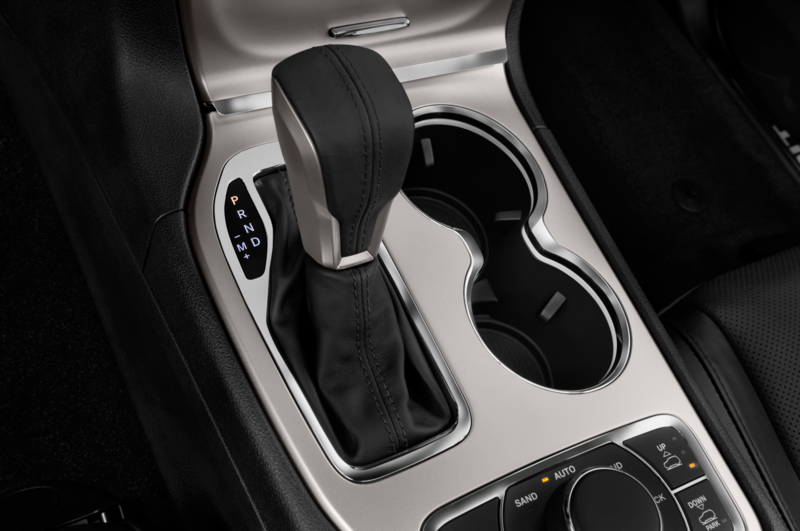 The new eight-speed automatic transmission is attentive but unobtrusive unless you mash the throttle in a meaningful way. 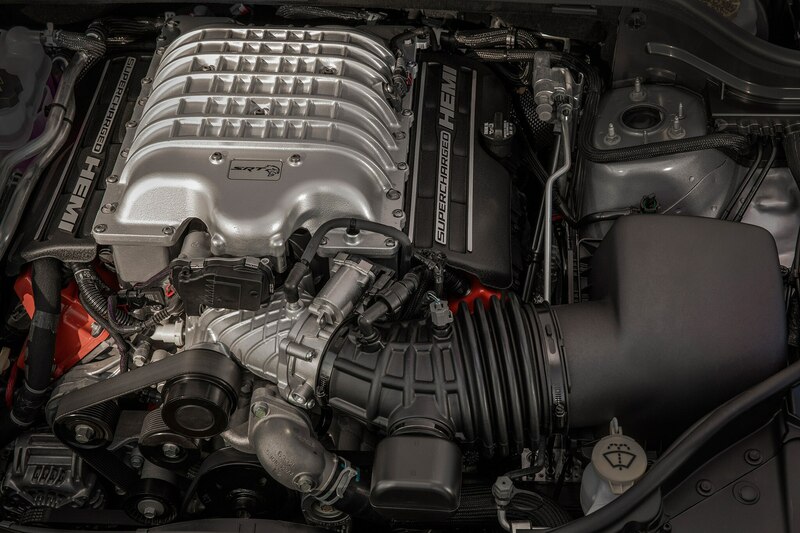 A neat little resonator mounted between the engine and the air intake muffles some of the supercharger whine. 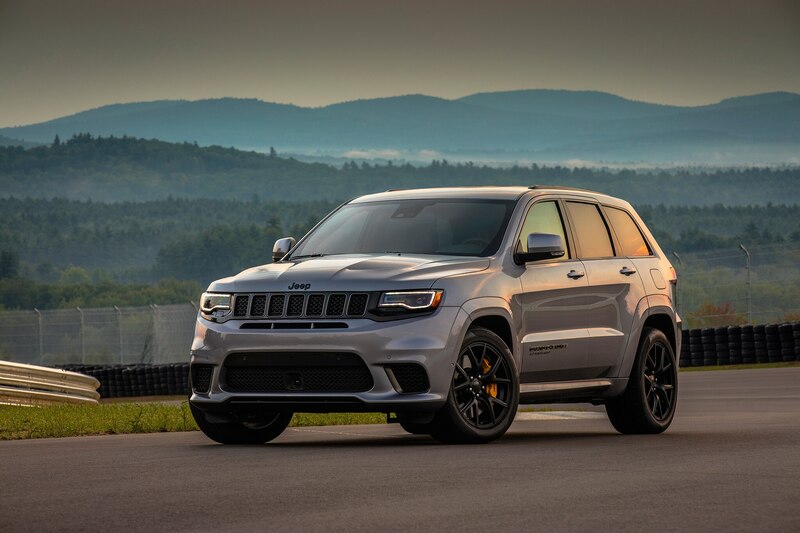 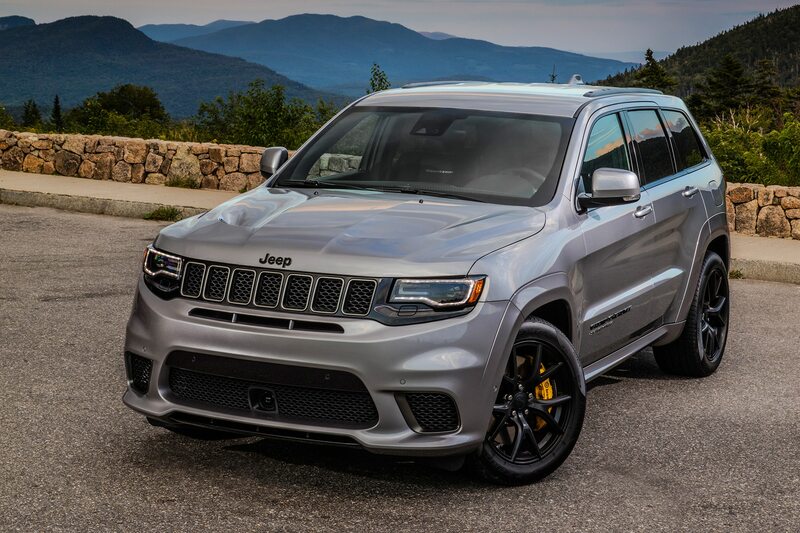 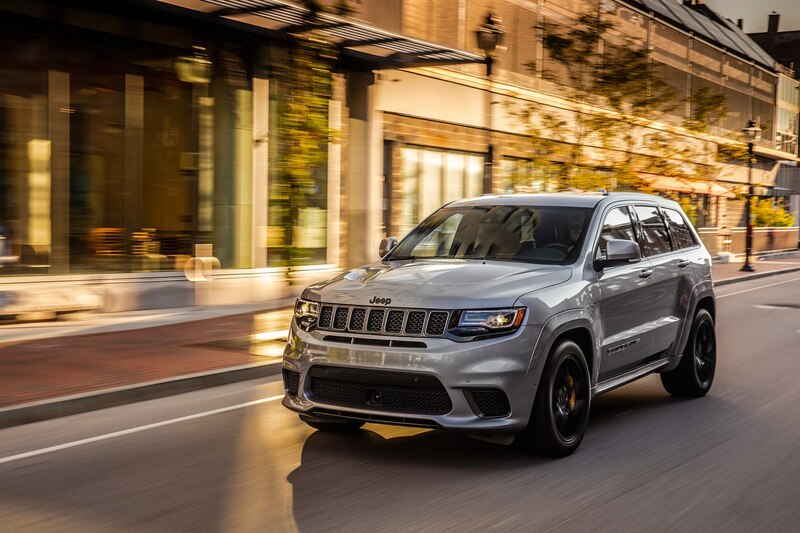 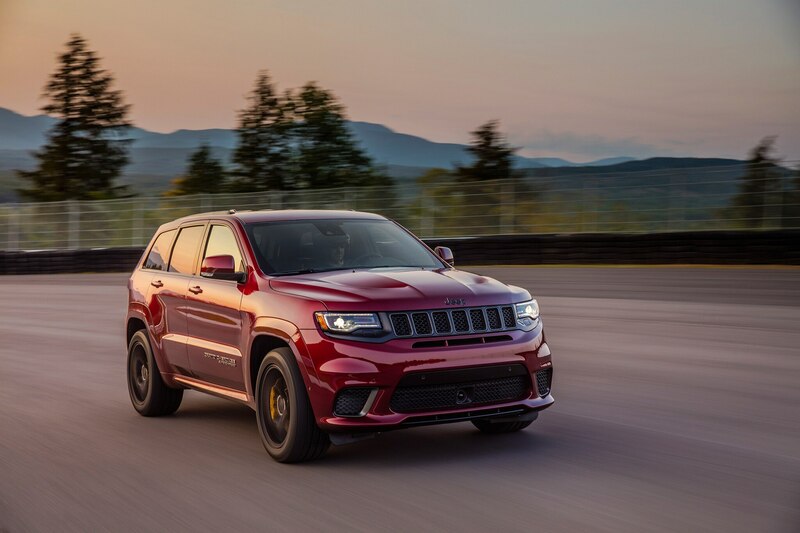 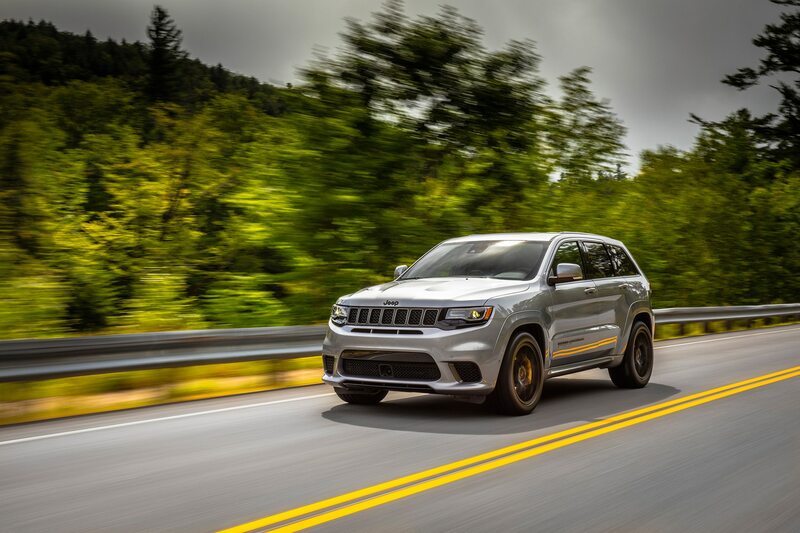 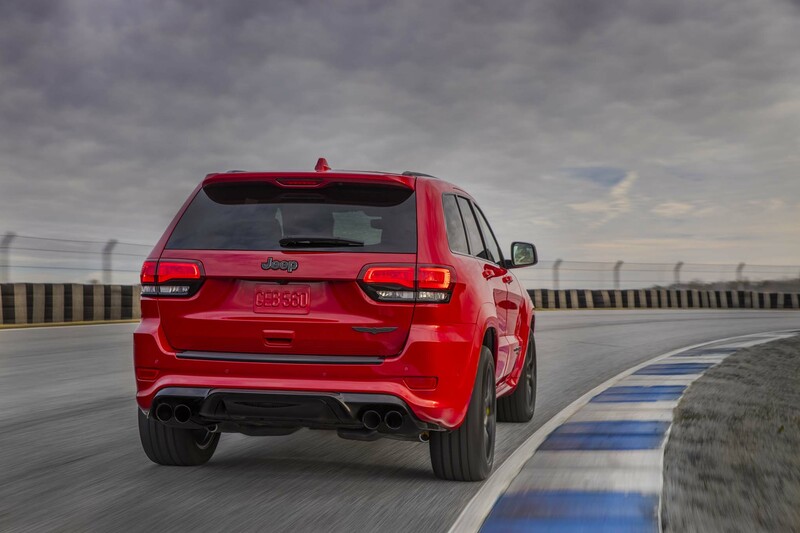 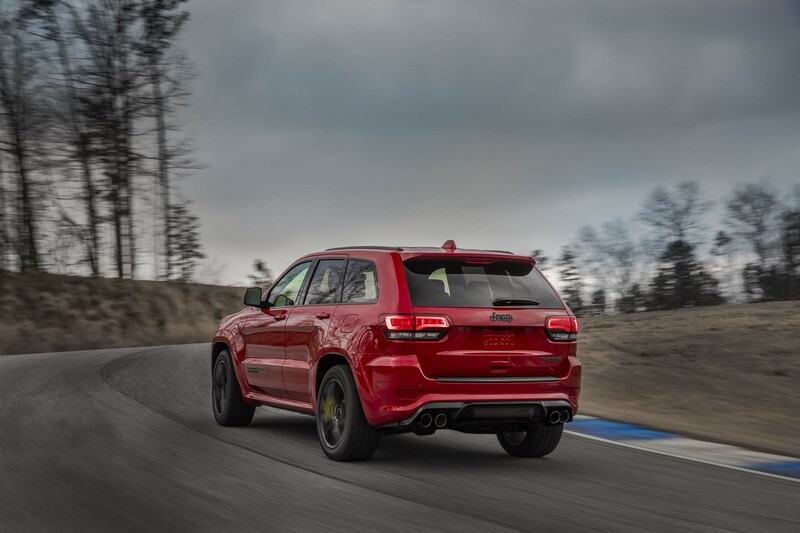 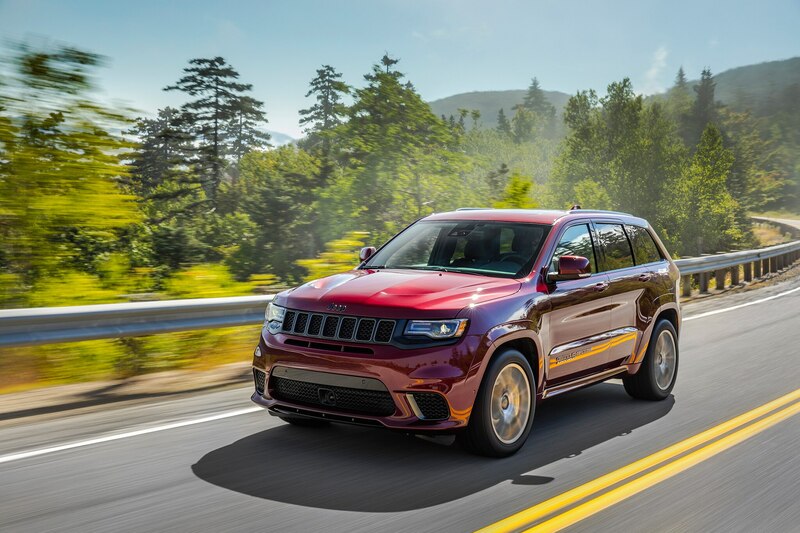 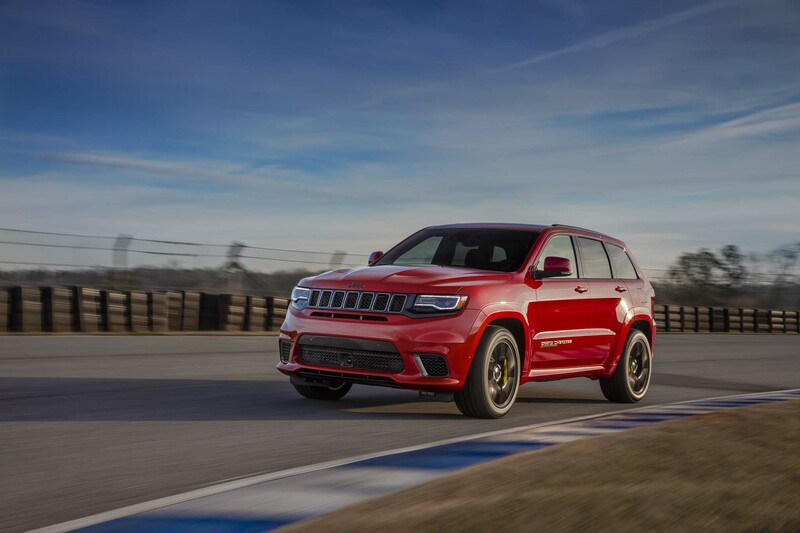 Trust us, there’s plenty of whine left under acceleration to let everybody know this is the Trackhawk, not the Grand Cherokee SRT. 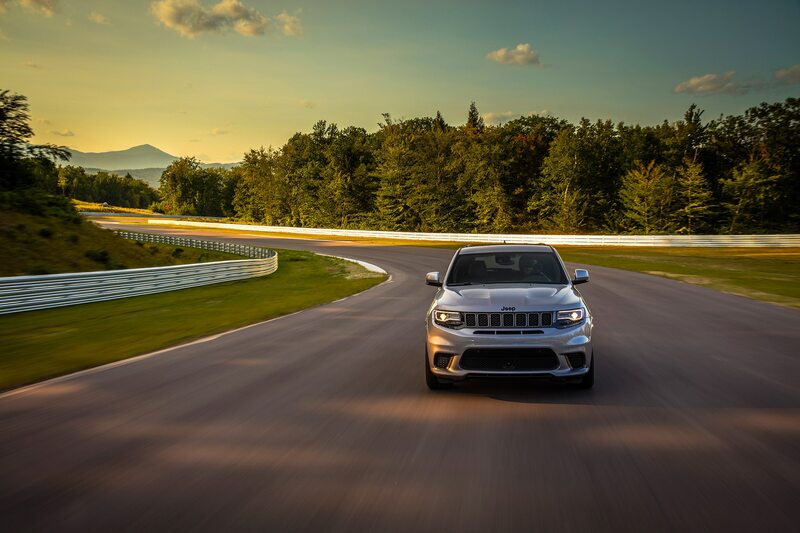 On the actual track—in this case the brand-new Club Motorsports road course in Tamworth, New Hampshire—handling in Track mode is pretty remarkable. 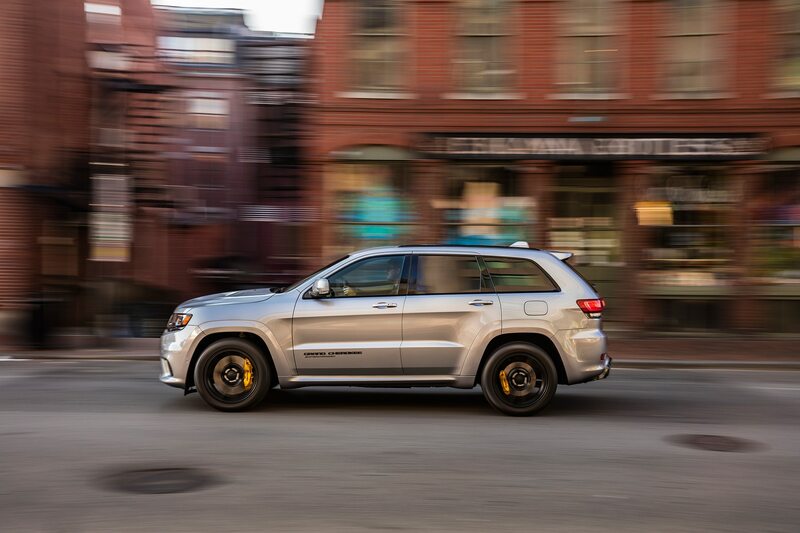 The suspension and the Pirellis mask but can’t eliminate the inertia generated by a monster that weights 5,363 pounds, but you have to really press the issue to initiate some understeer. 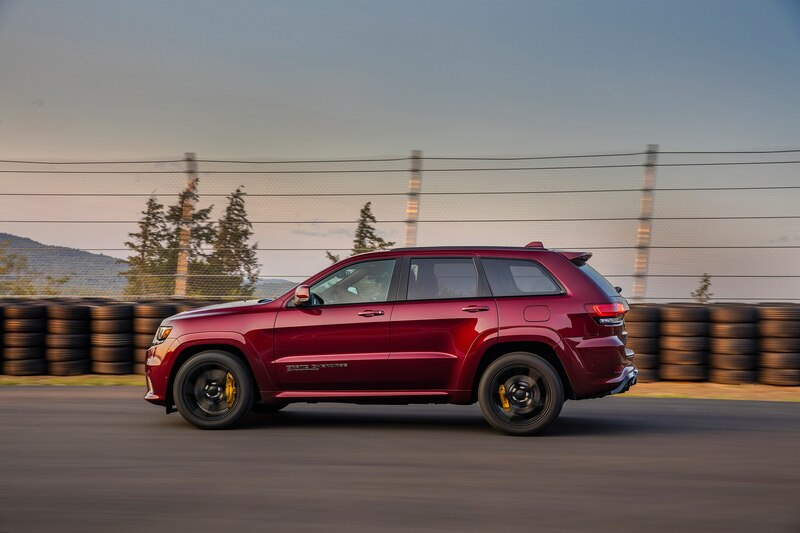 And, let’s be honest, no one is taking this Jeep to the track consistently, other than just to prove a point. 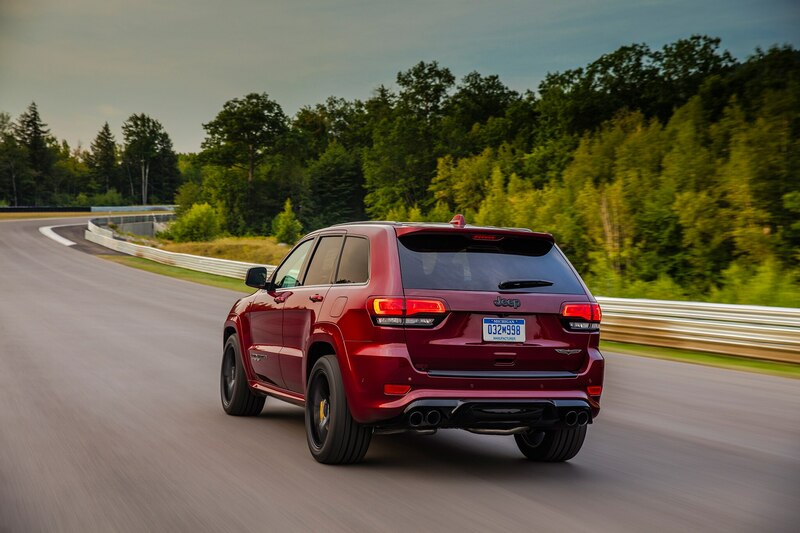 The Trackhawk’s all-wheel drive is managed nicely by the single-speed, electronic-proportioning transfer case, which moves torque between the front and rear wheels, to maximums of 60/40 front/rear in Tow mode to 30/70 in Track. 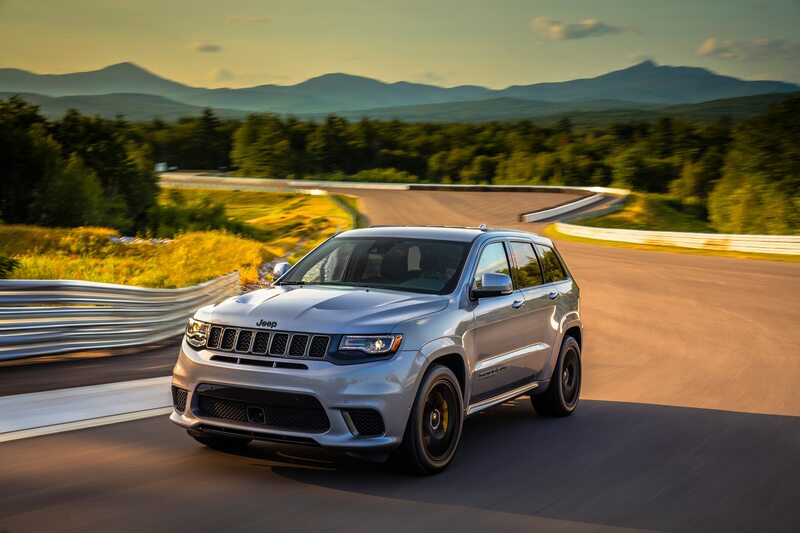 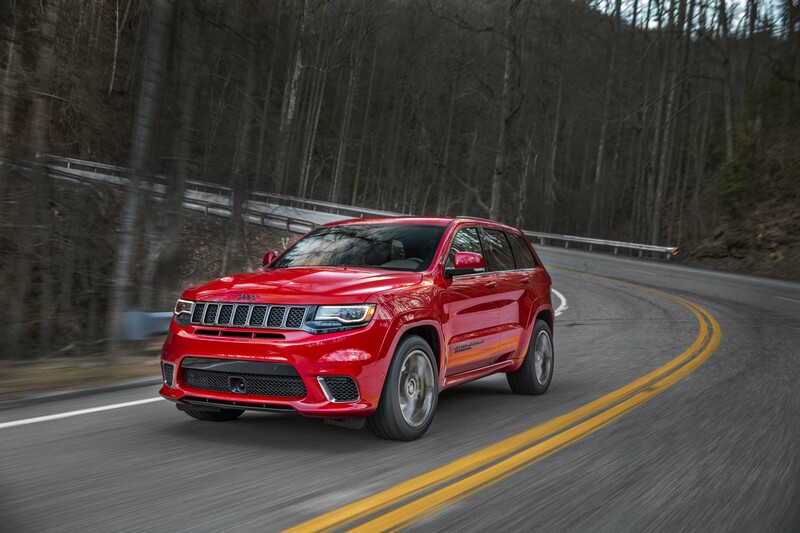 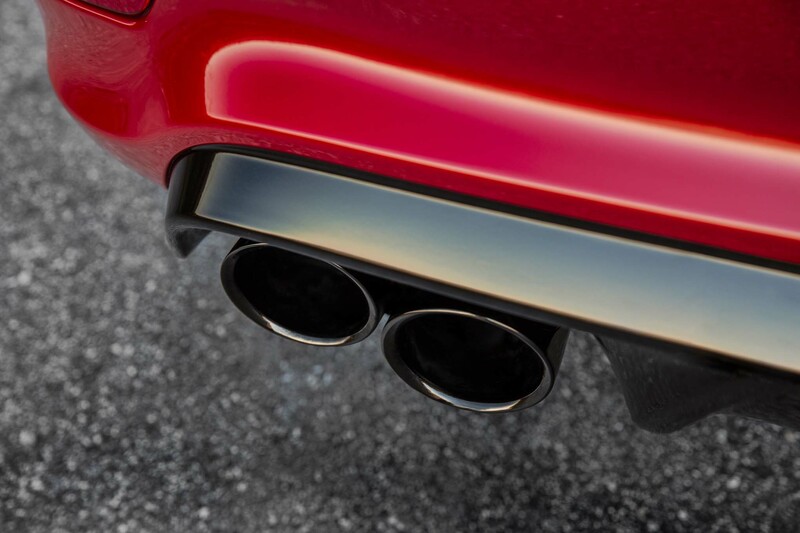 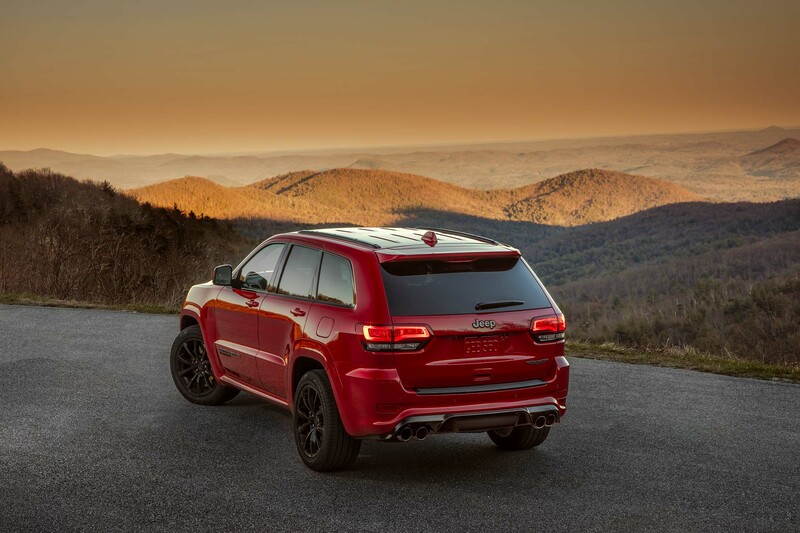 Since this vehicle is named the Trackhawk instead of the Trailhawk, don’t expect to do much off-roading, especially with a ground clearance of just 8.1 inches. 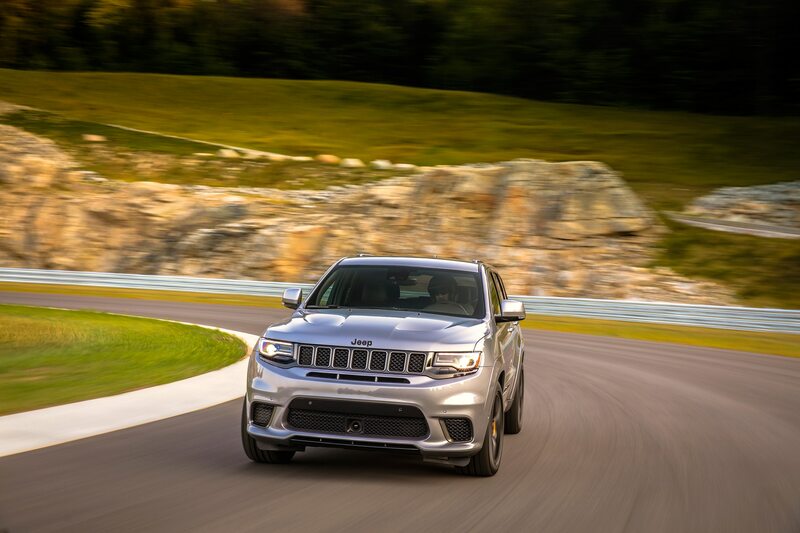 The Club Motorsports road course does not have dramatically long straights, but any straight is dramatic when you bury the throttle on this engine. 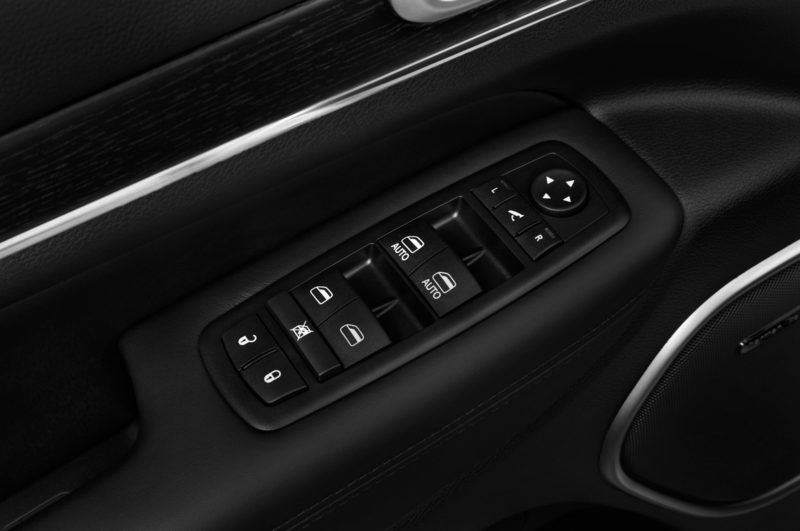 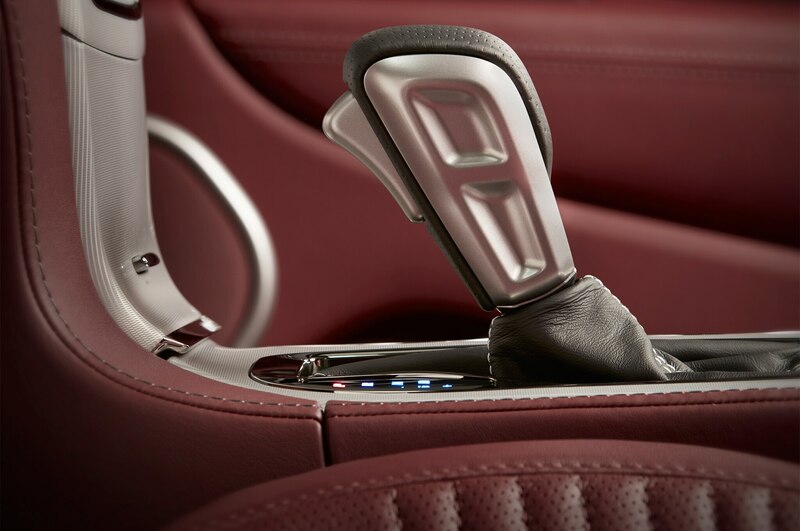 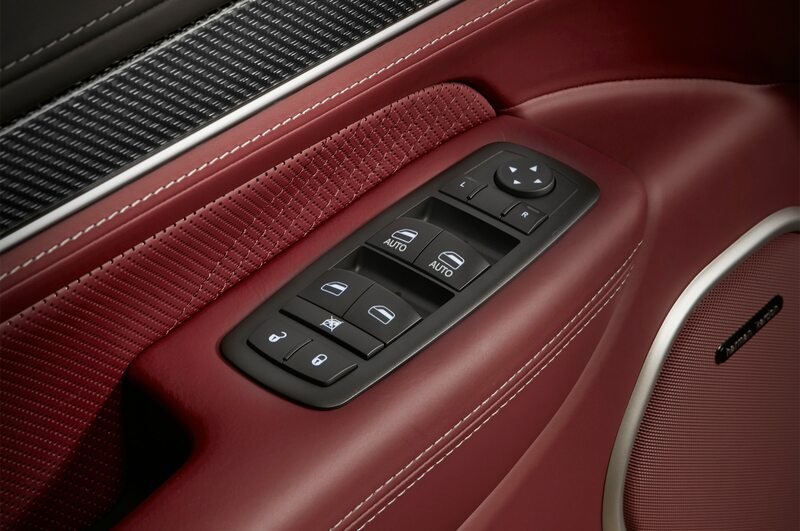 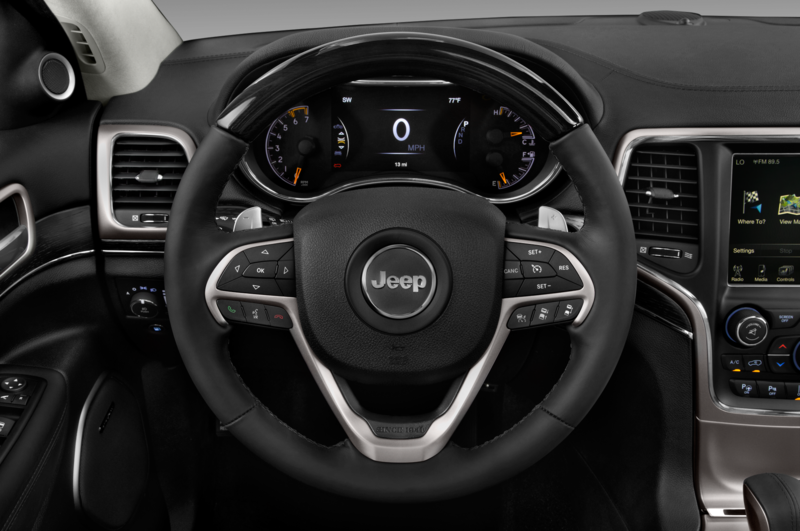 The transmission makes it absolutely unnecessary to use the paddle shifters unless you really want to, as upshifts and downshifts are quick and decisive. 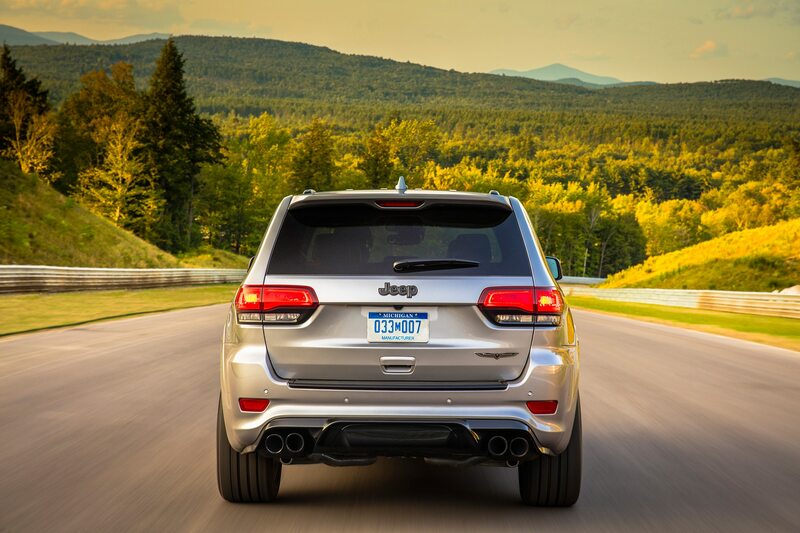 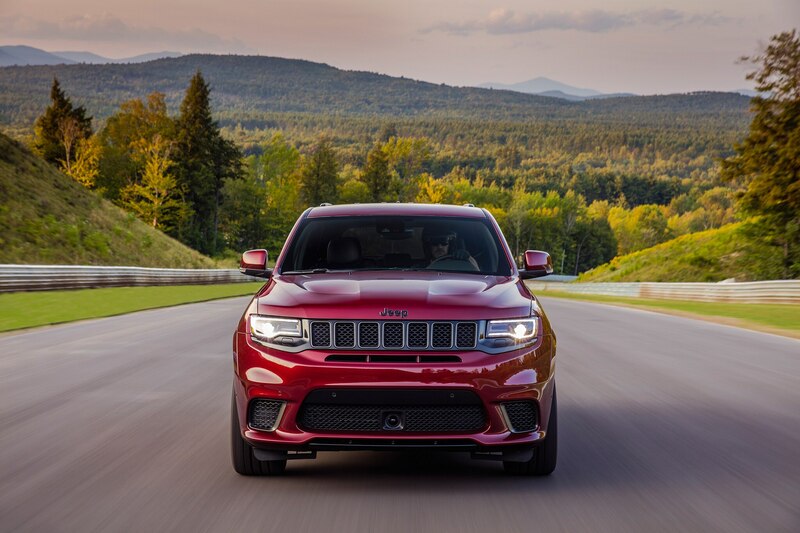 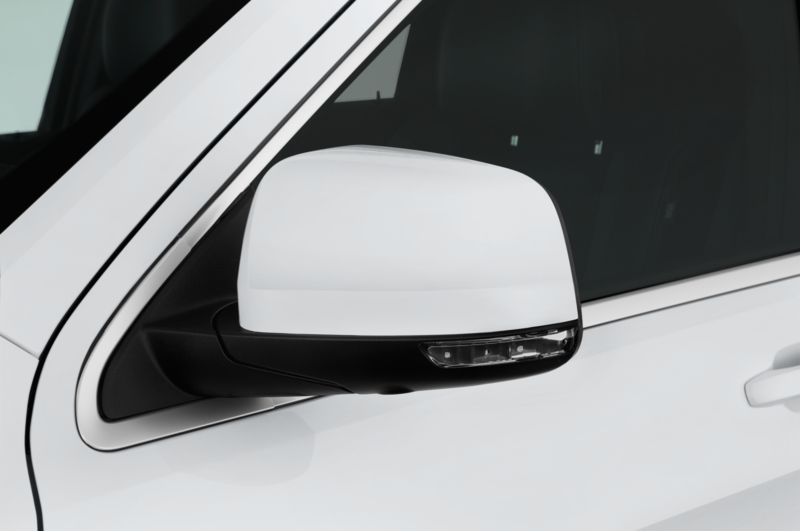 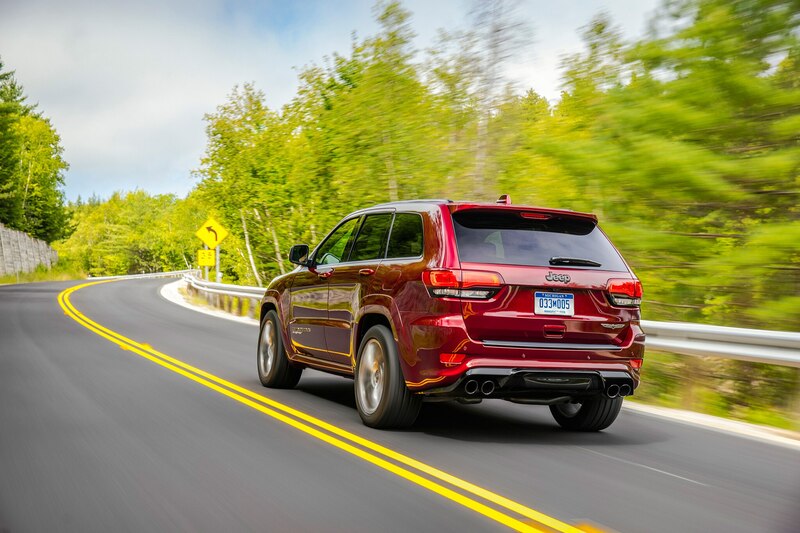 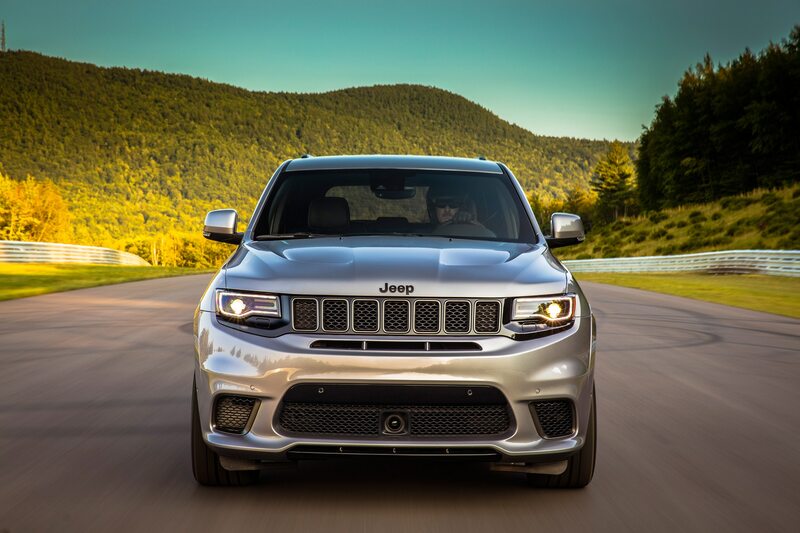 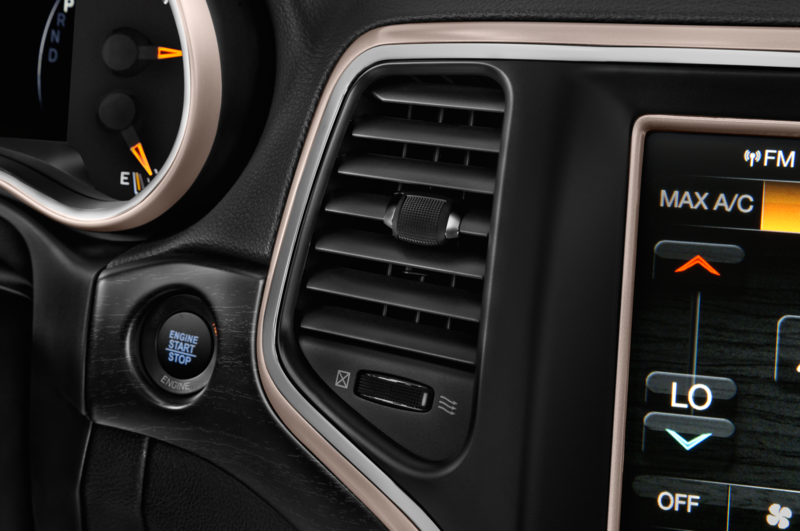 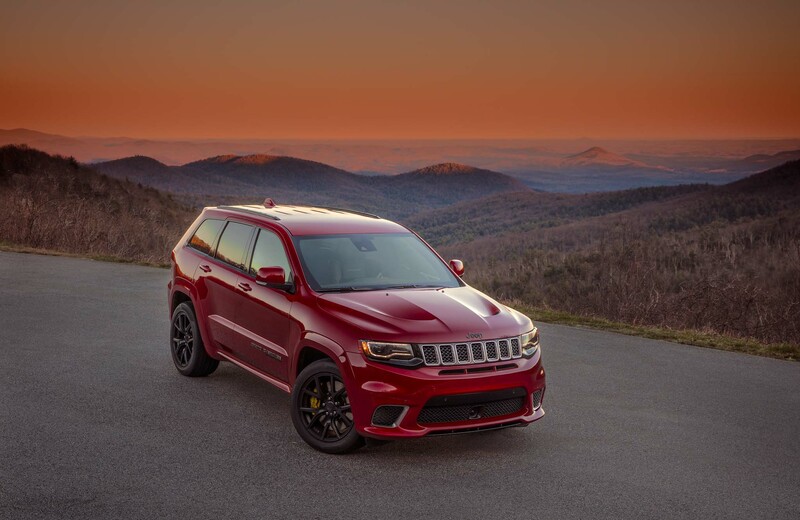 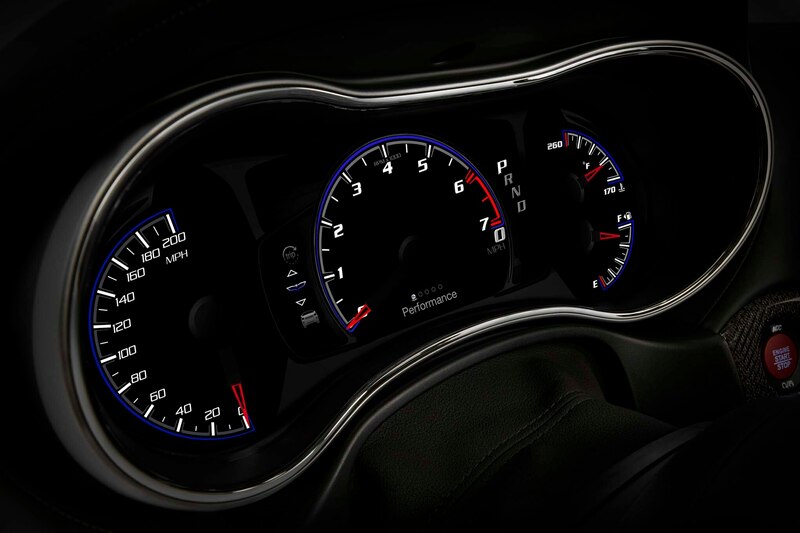 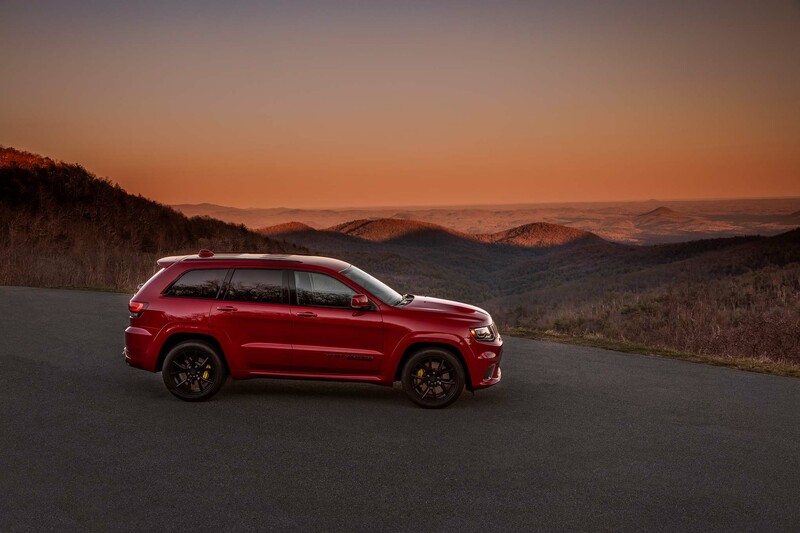 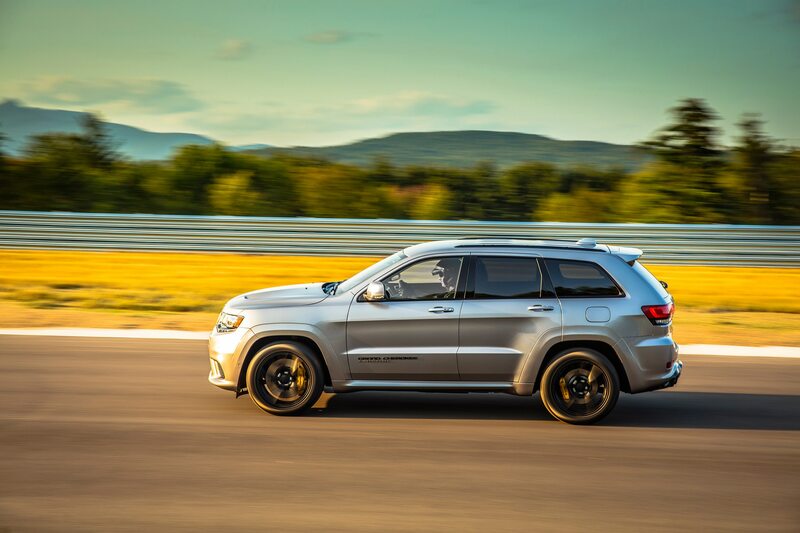 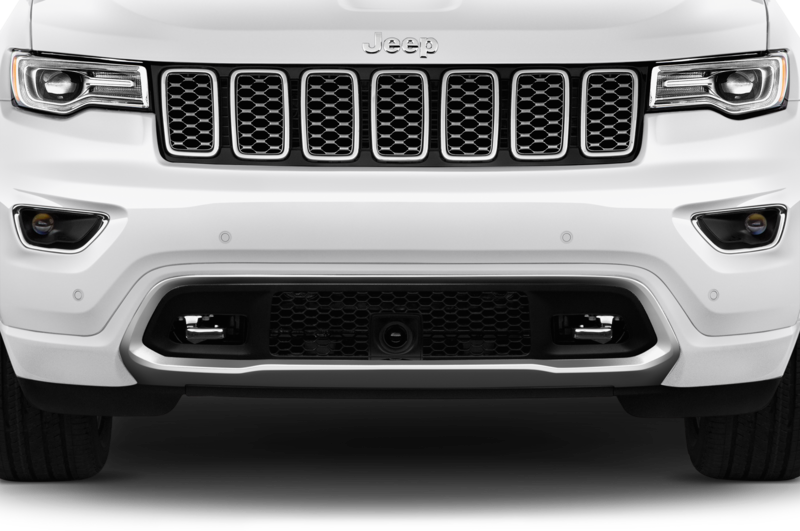 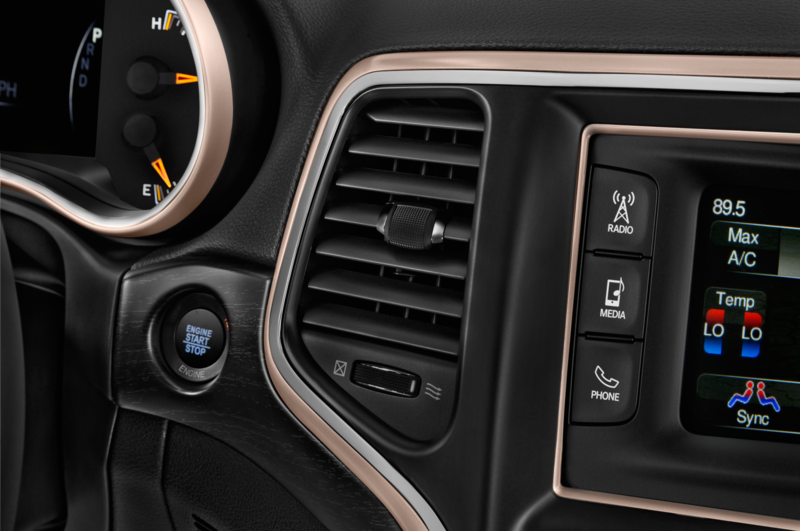 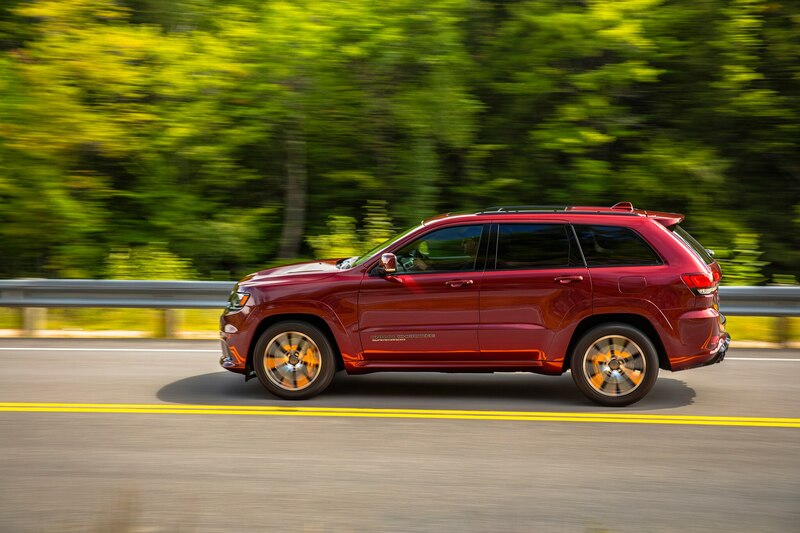 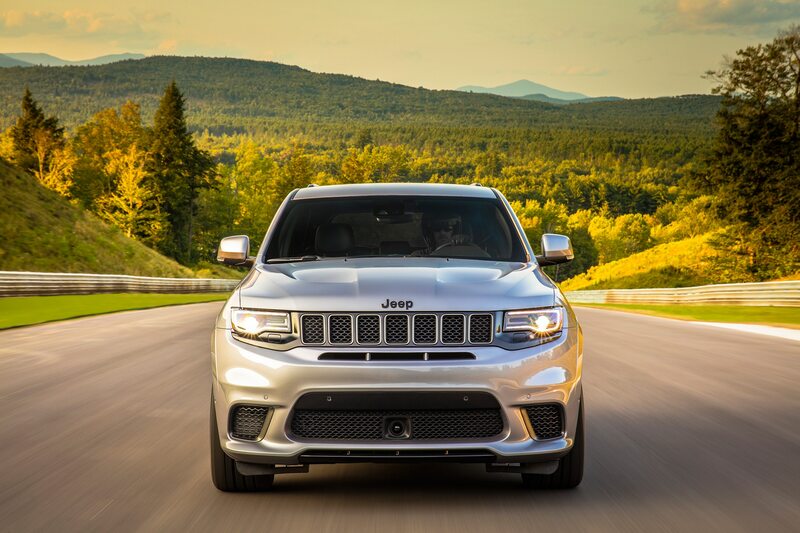 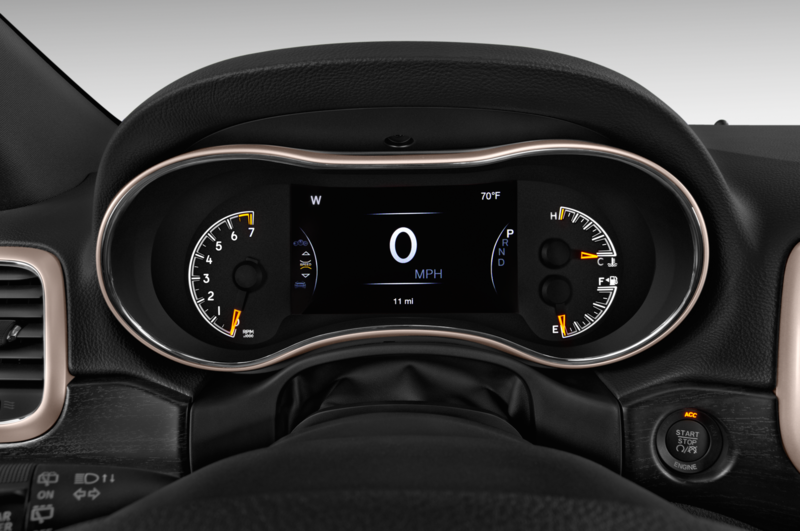 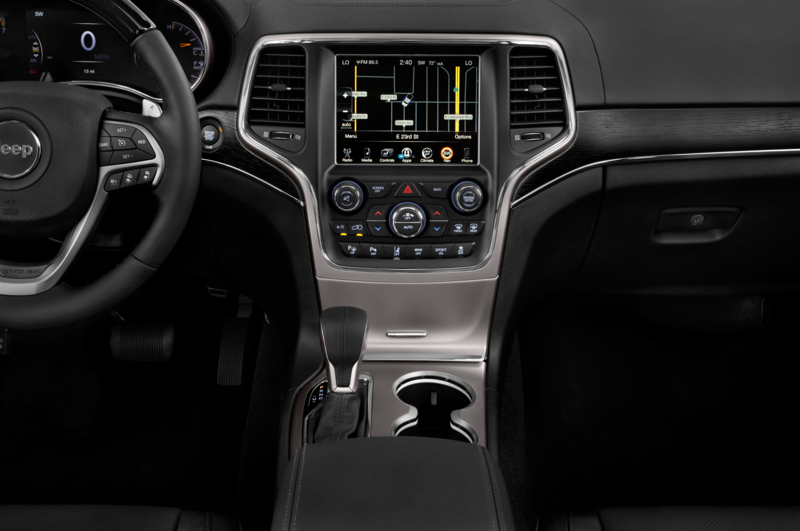 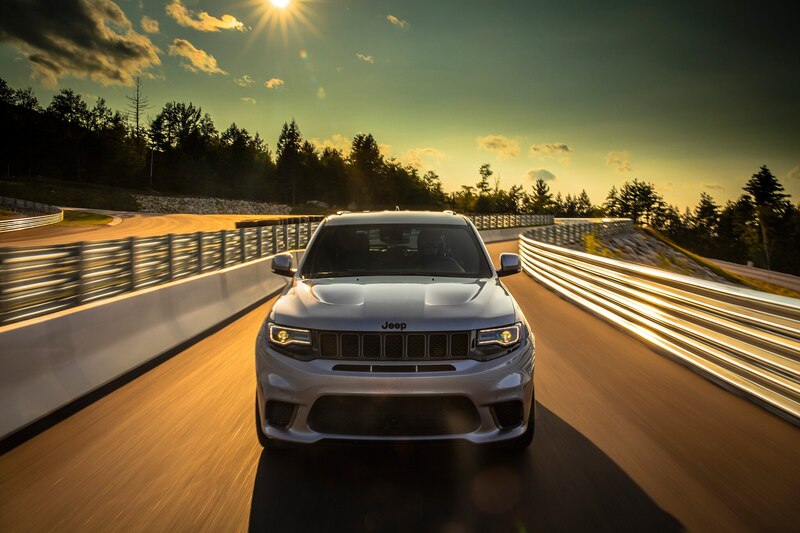 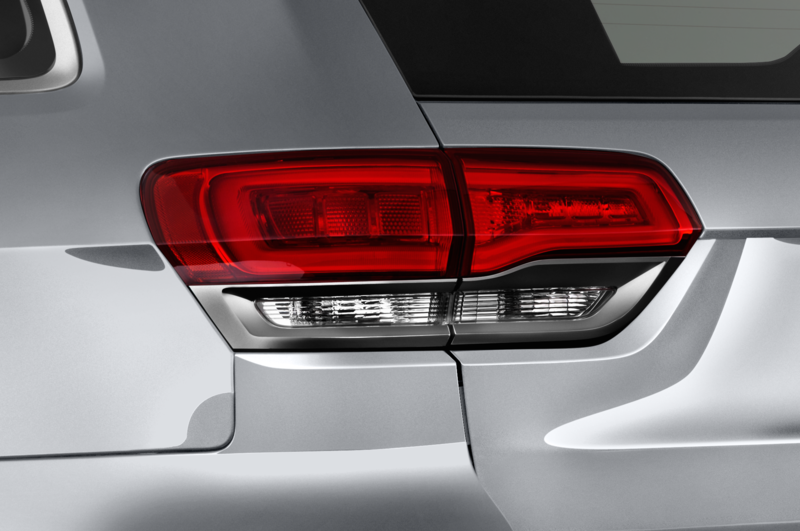 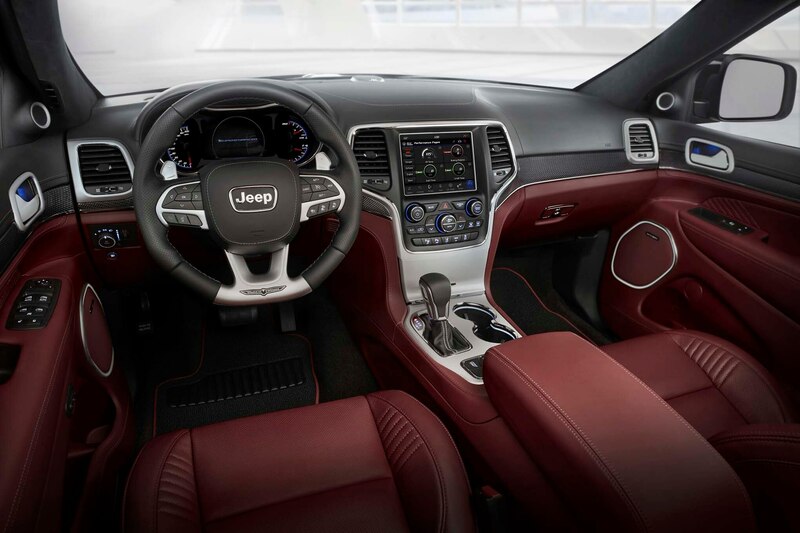 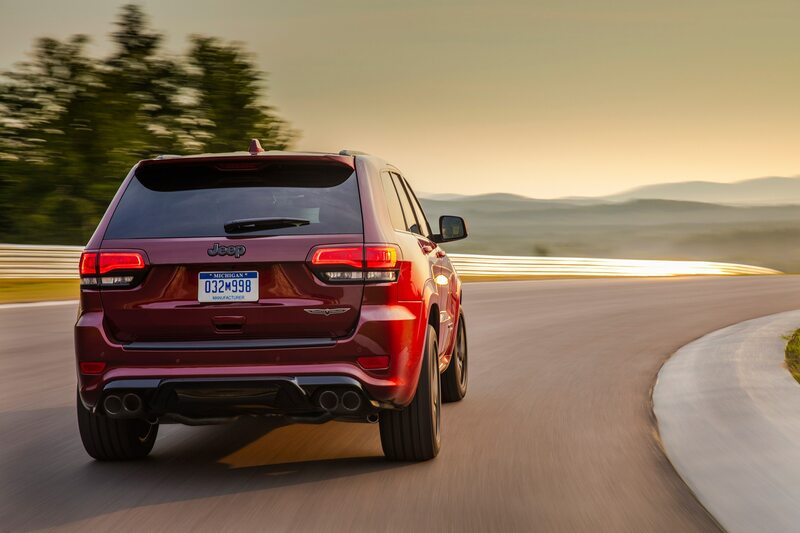 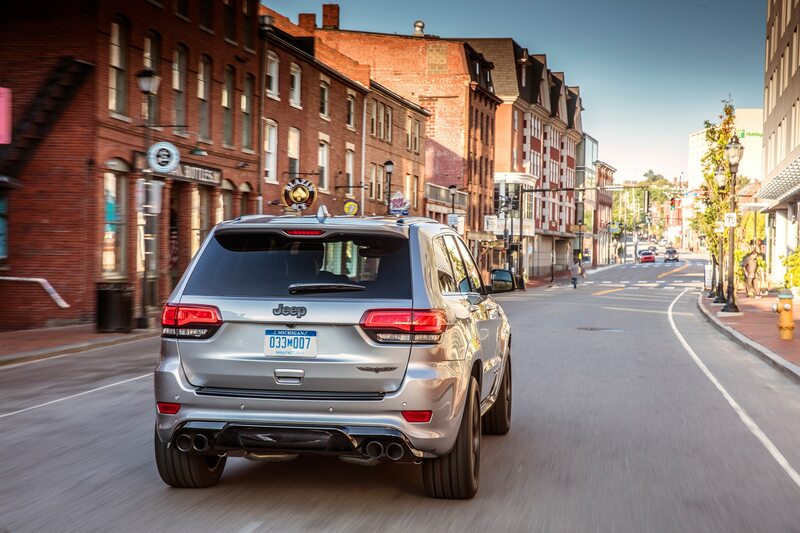 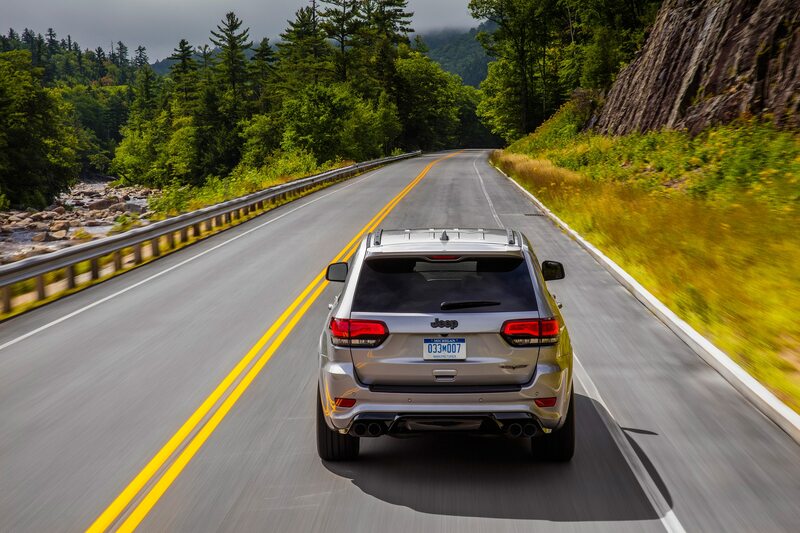 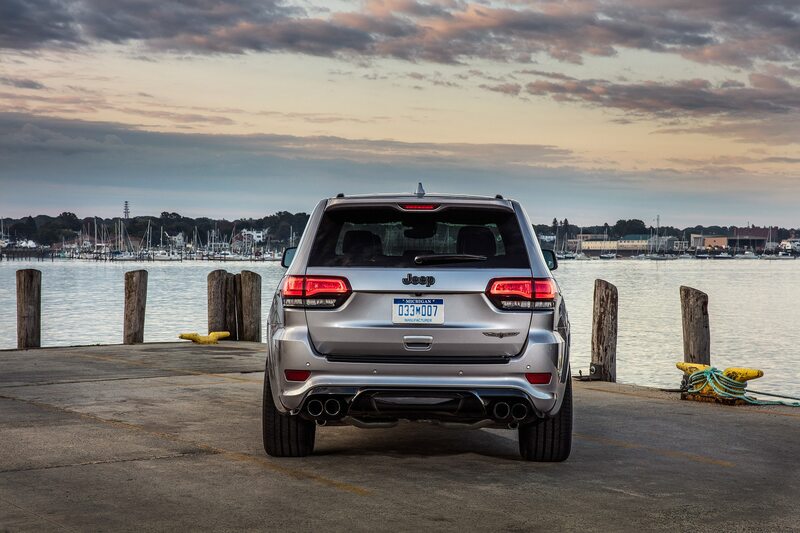 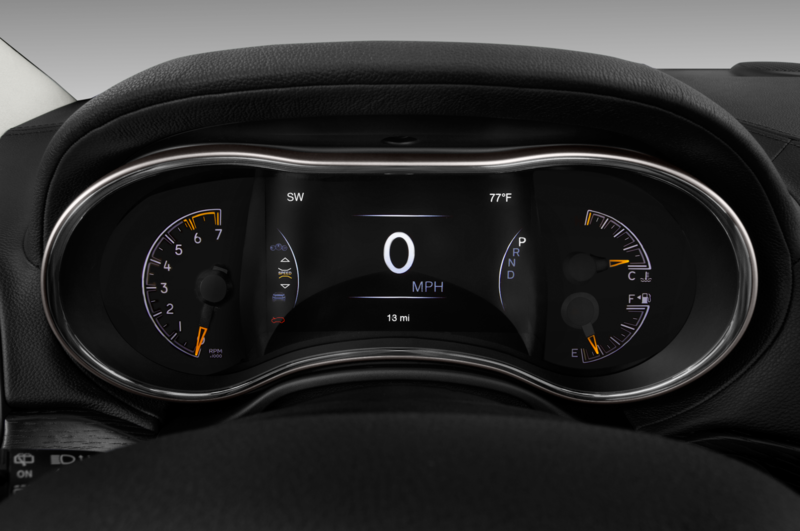 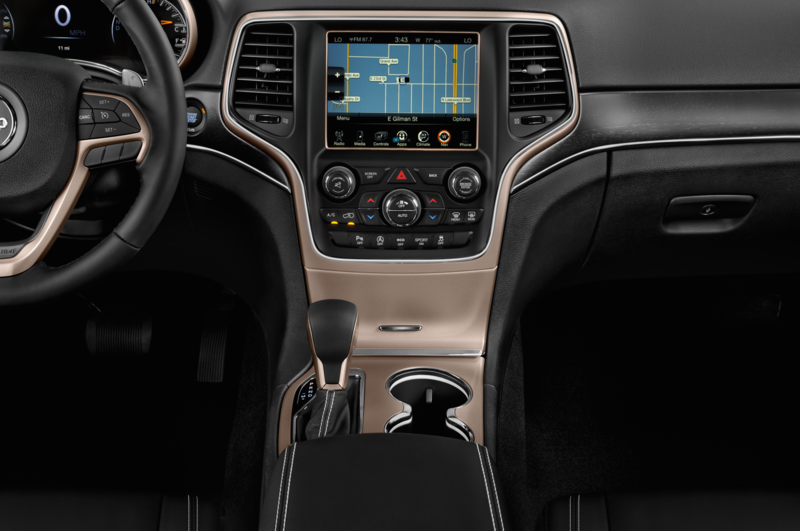 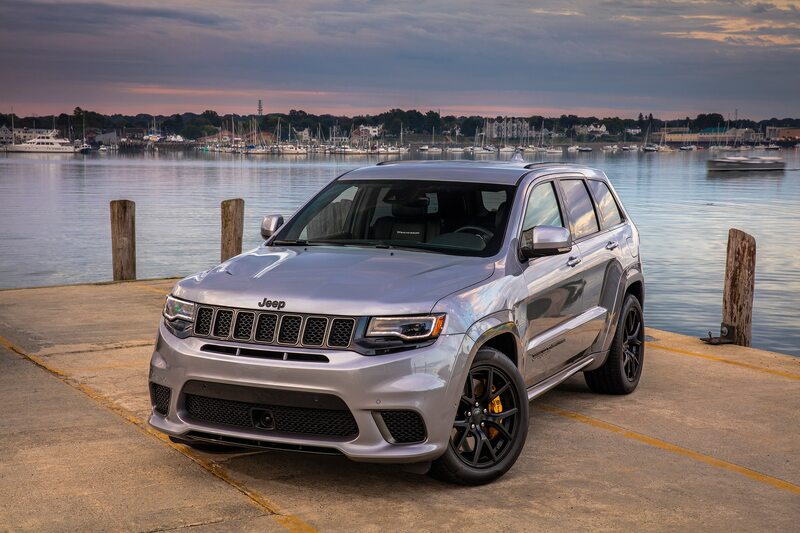 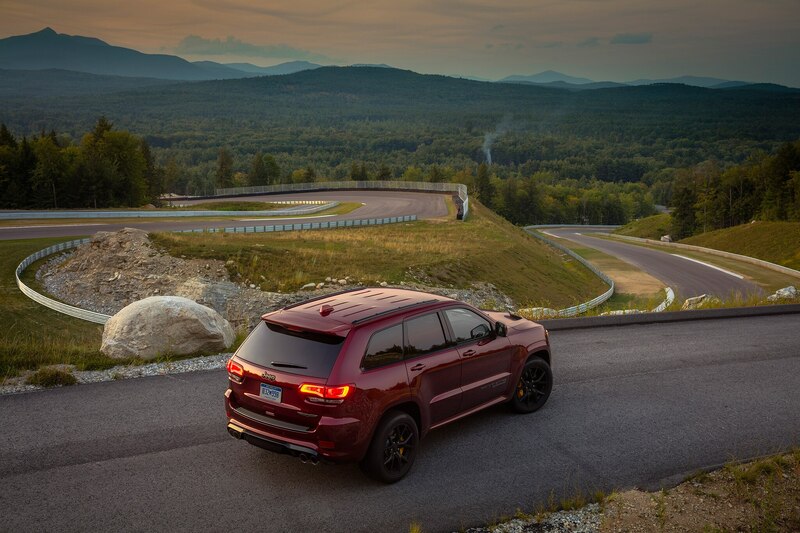 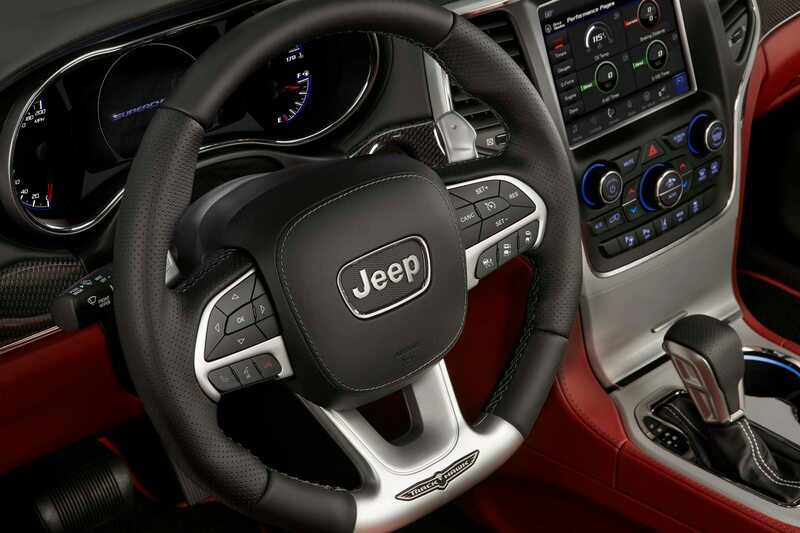 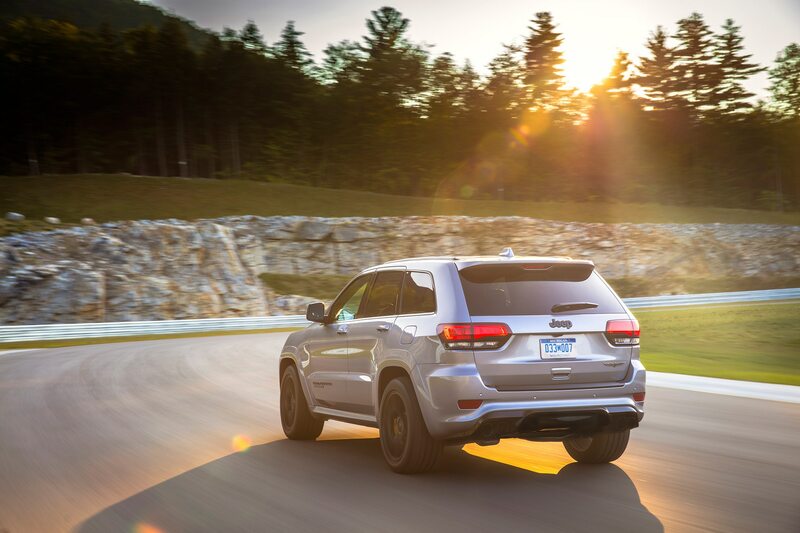 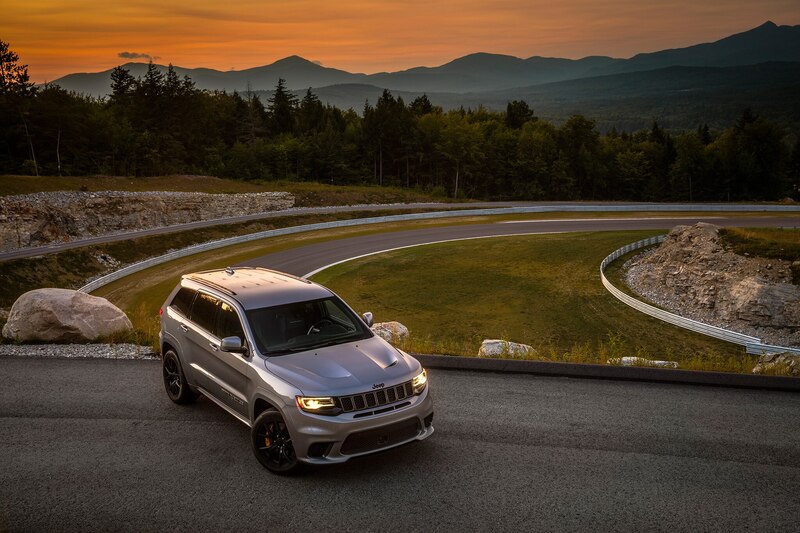 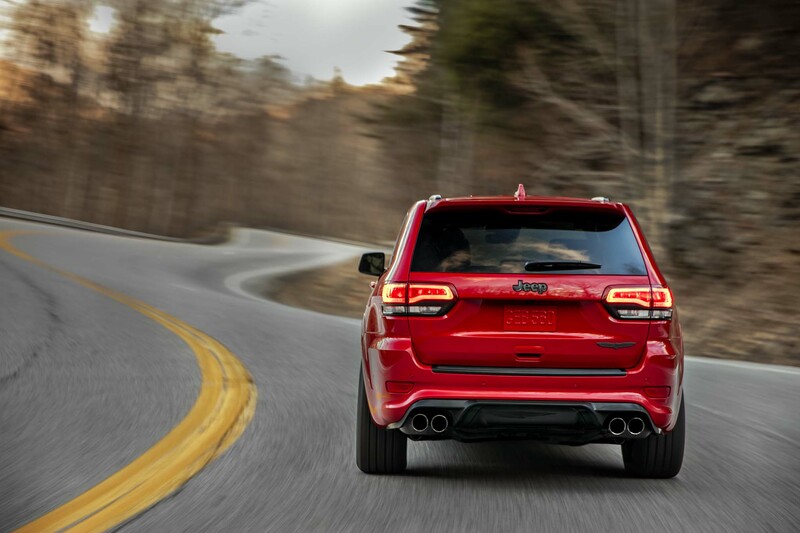 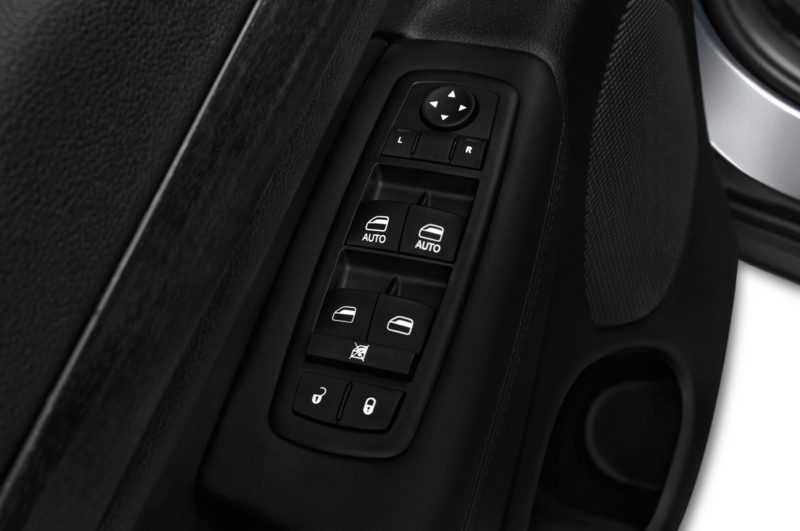 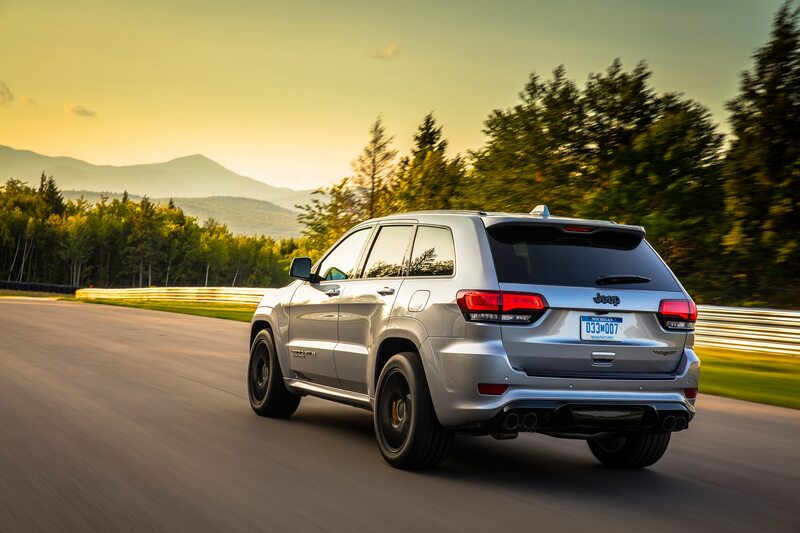 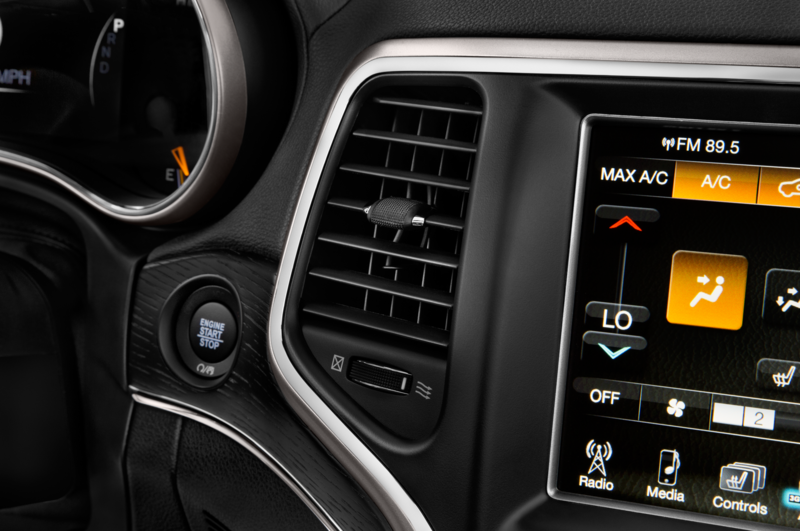 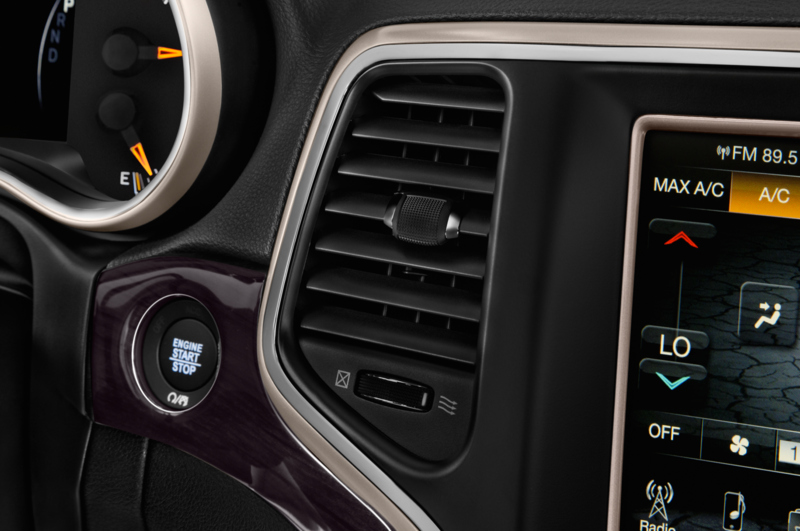 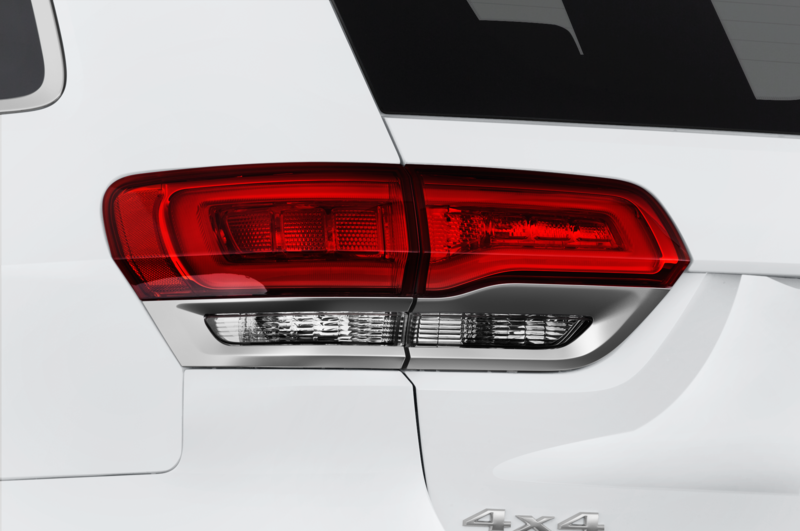 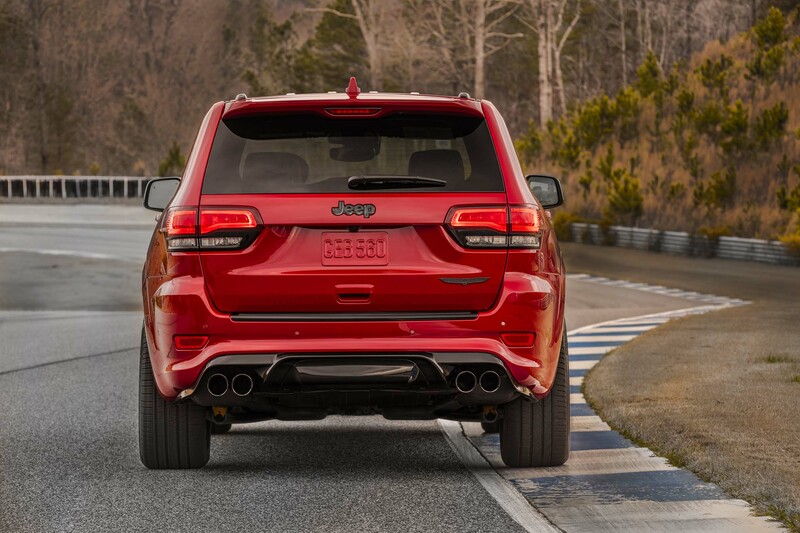 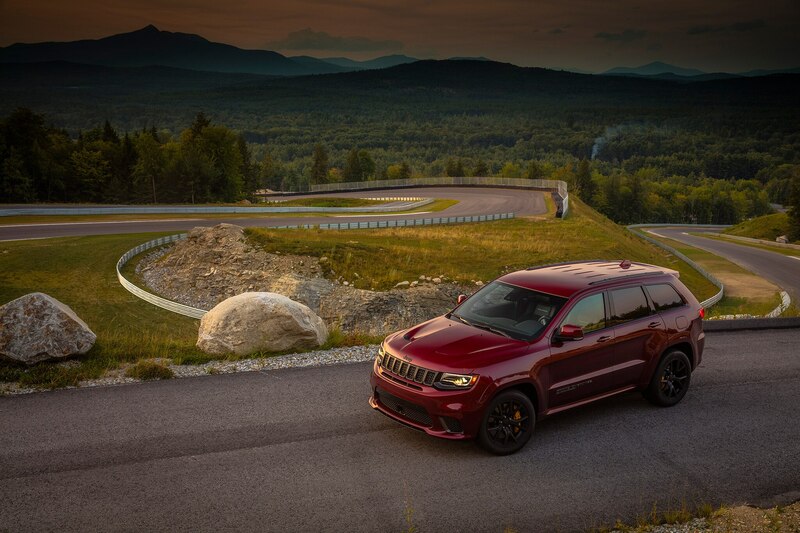 Launch control allows you to leave the starting line—at the dragstrip or a stoplight—at full throttle, and we can attest to the accuracy of Jeep’s claim of a 3.5-second 0-to-60-mph time. 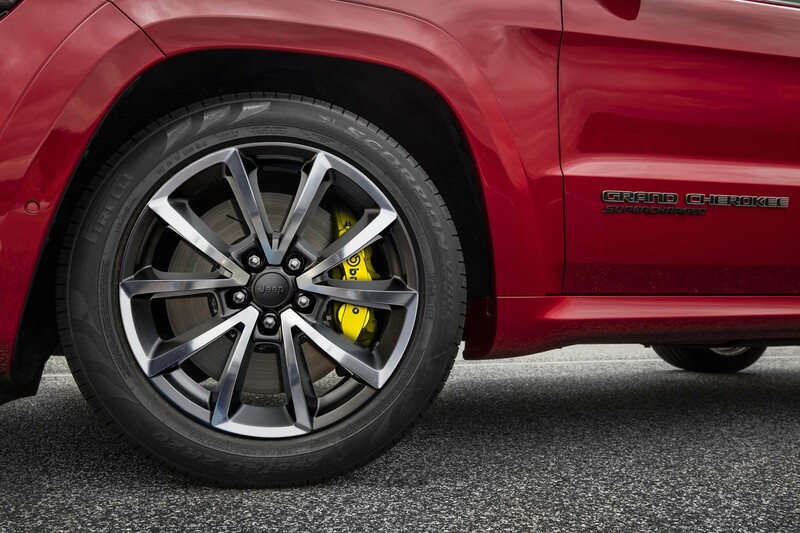 The Trackhawk’s brakes are six-piston Brembos up front, four in back with bright yellow calipers, and are excellent and fade-resistant. 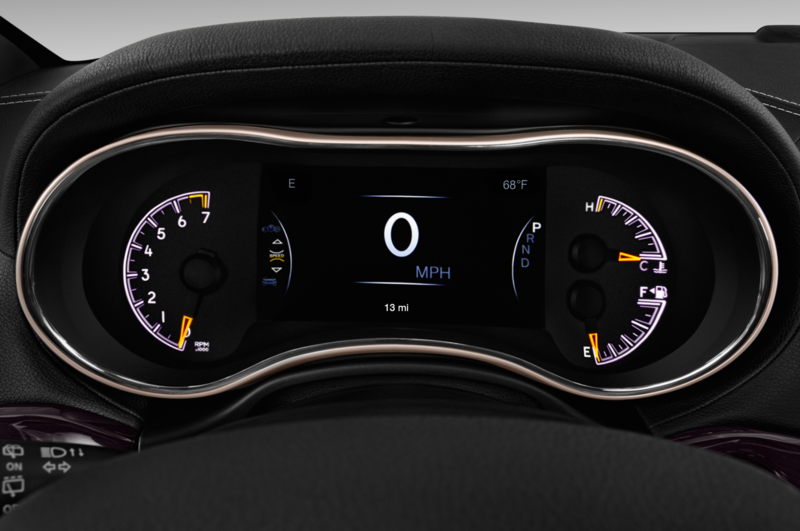 Steering is nicely weighted, with effort dependent on the drive mode. 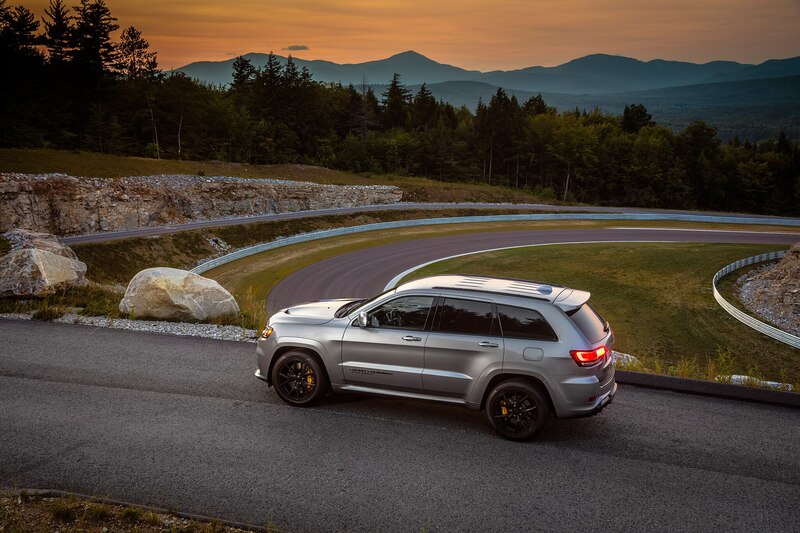 The Trawkhawk is, as you would guess, a rocket in a straight line, but it also turns and stops very well, too. 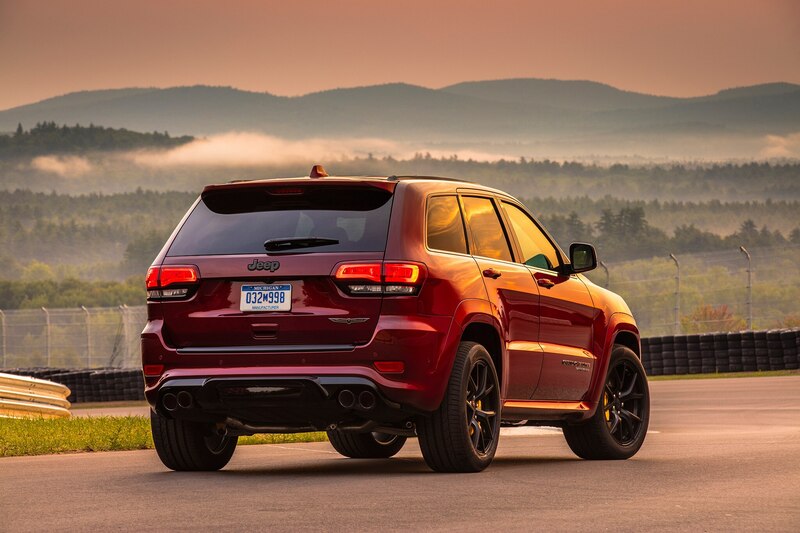 For those of us who, 10 or 15 years ago, were afraid that by now we’d be sentenced to life behind the wheel of a four-cylinder hybrid, the Trackhawk in particular—and all the SRT products in general—means that life just might be worth living, if you can afford the price. 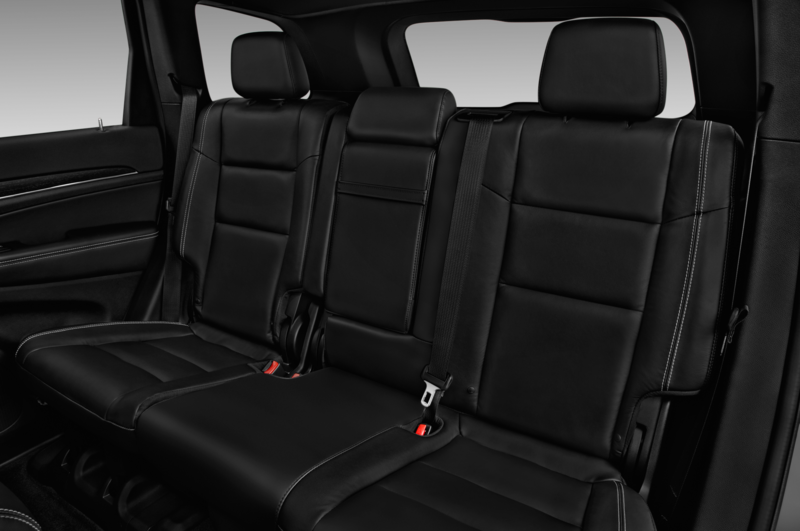 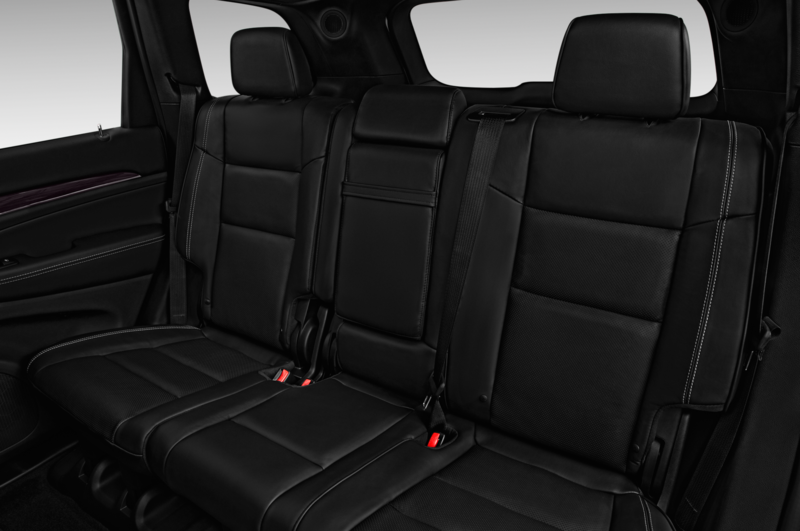 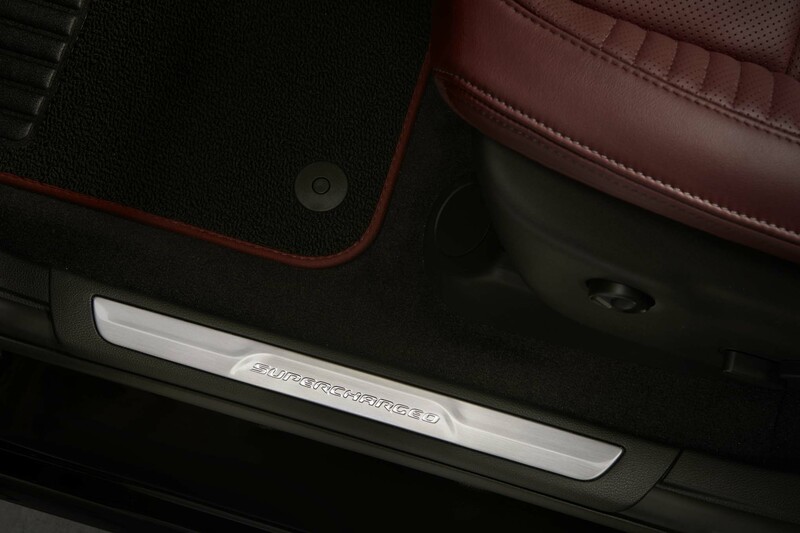 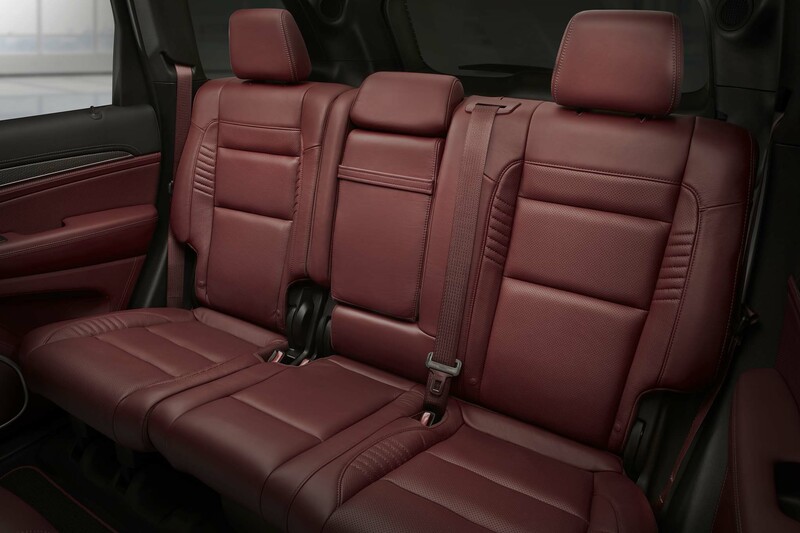 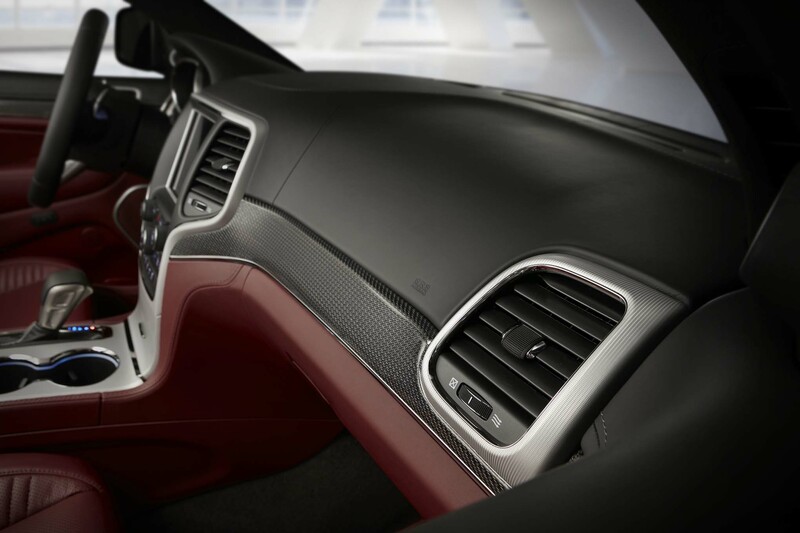 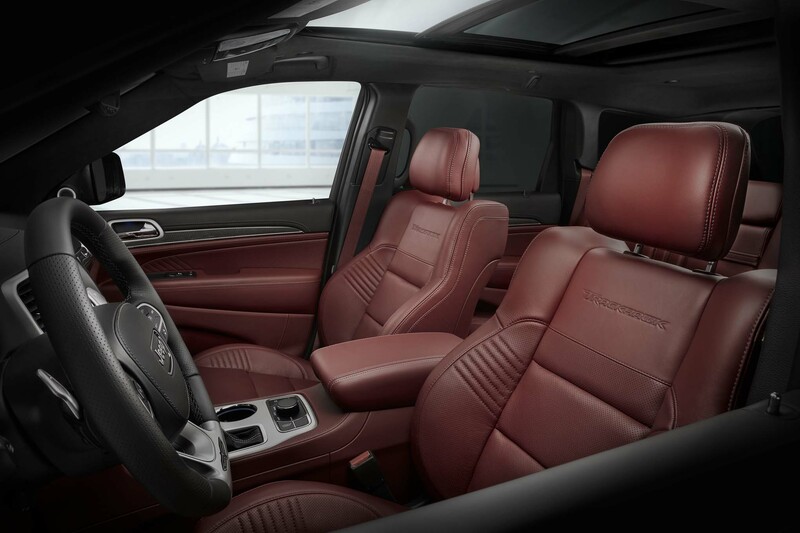 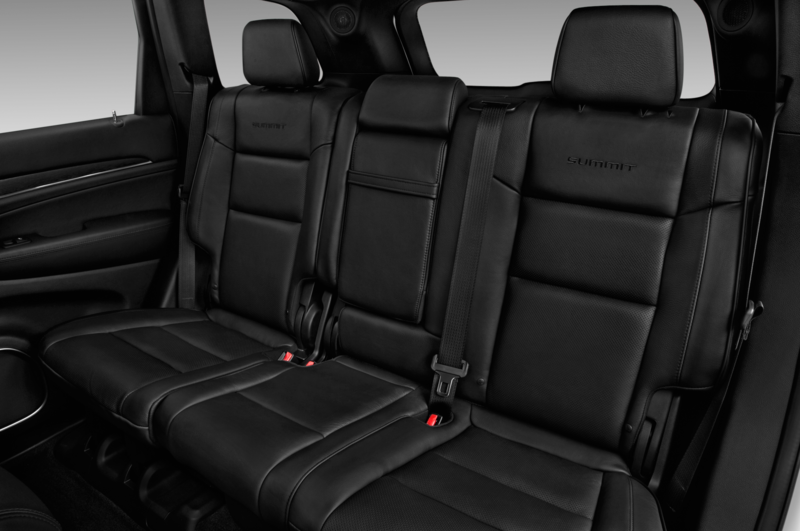 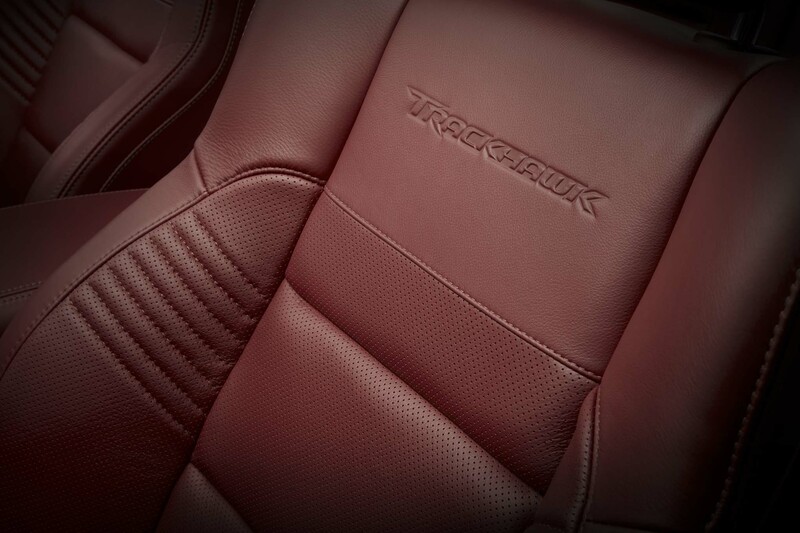 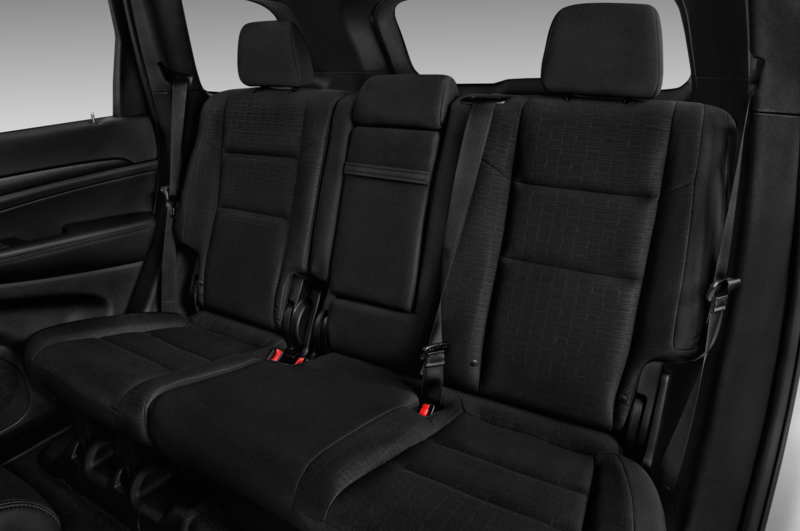 The Trackhawk seats four comfortably, five very nearly so. 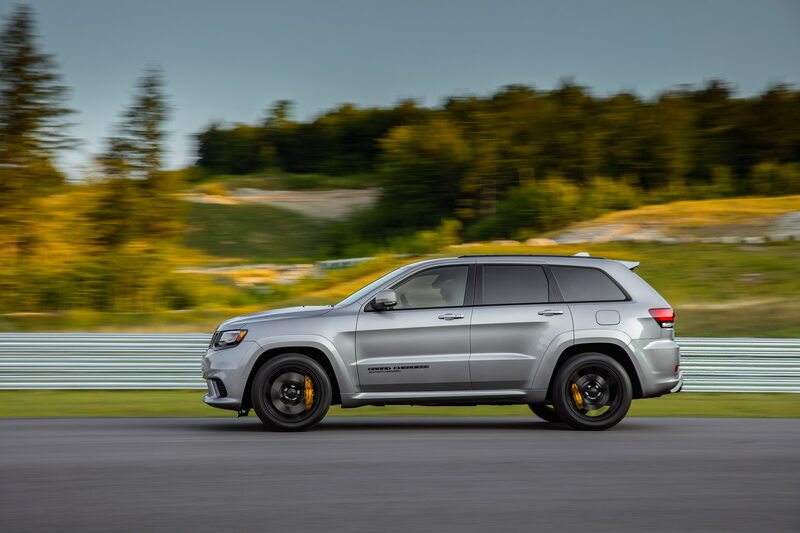 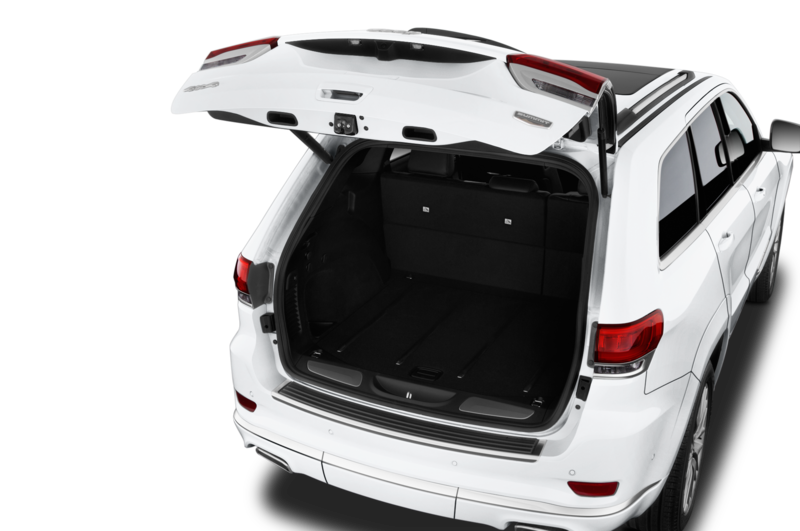 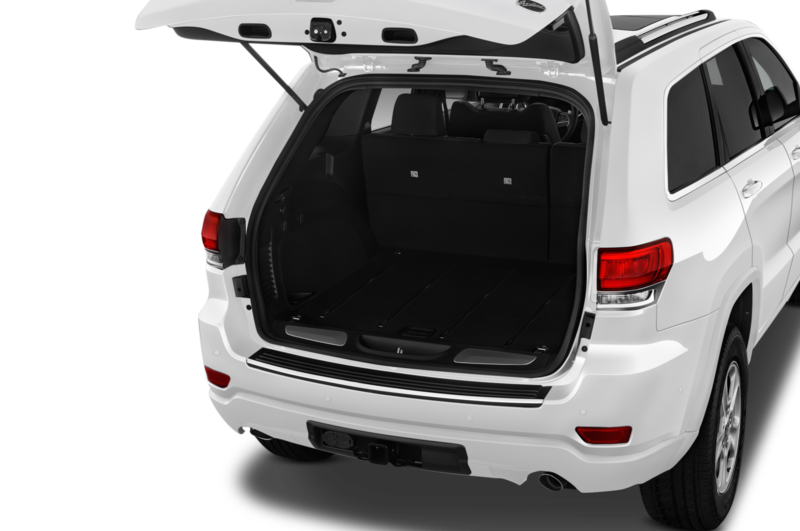 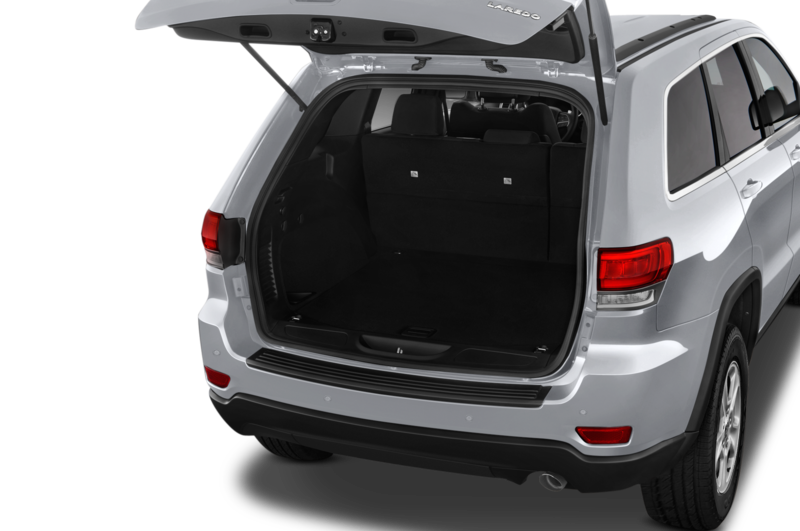 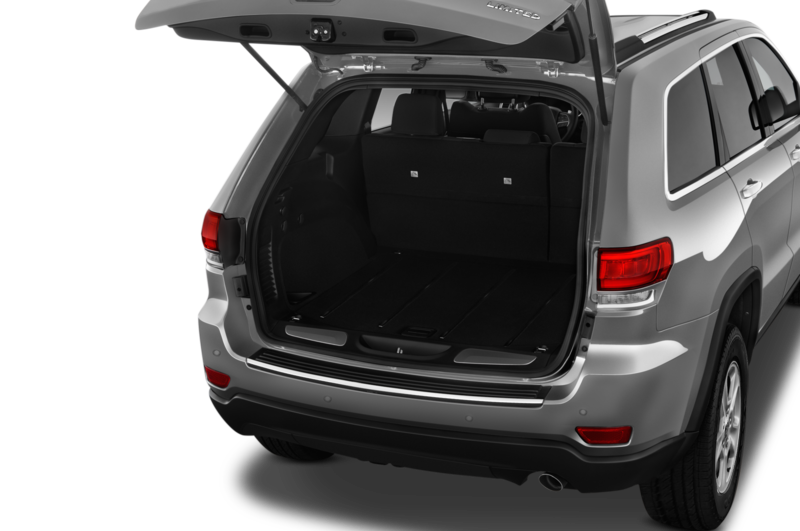 It can tow almost anything you want, has 36.3 cubic feet of luggage space in the rear, will happily carpool on weekdays, and entertain you on weekends at the racetrack if you actually go there. 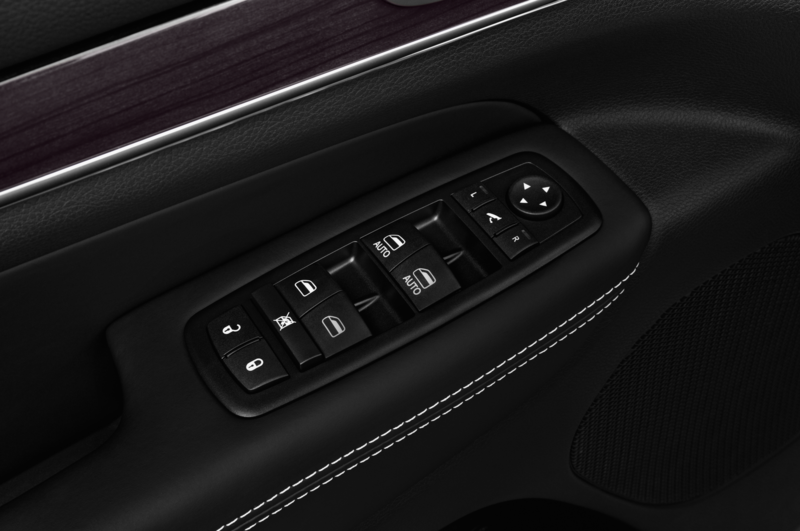 The ultimate Swiss Army Knife will be available at a dealer near you within a couple of months.